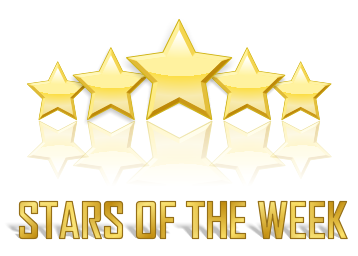 Thank you for visiting our page. 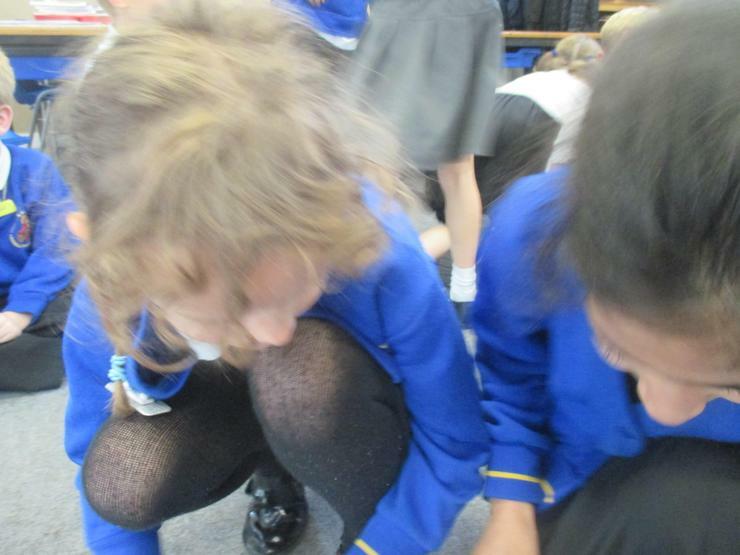 It is full of all the interesting and exciting things we get up to every day. 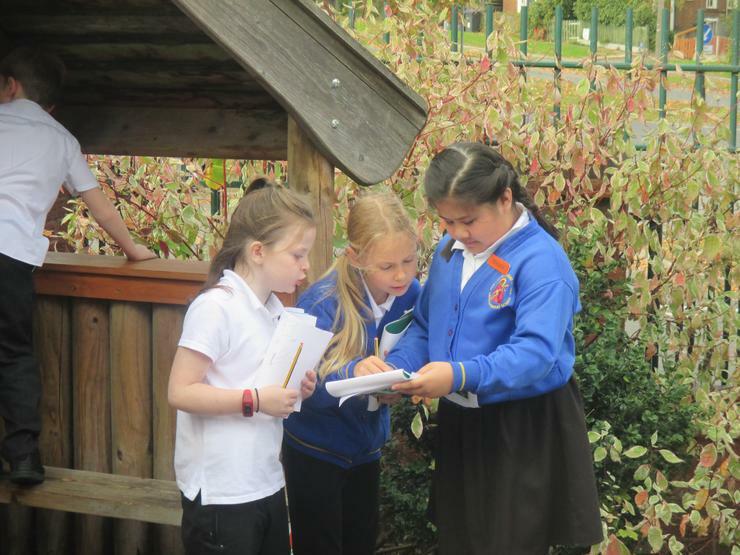 It will also keep you updated with important notices and information, so please check back often! 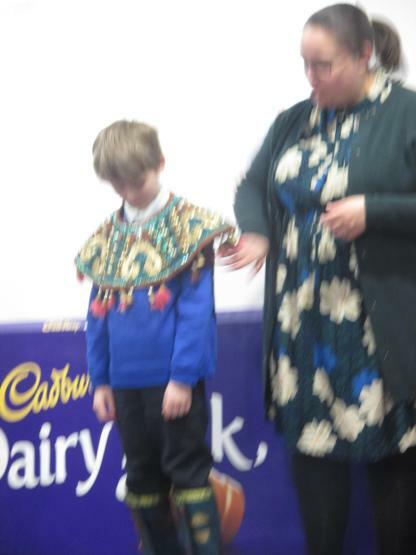 Every week we will celebrate a member of the class who has truly shone and deserves special recognition for doing so. 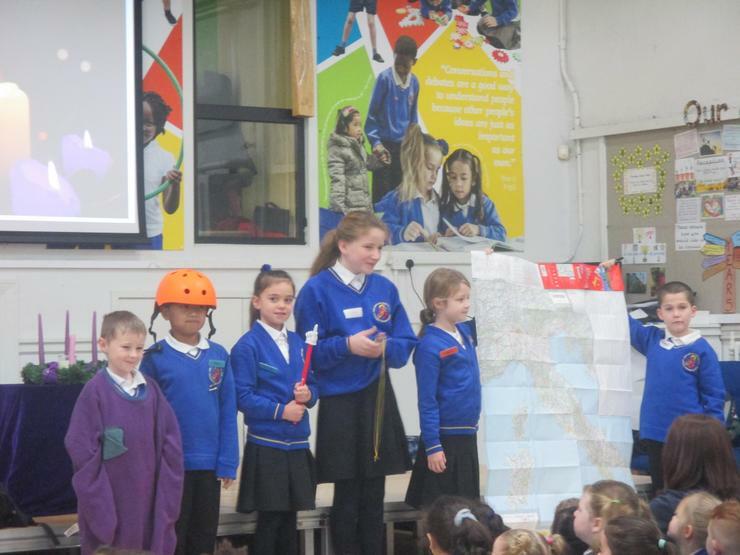 Max, Mikaela, Michael, Mollie, Aldin, Giacomo, Lucie. 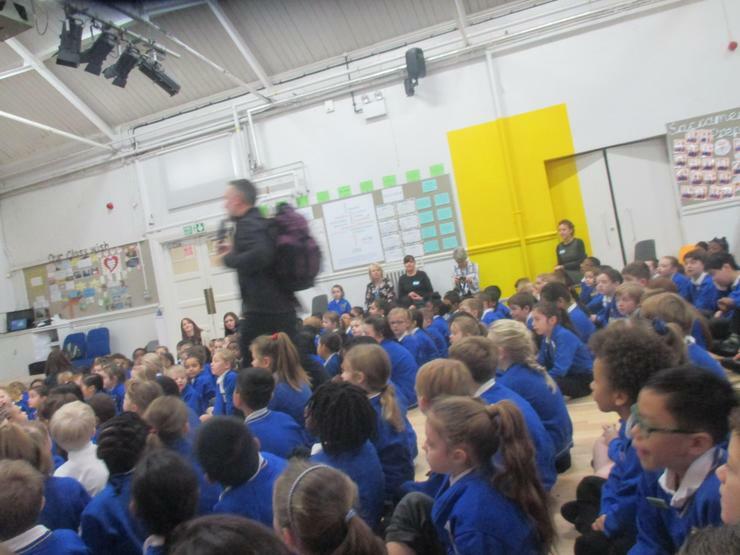 We have talked about how important a fresh start can be and that we must always look to the future. 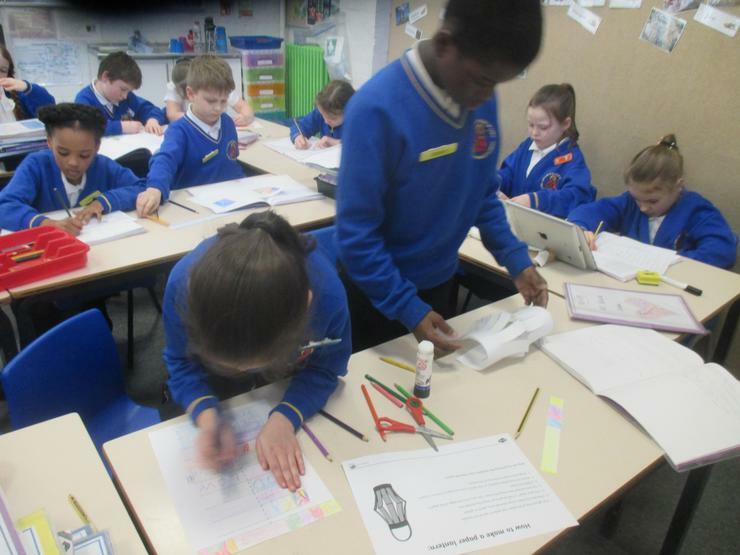 We created some artwork by looking at ourselves in a mirror and imagining all the amazing things we can achieve by striving to be the best version of ourselves. 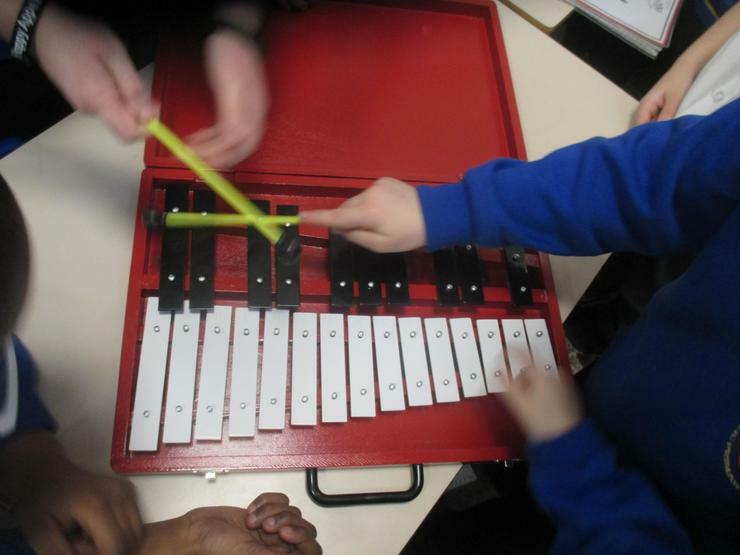 Stay tunes to see which children have proven to be showing the best version of themselves and their true capabilities. 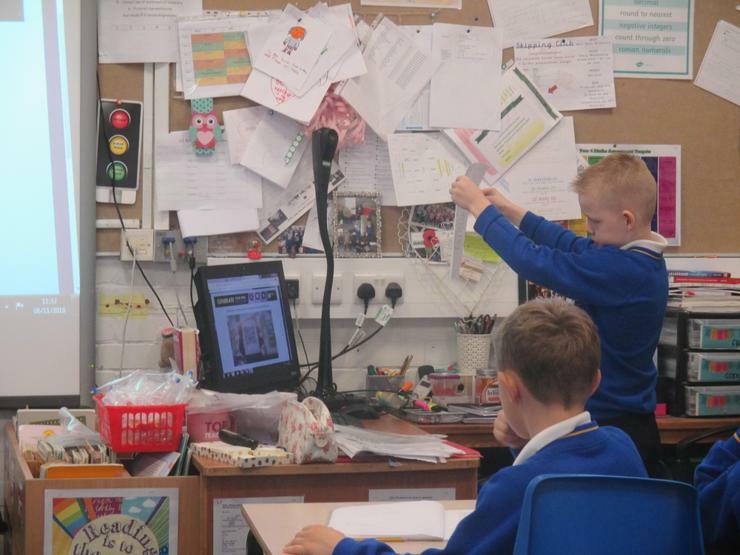 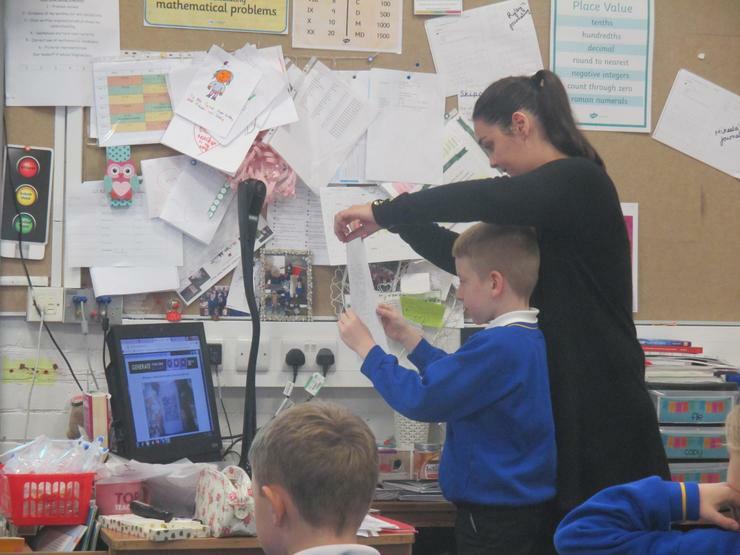 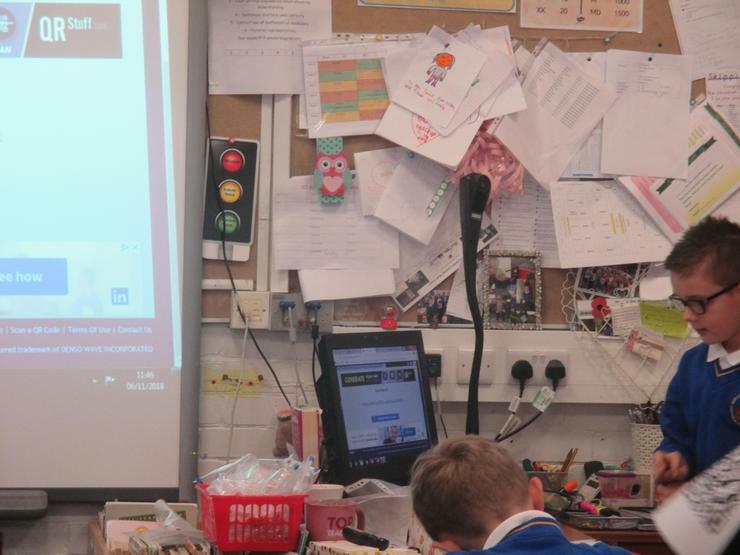 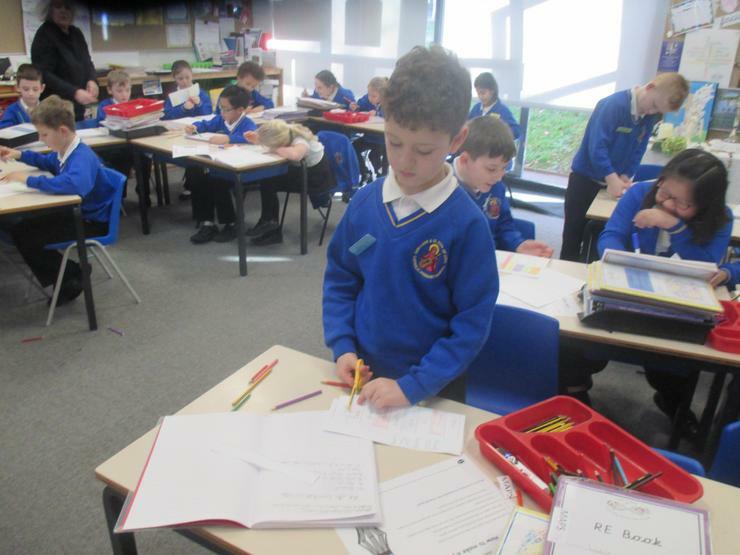 Since the start of this year, Freddie's teachers have all commented on how well he is applying himself in all lessons, he is engaged in his learning, avoiding distractions and doing really well because of this. 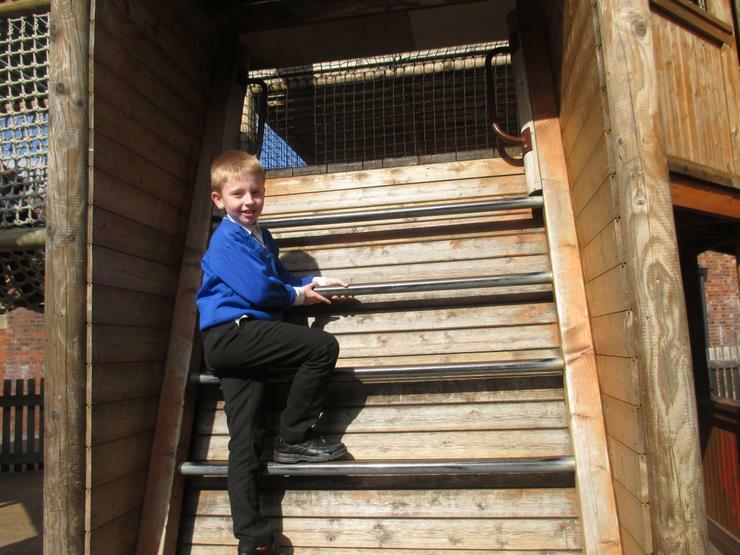 Freddie has also grown in confidence and is keen to share his outside interests and talk politely with his peers and adults. 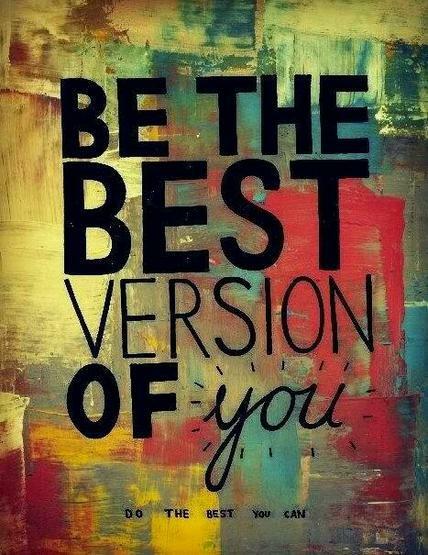 It is wonderful to see Freddie being the best version of himself and such a good example of this to others. 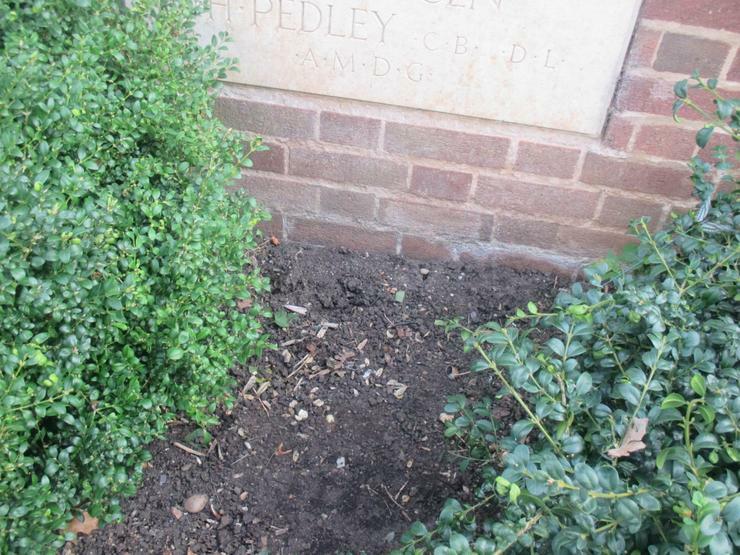 Well done Freddie! 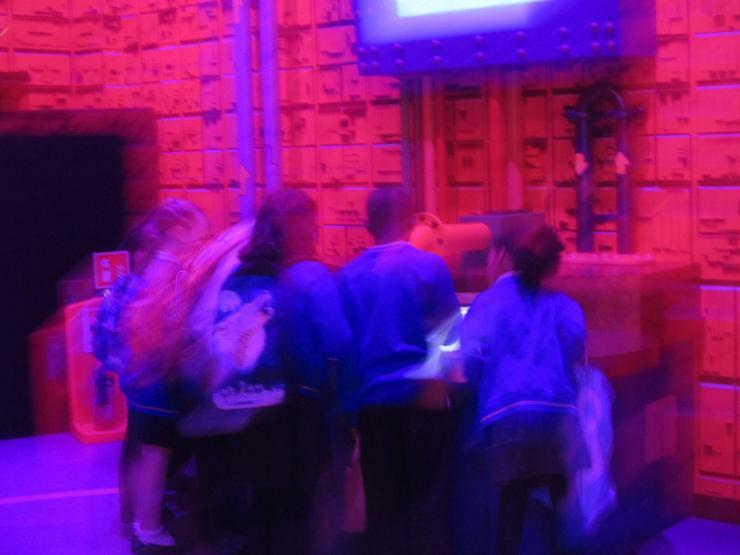 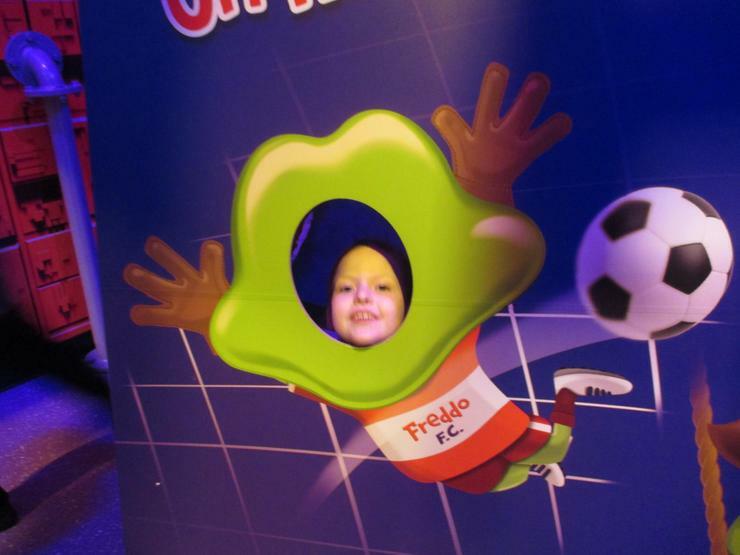 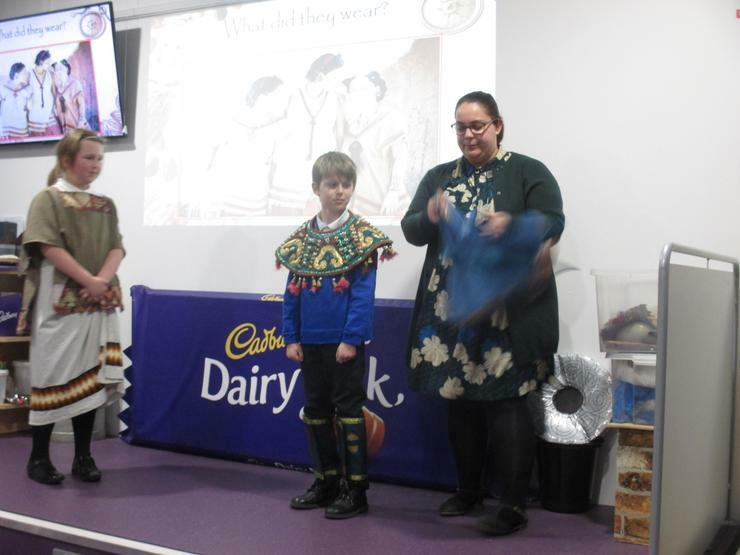 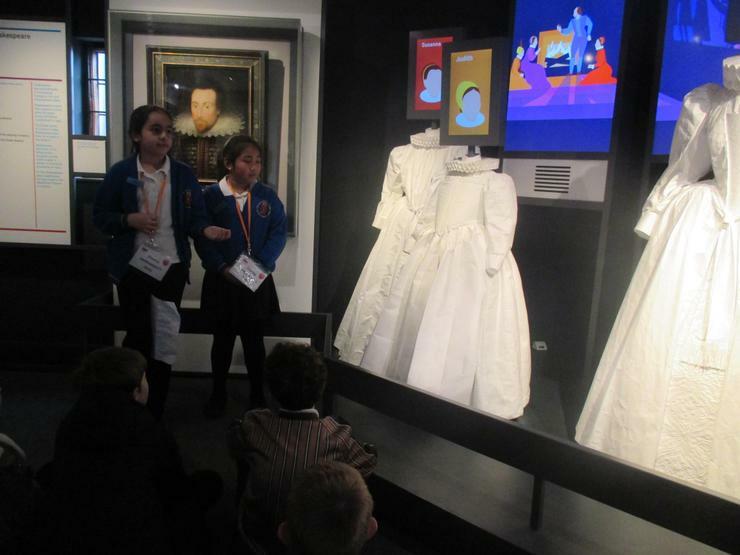 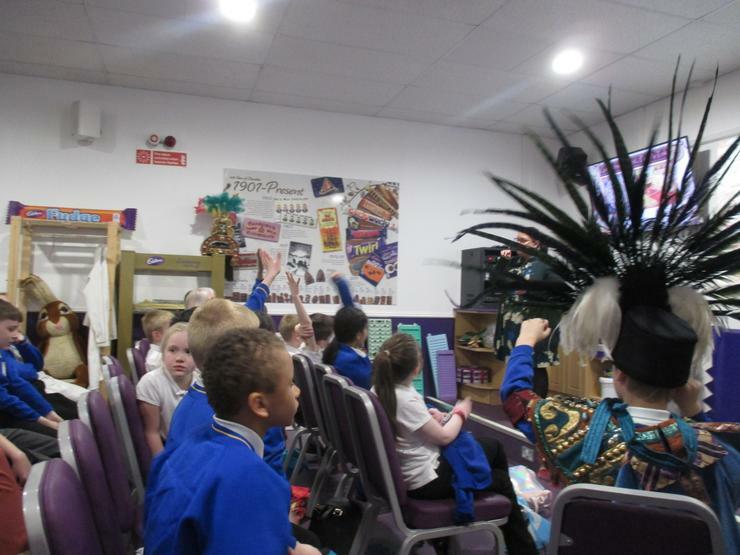 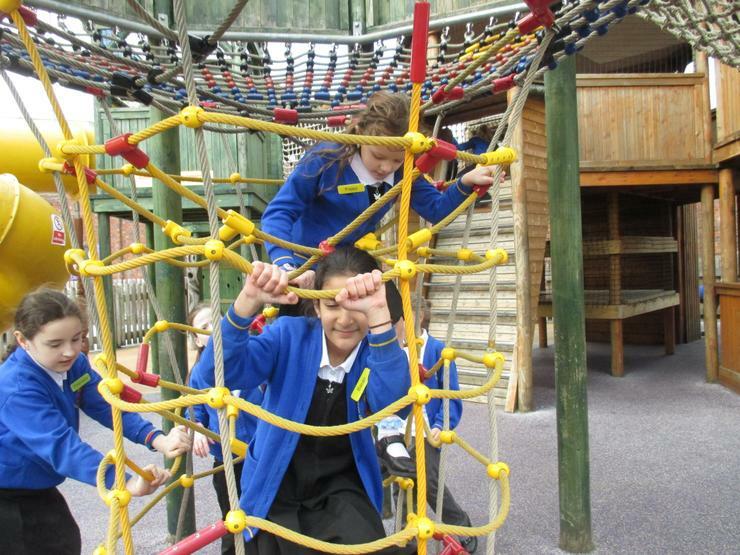 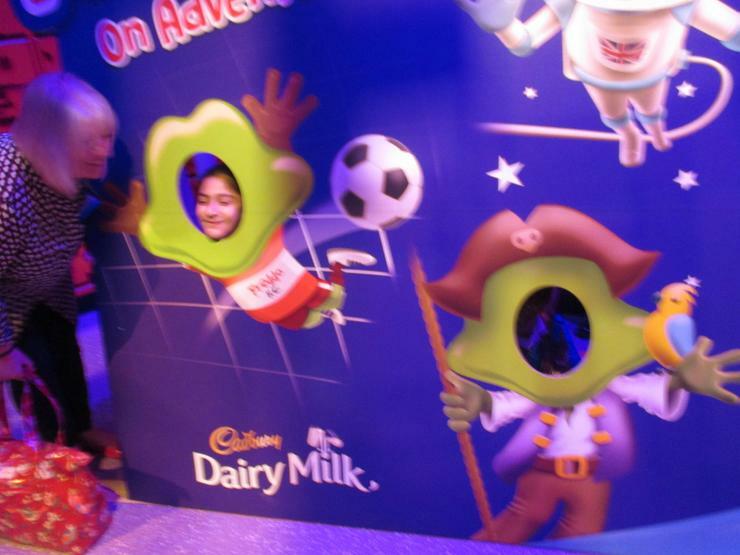 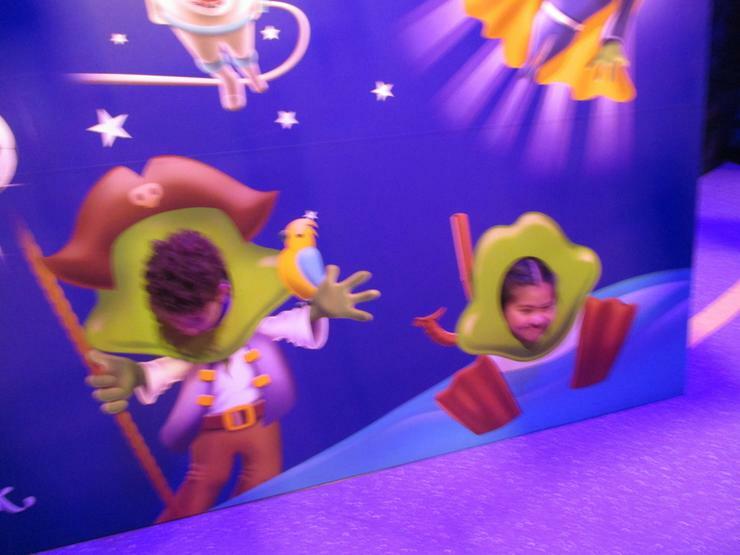 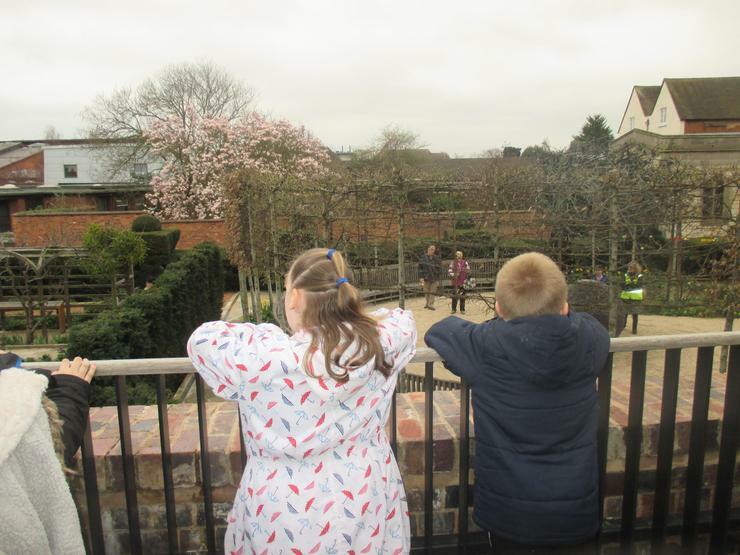 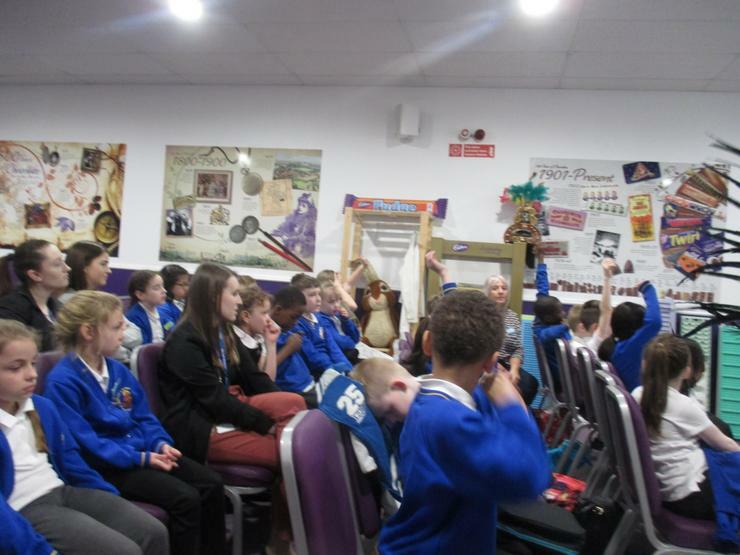 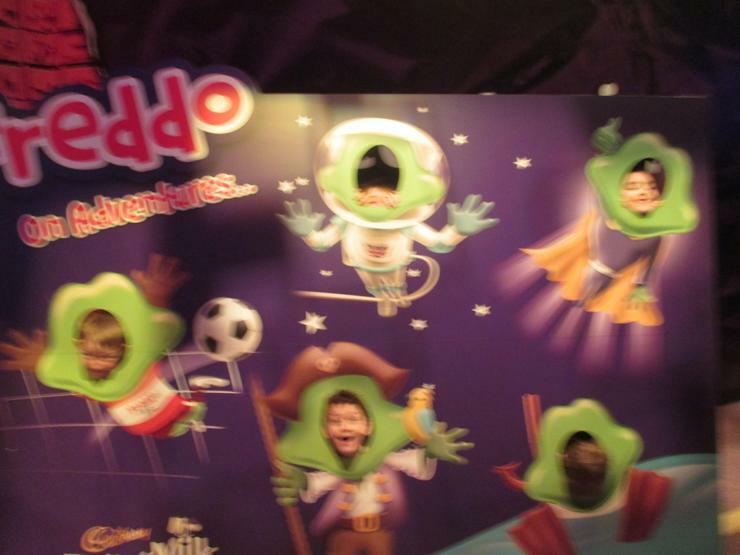 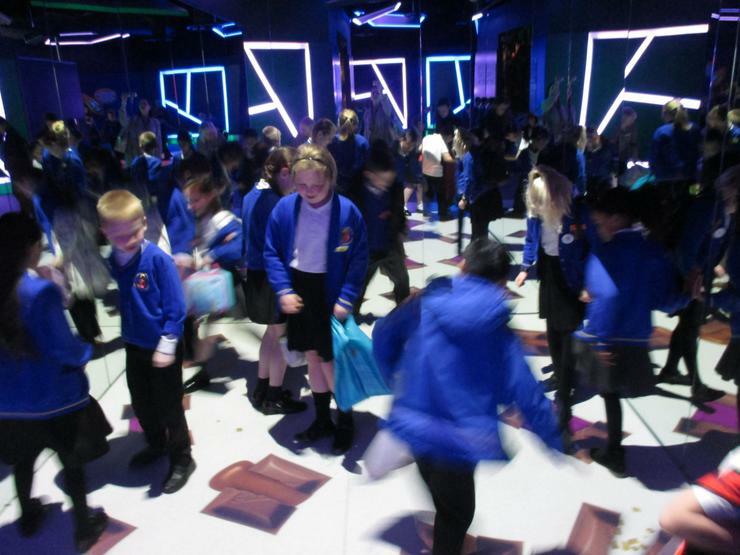 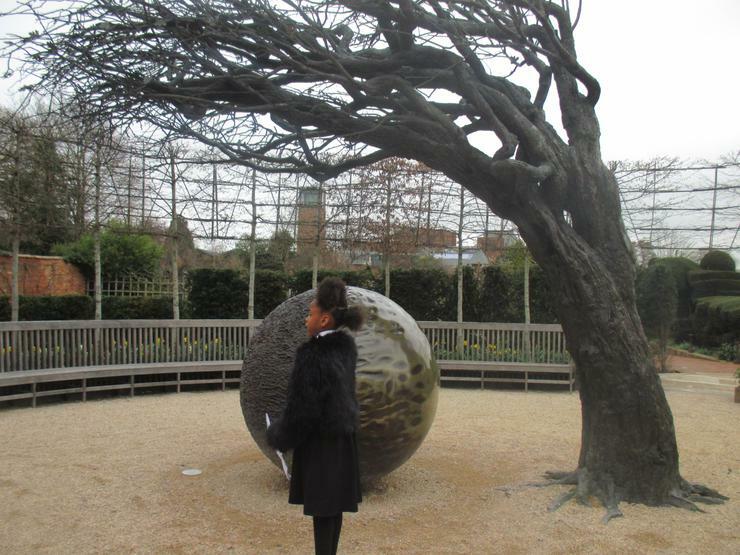 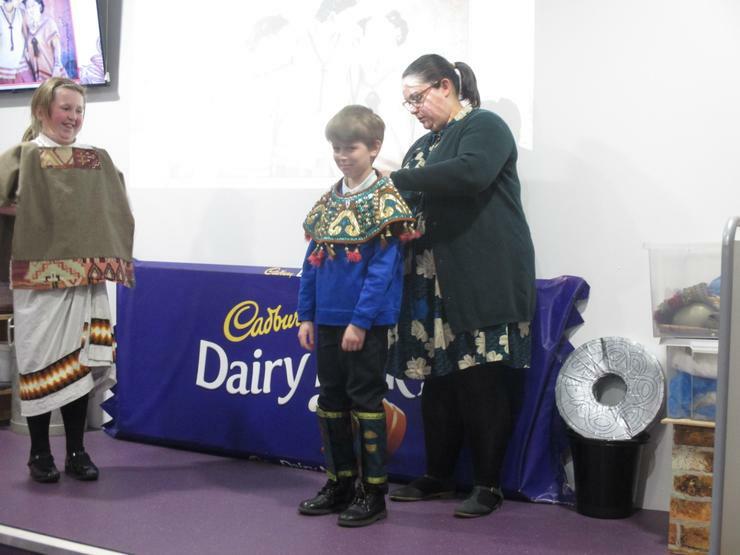 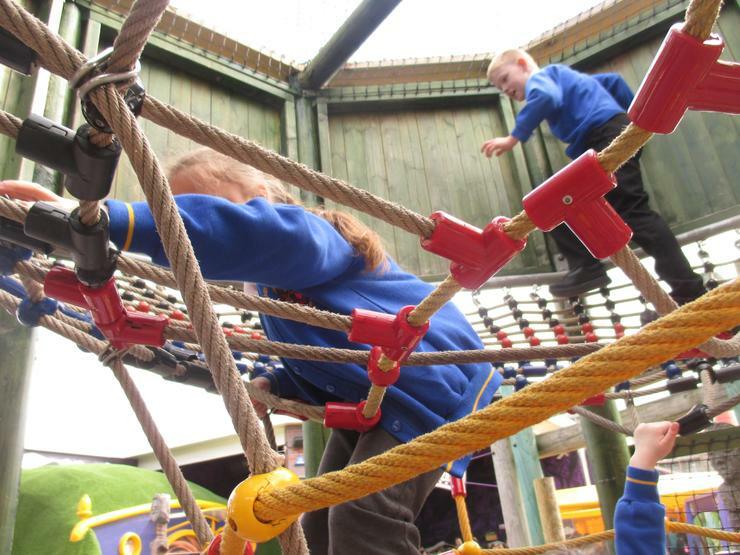 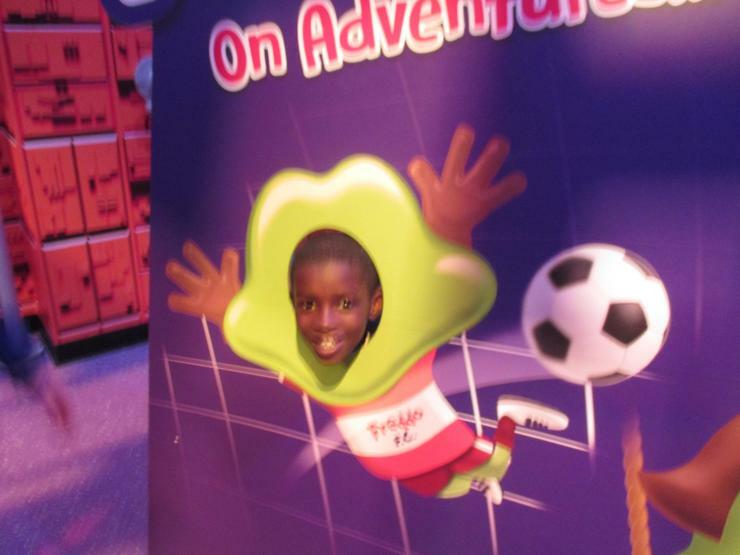 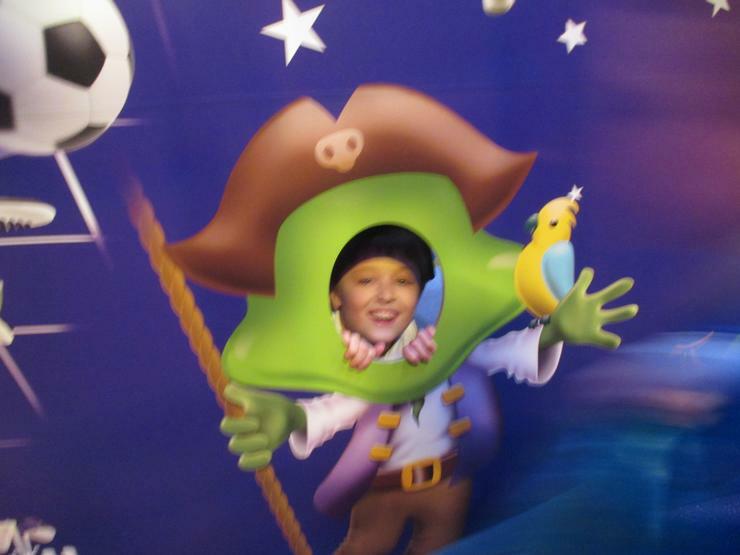 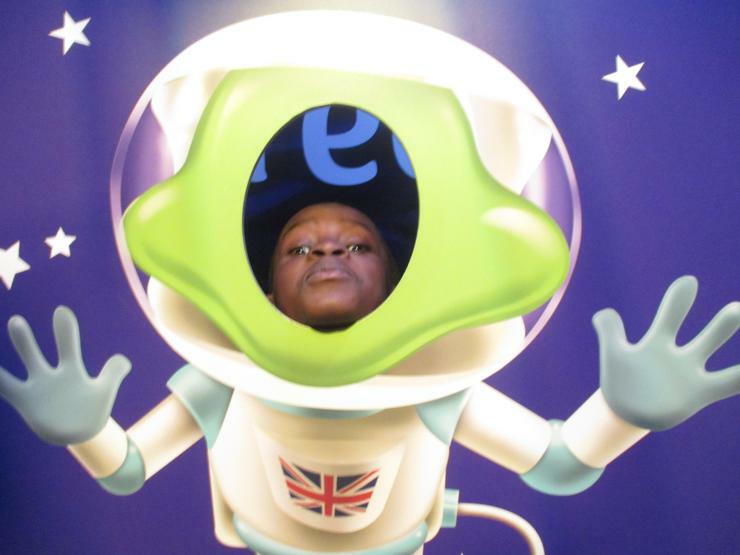 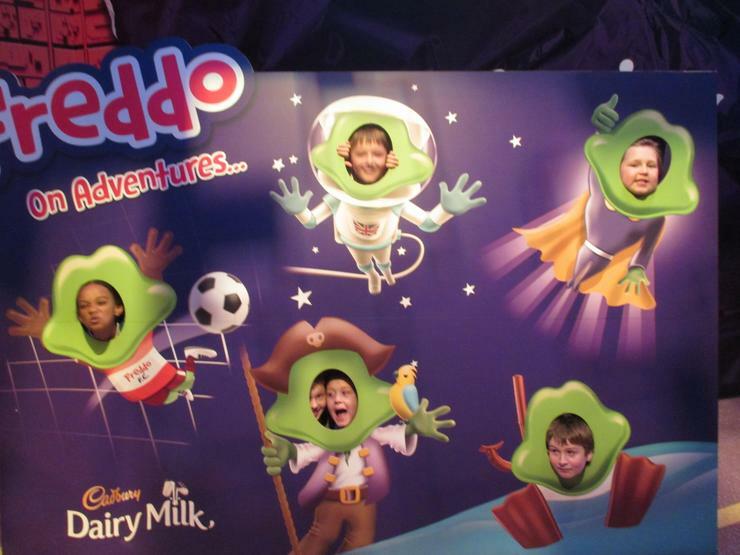 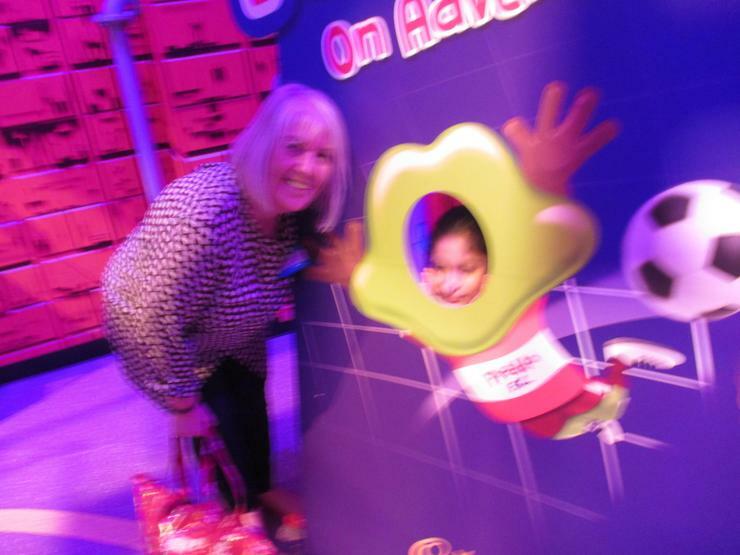 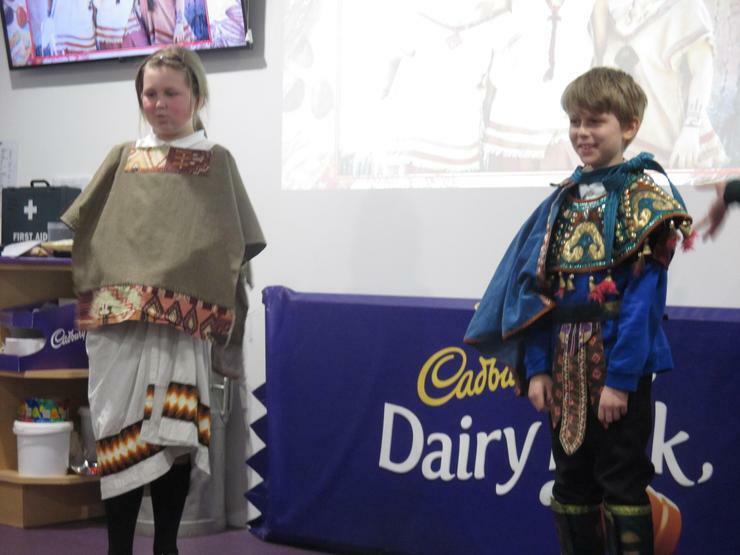 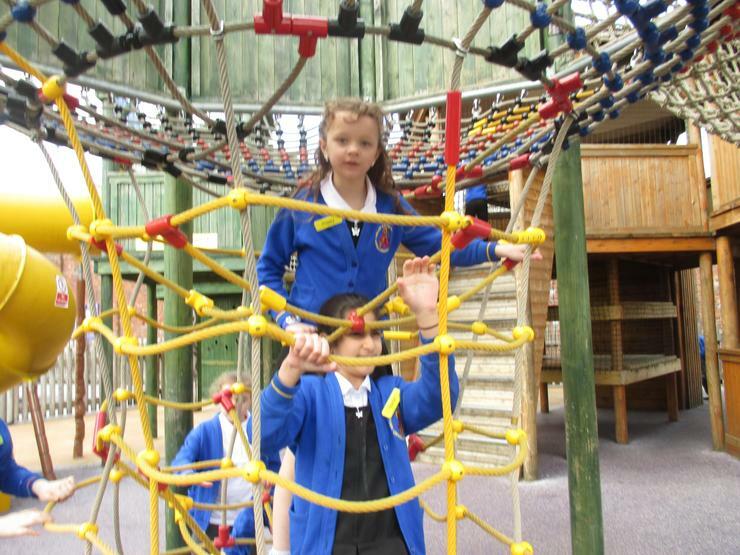 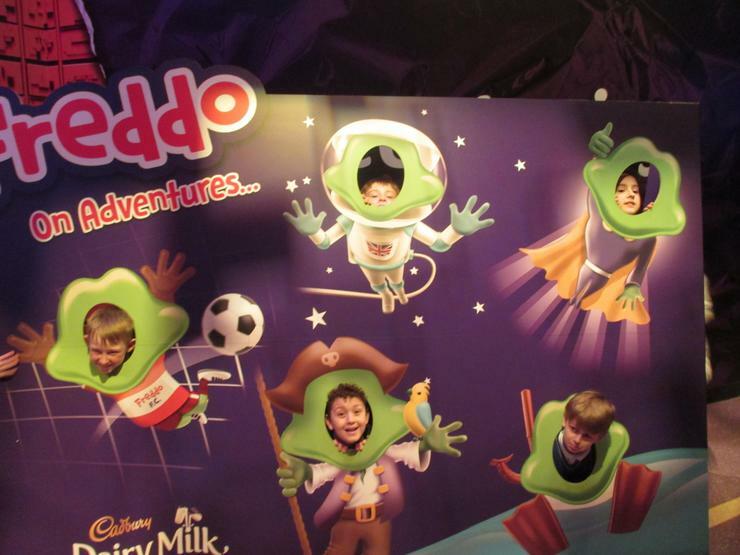 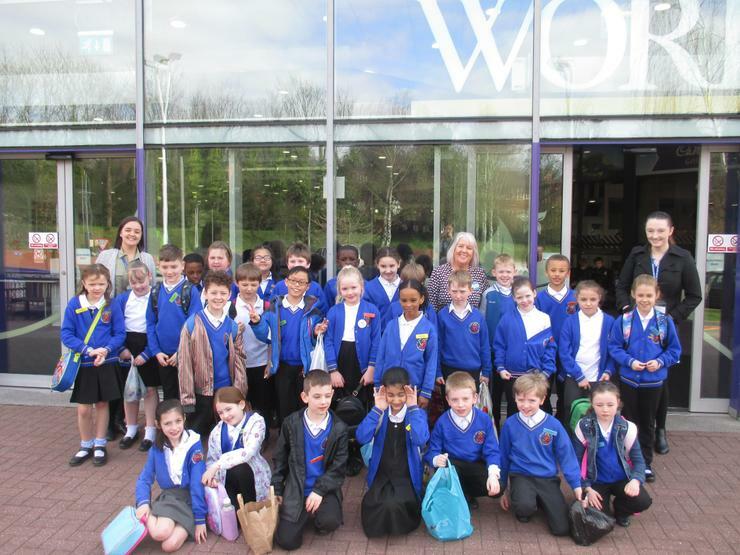 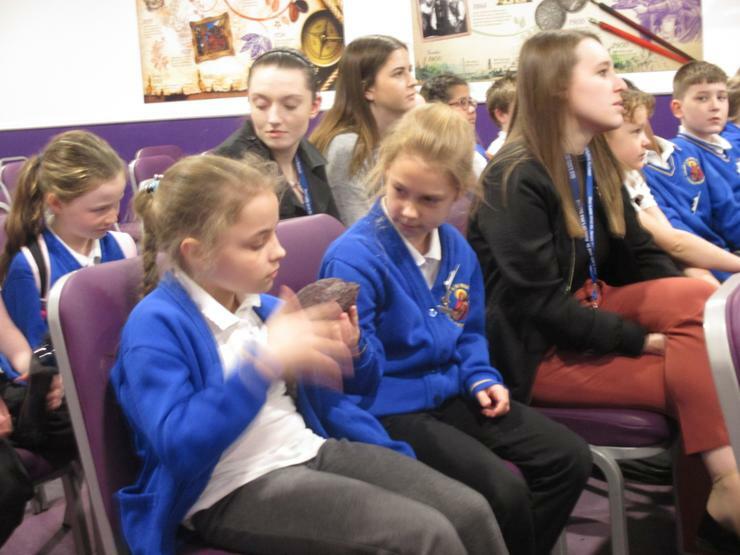 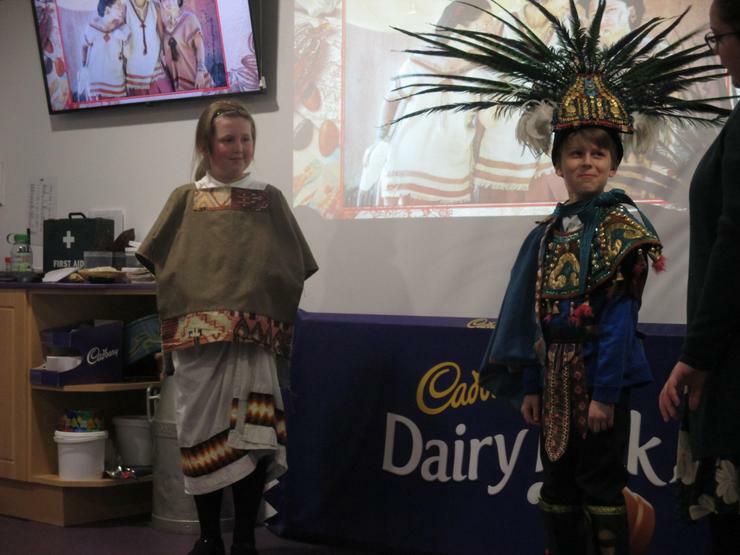 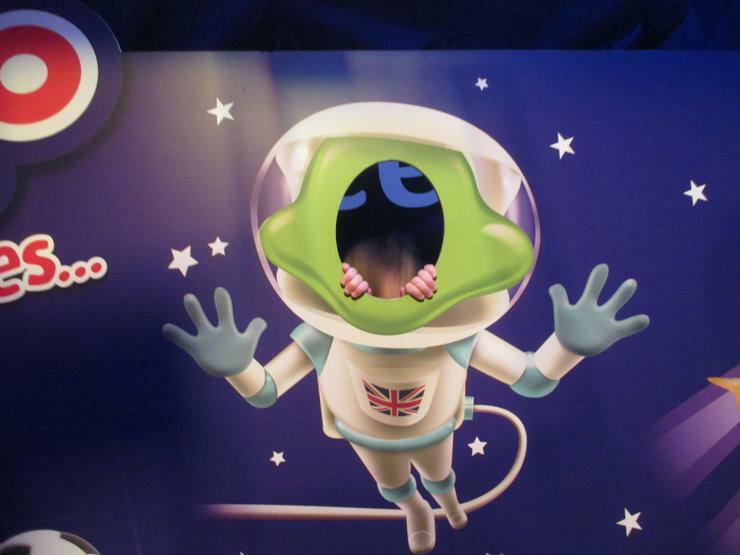 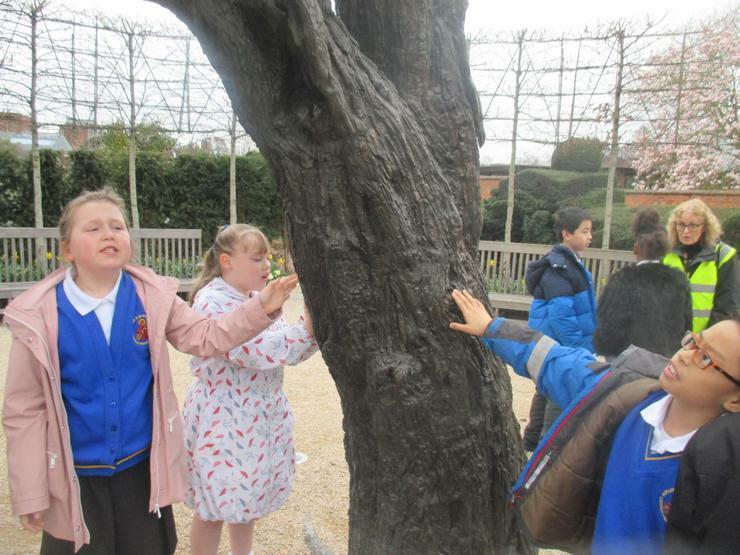 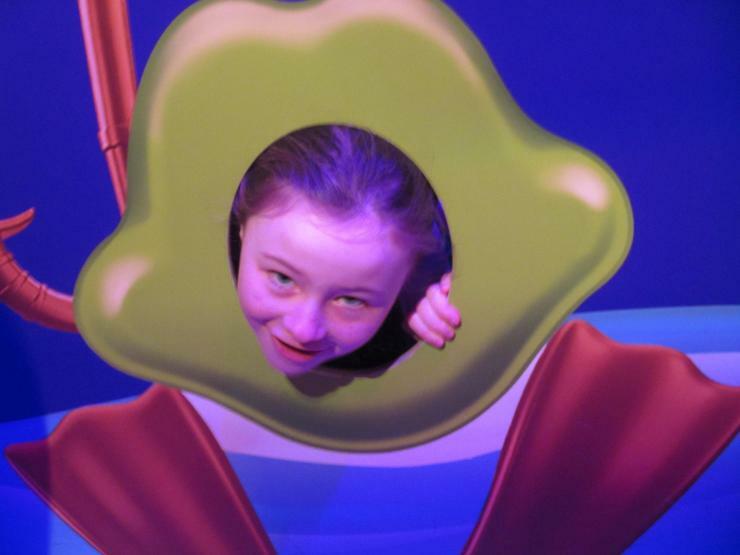 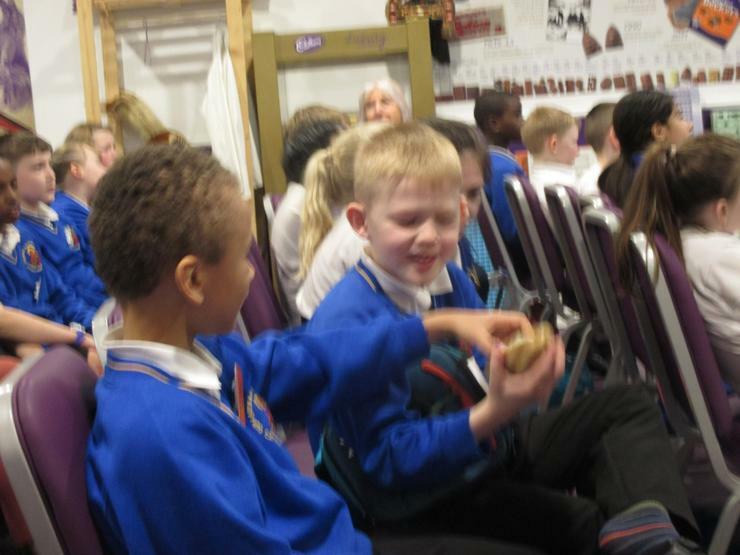 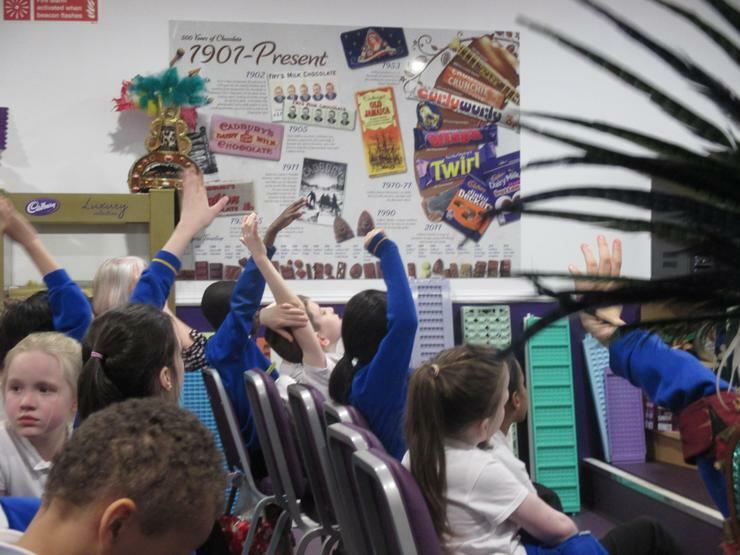 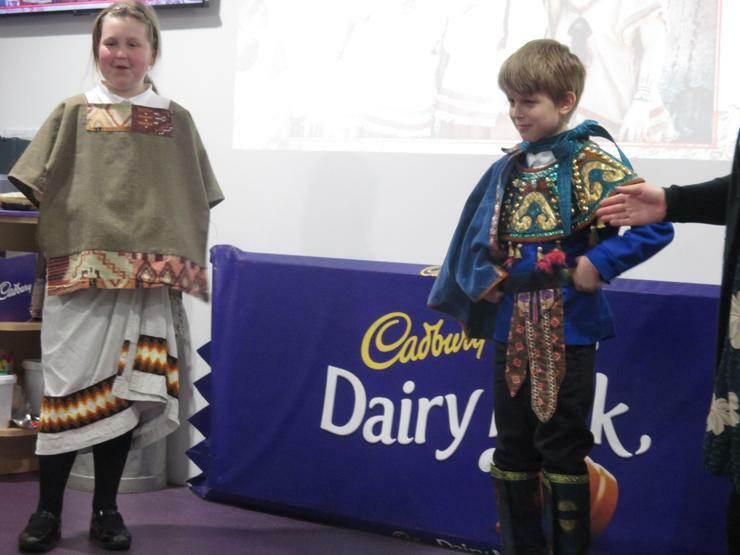 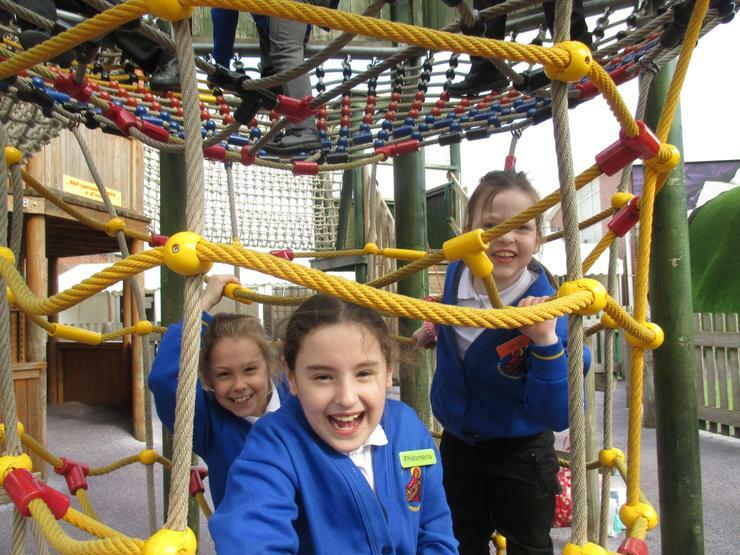 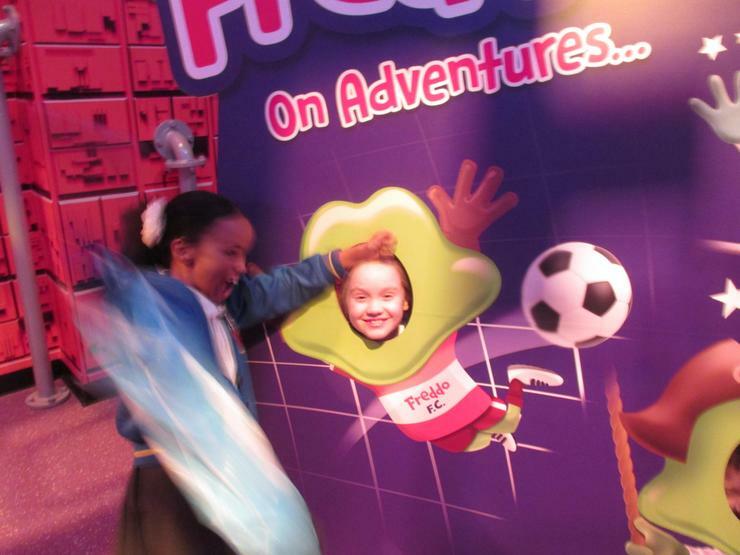 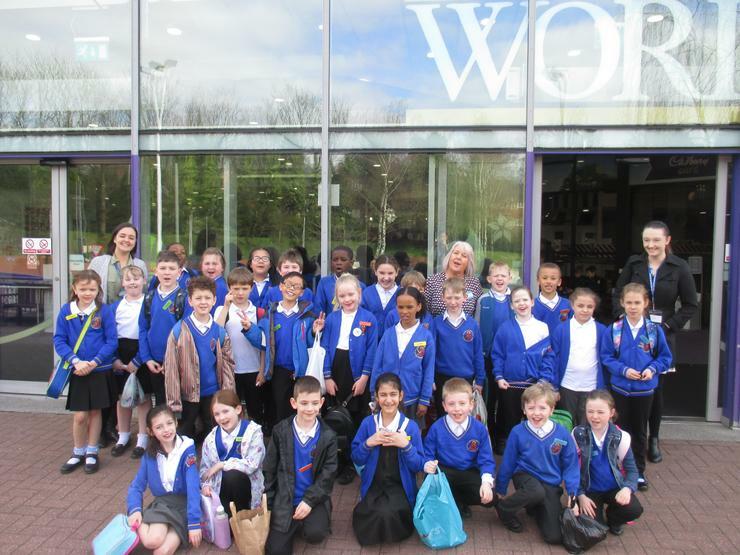 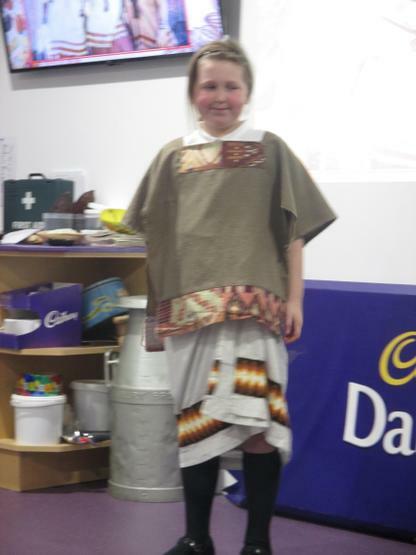 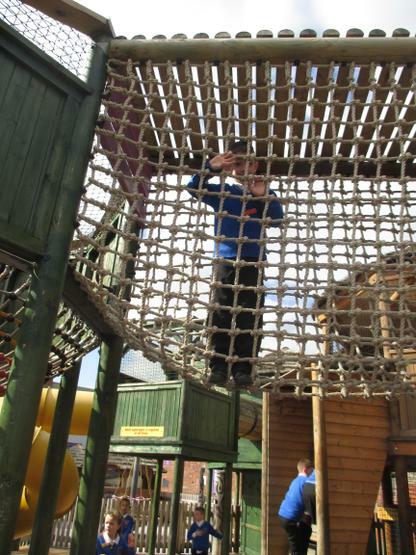 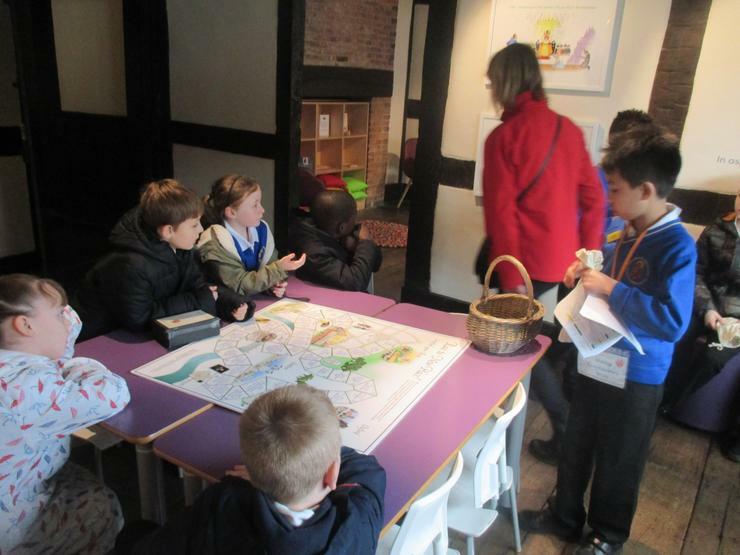 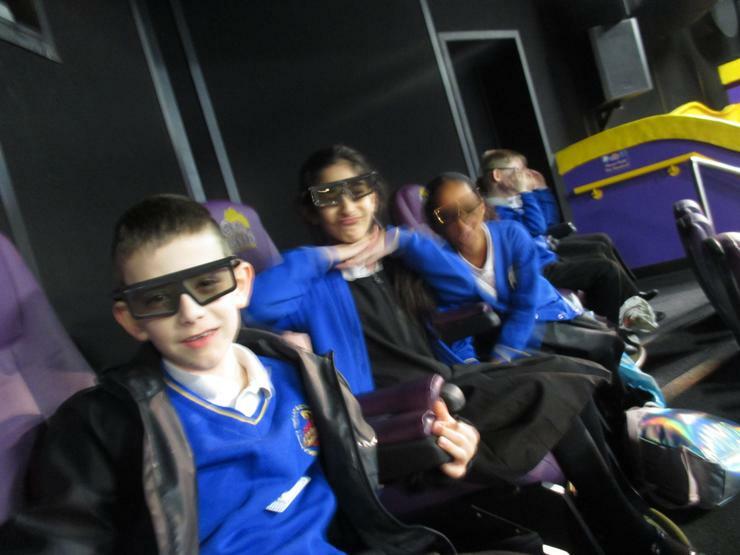 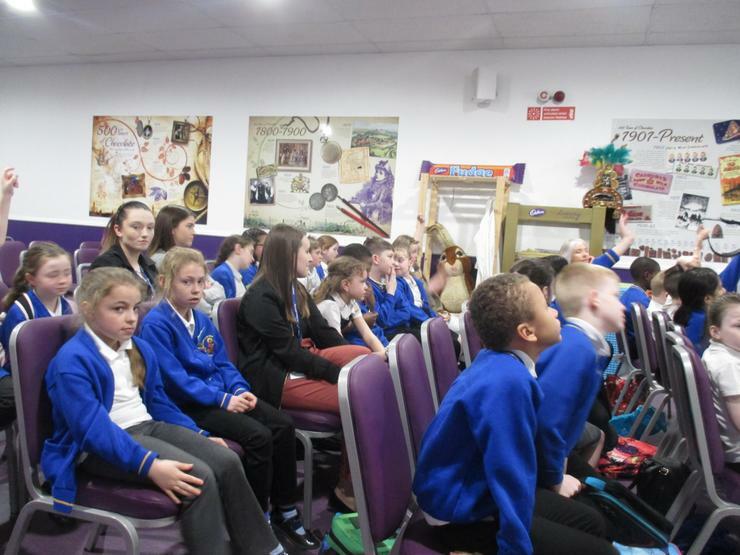 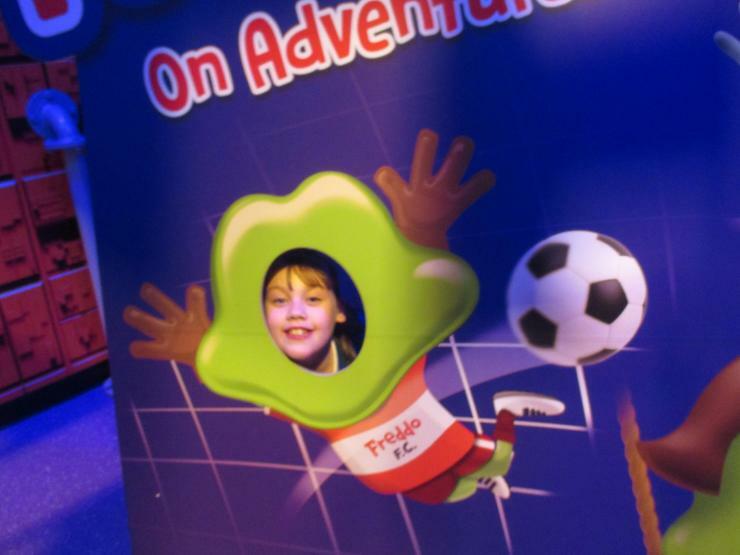 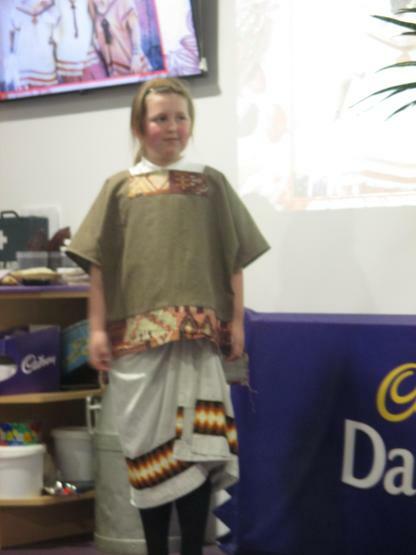 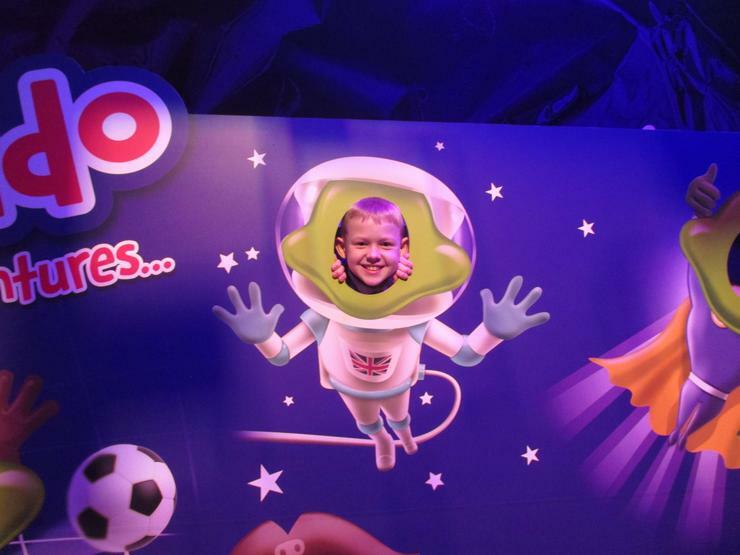 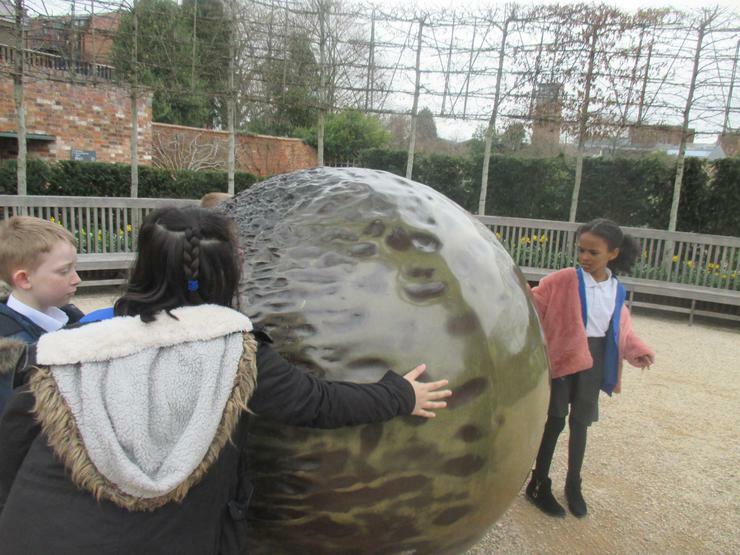 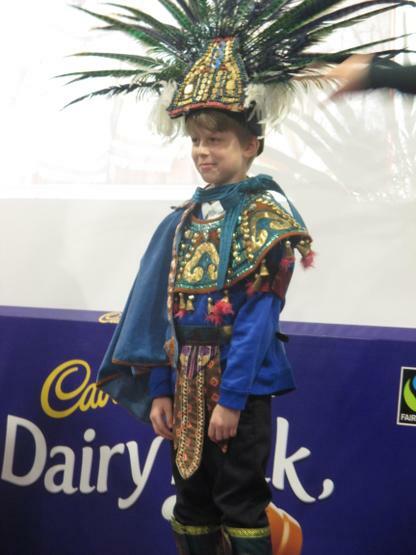 Year 4 enjoyed their much anticipated trip to Cadbury world this week. 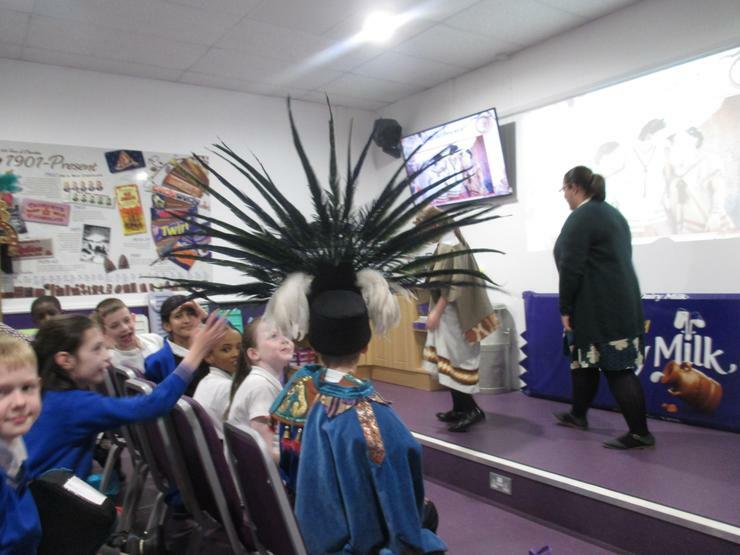 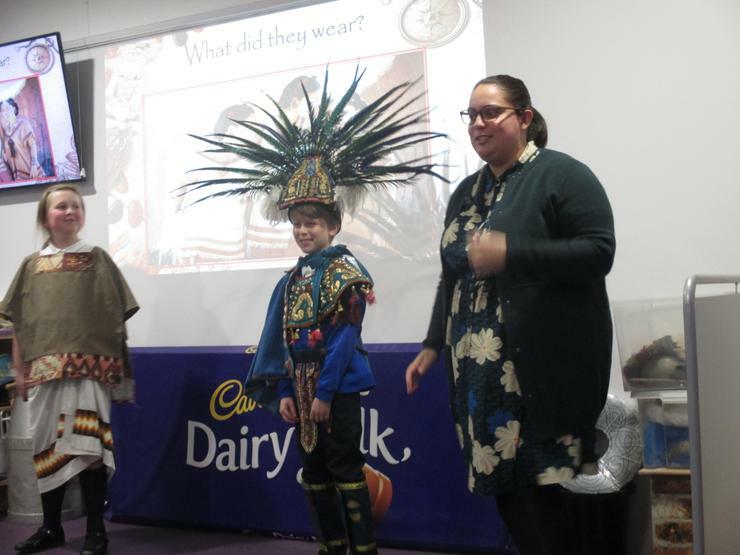 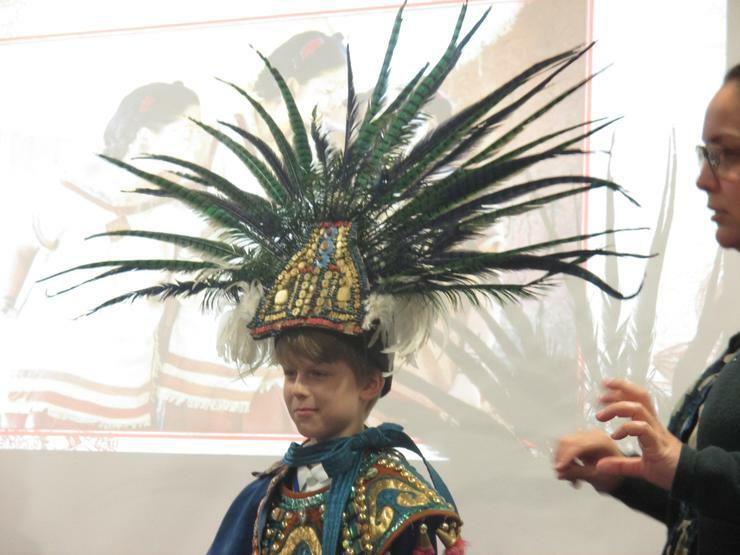 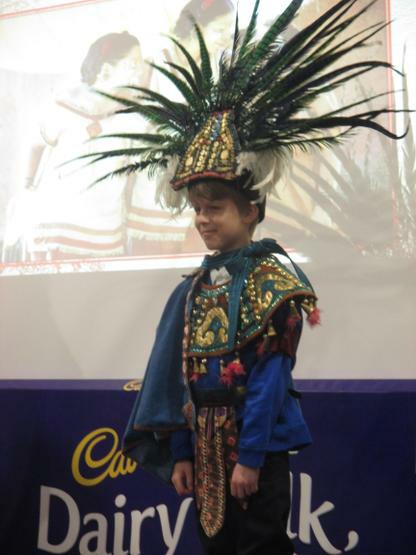 We have been enjoying Charlie and the chocolate factory so much and have learnt so much about the Mayans in History. 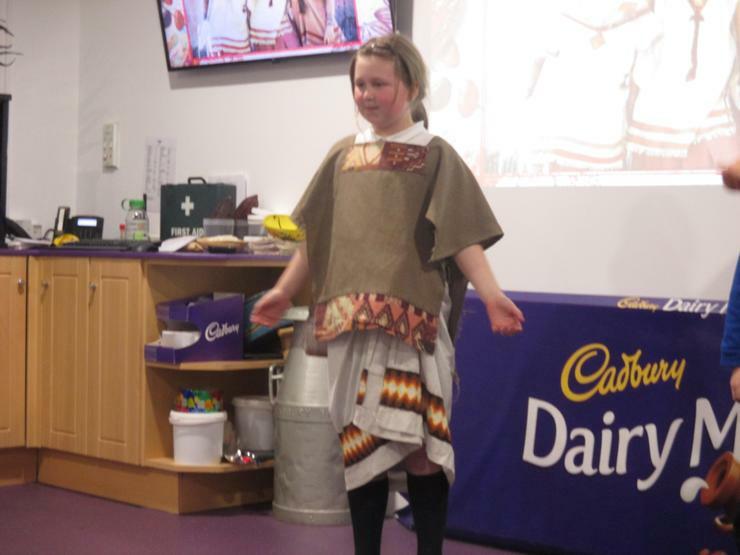 This trip gave us the chance to experience the production of Chocolate, the History of Cadbury and have a special educational talk from a Mayan expert - who was very impressed with our knowledge. 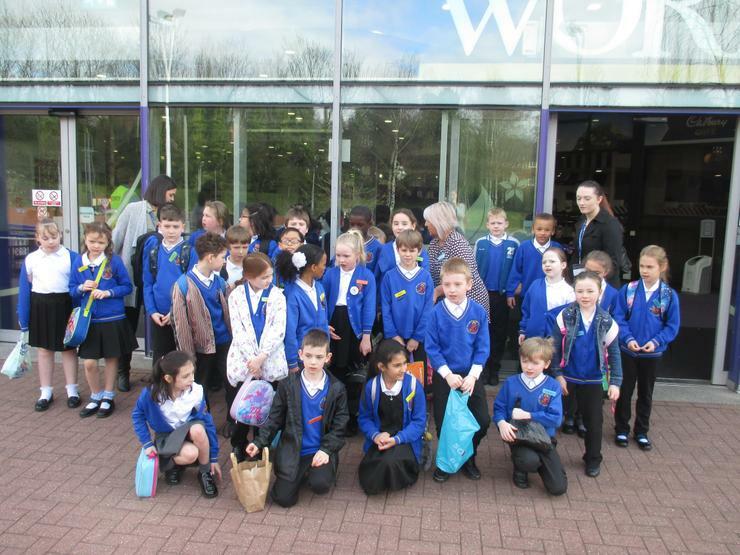 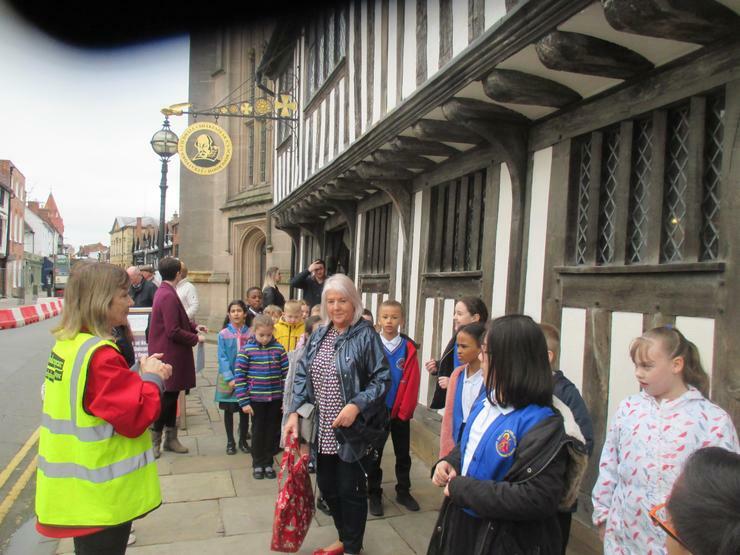 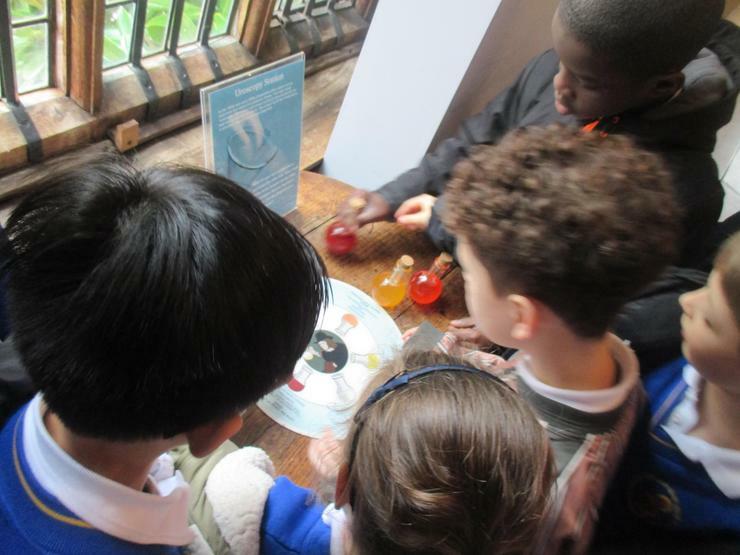 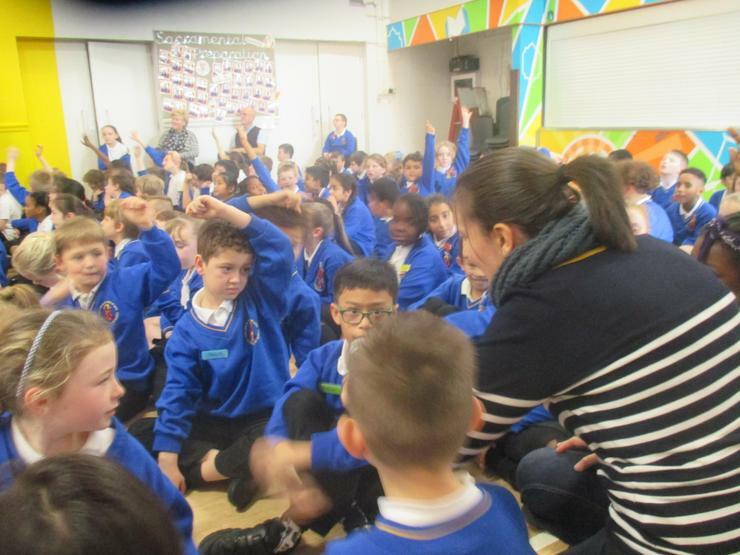 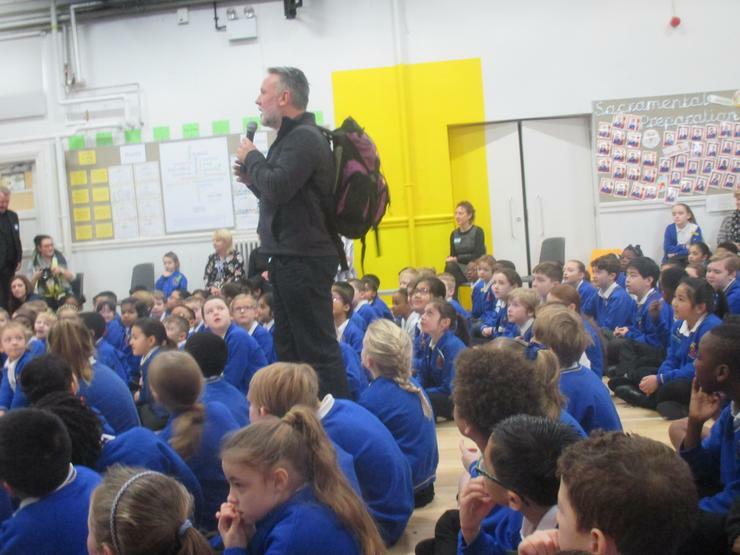 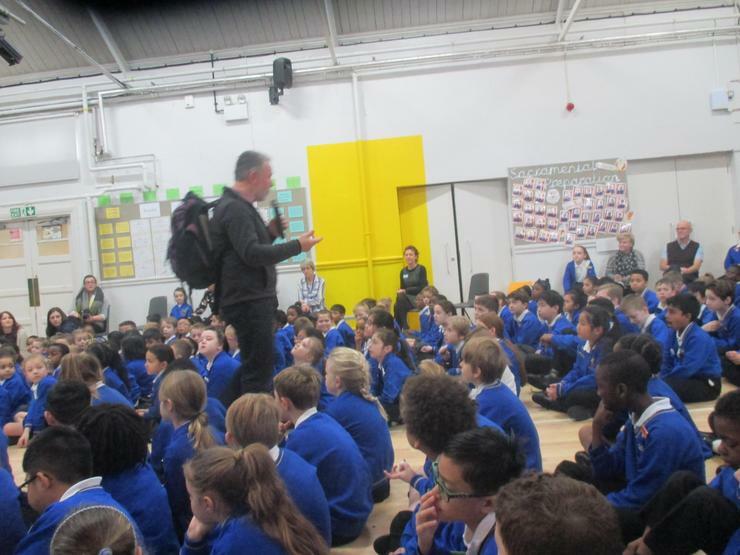 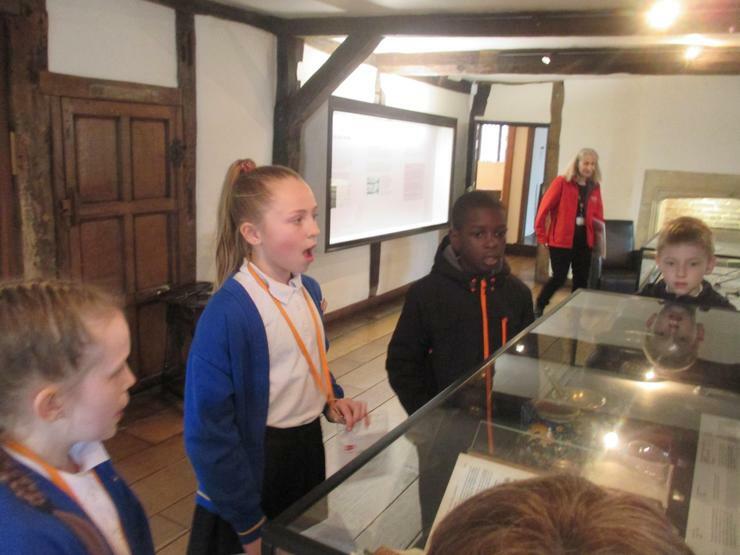 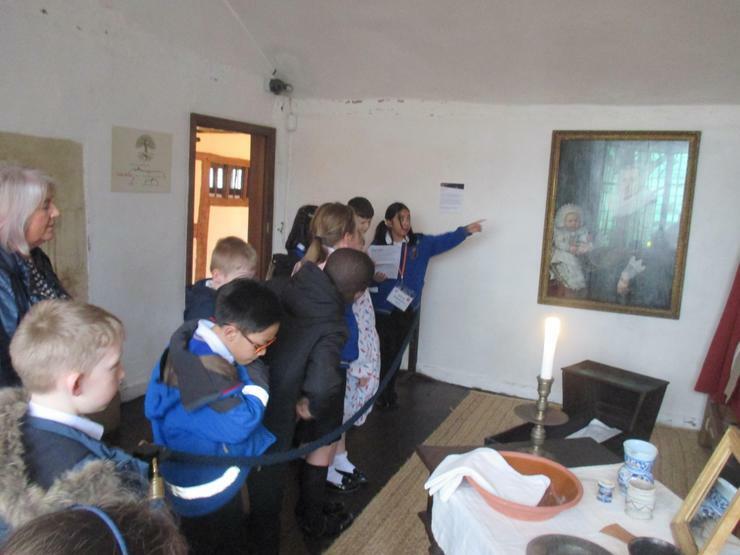 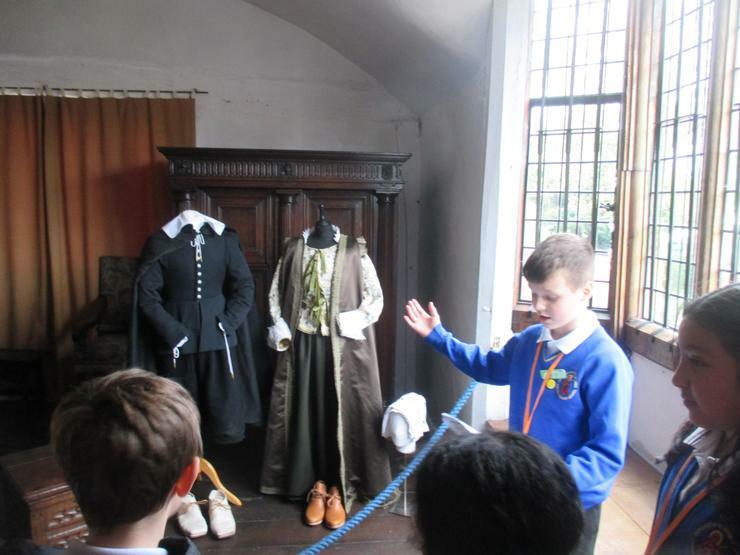 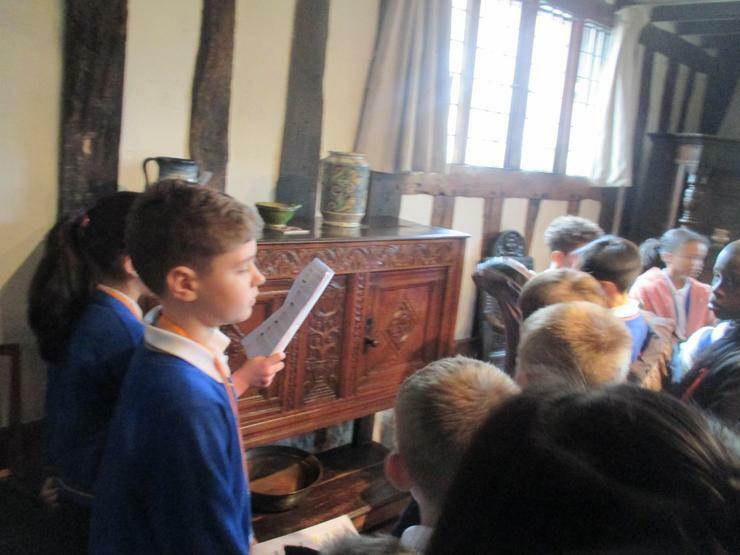 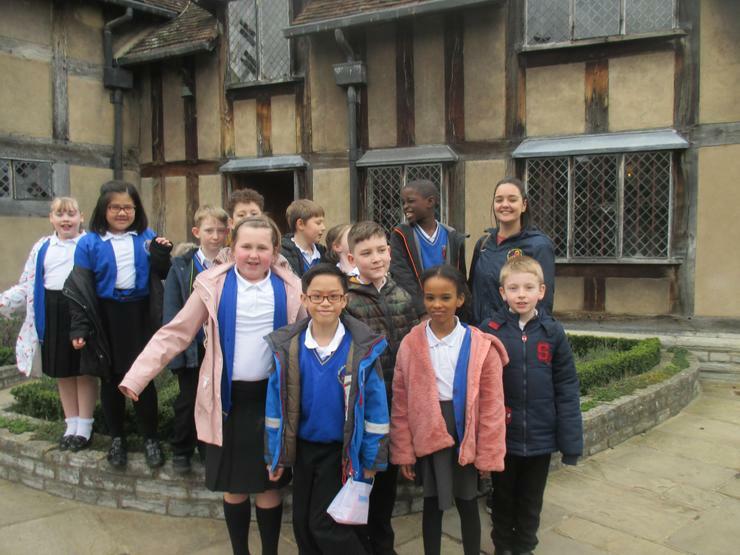 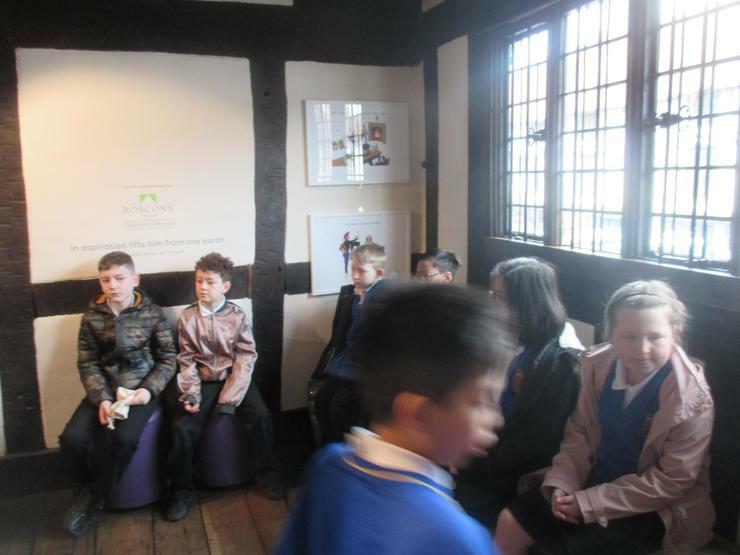 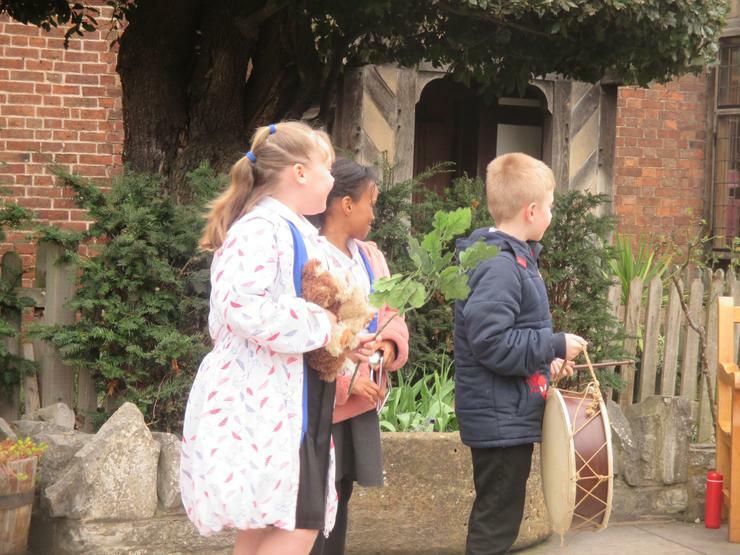 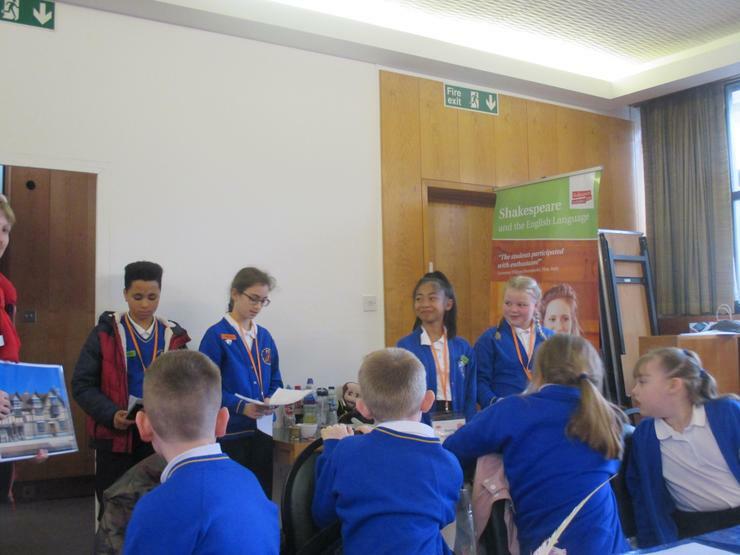 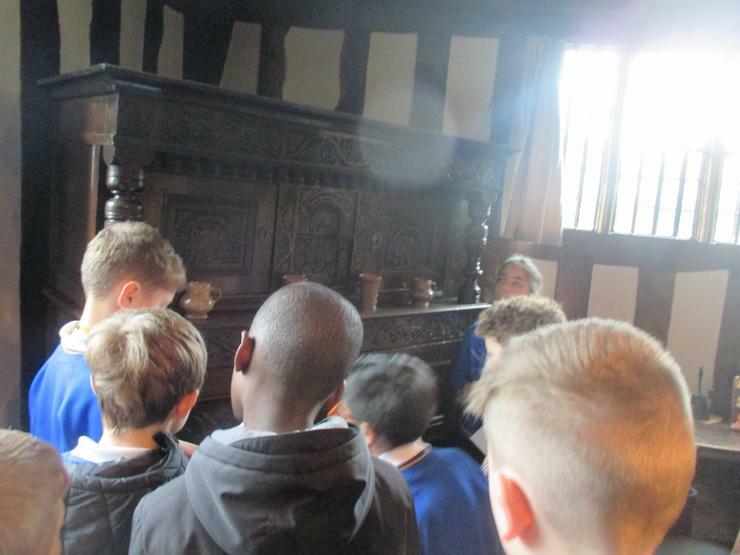 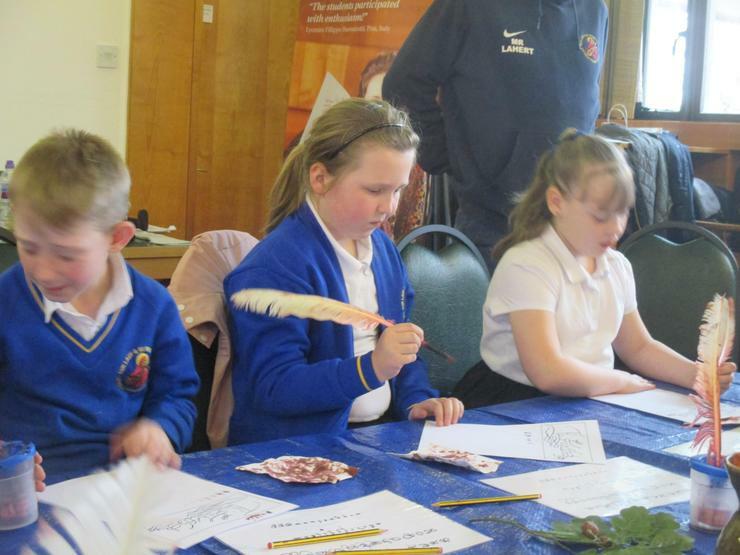 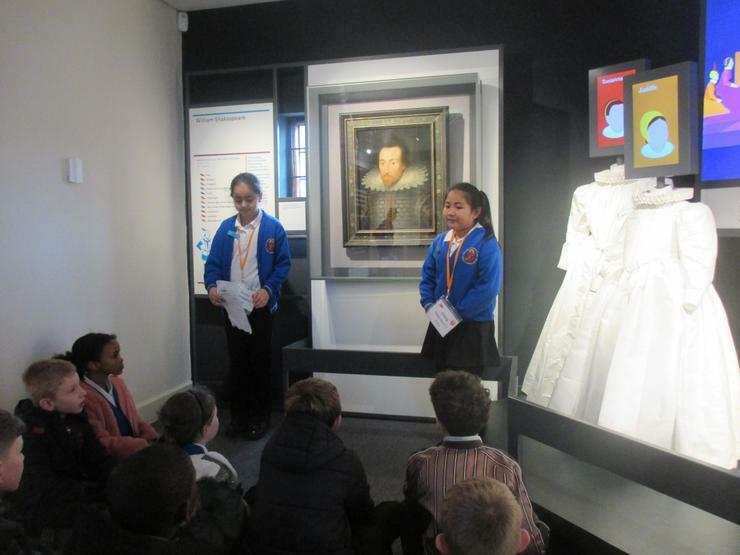 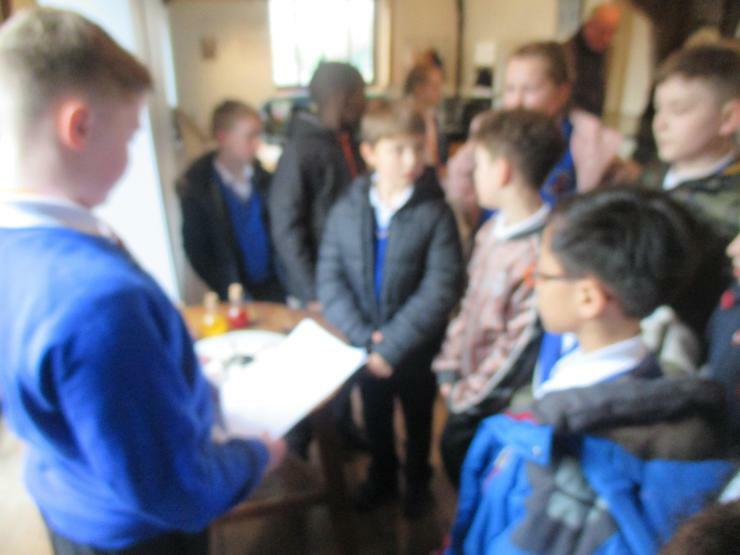 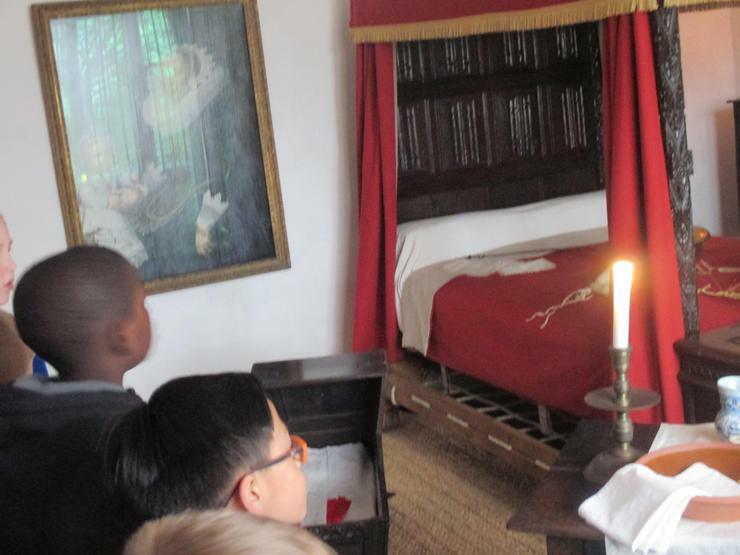 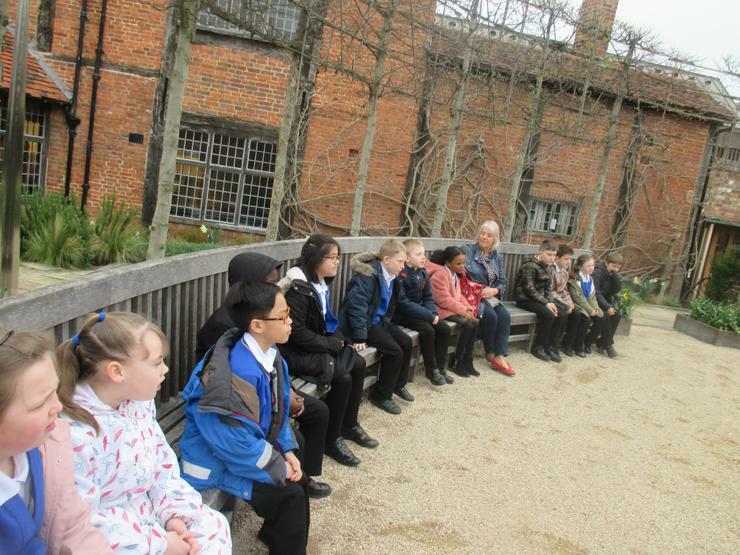 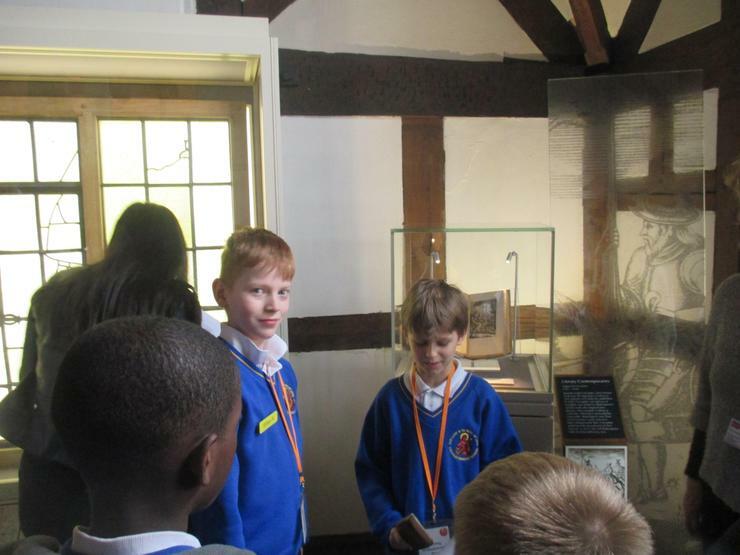 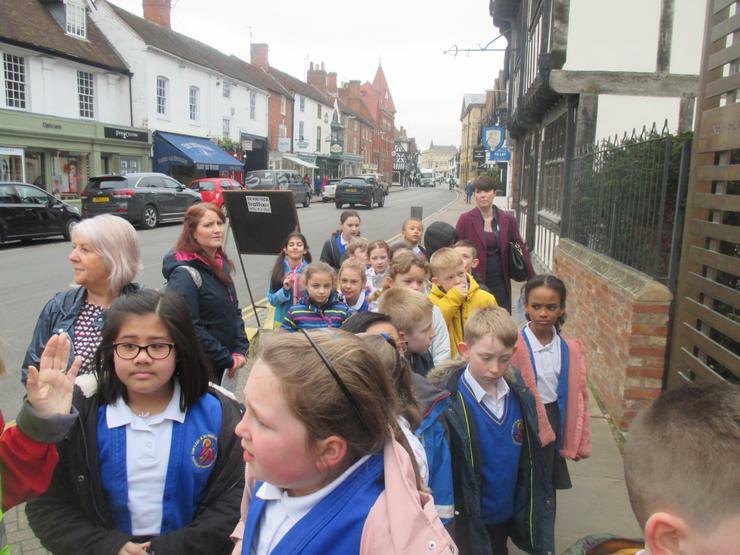 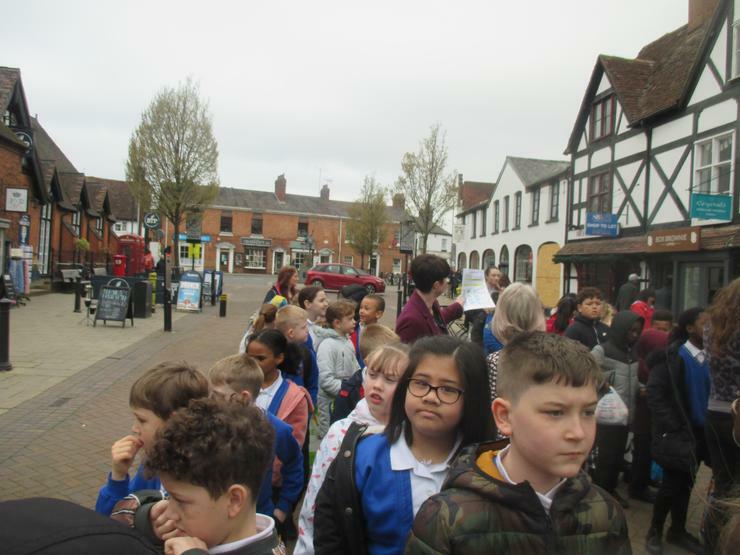 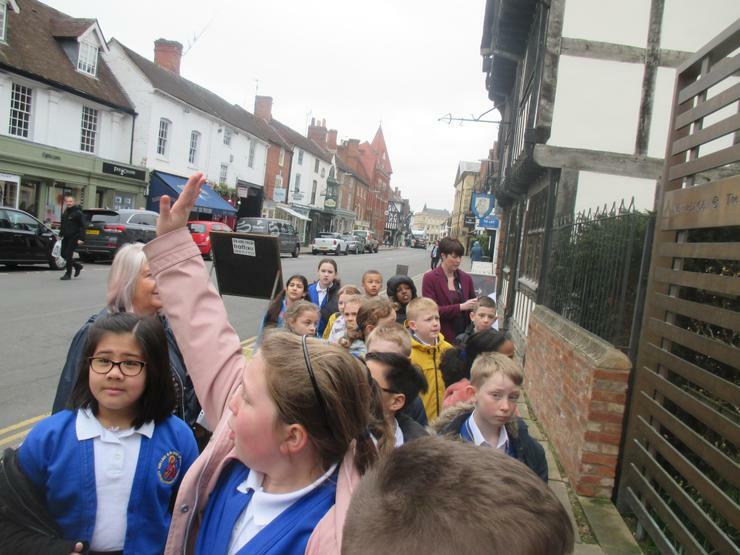 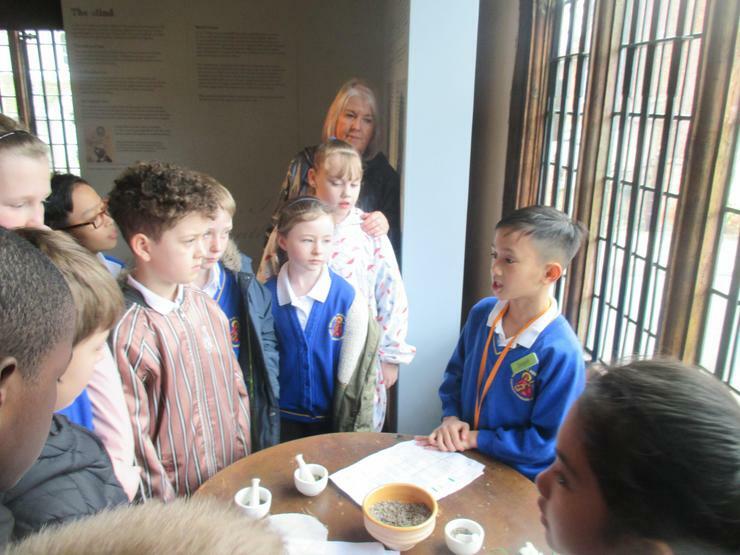 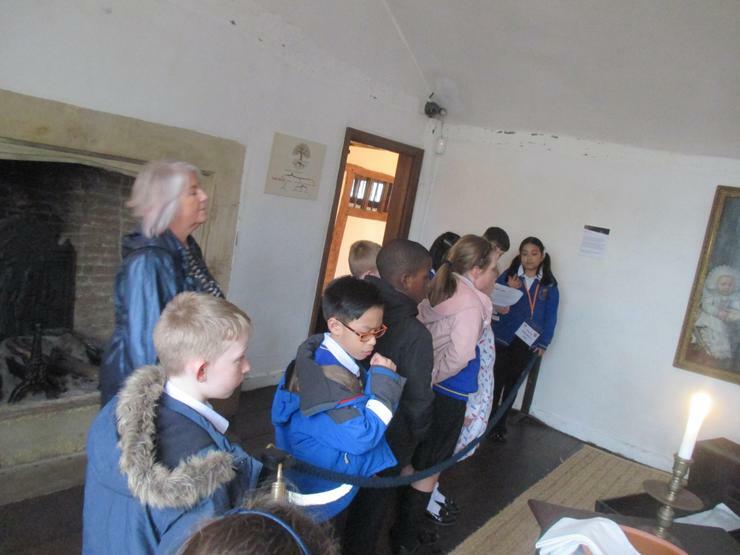 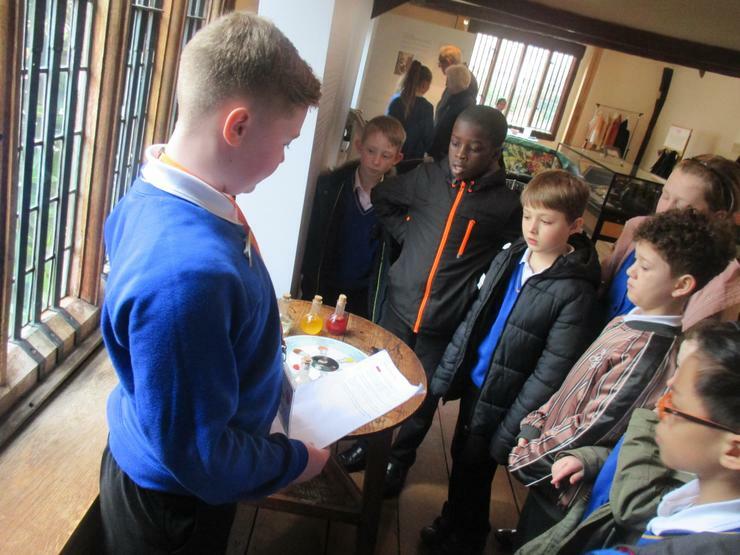 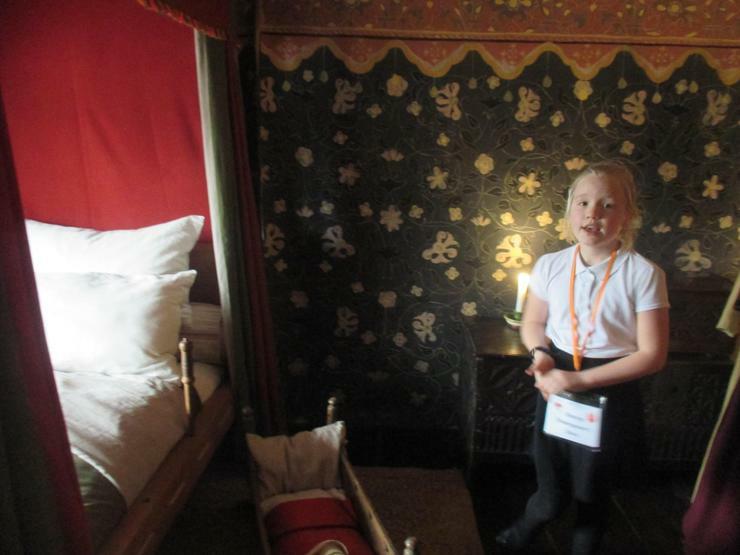 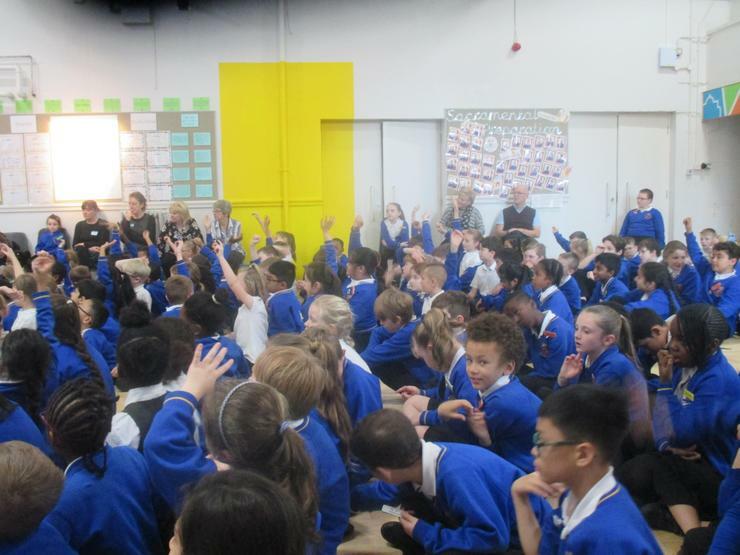 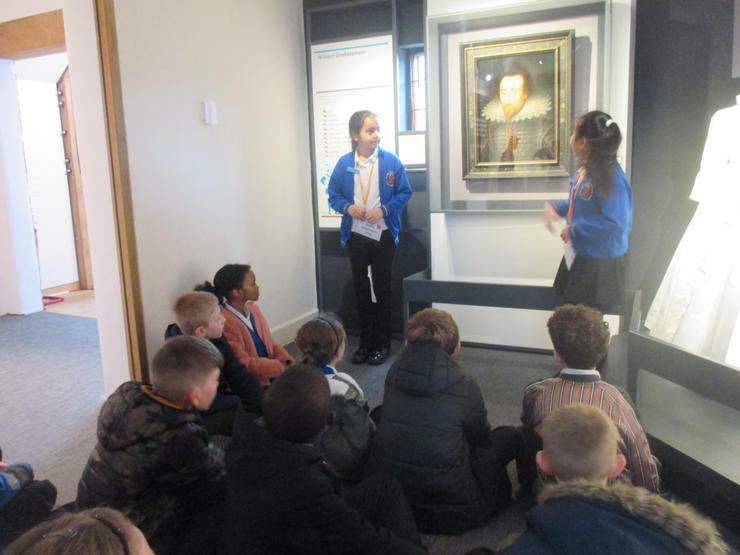 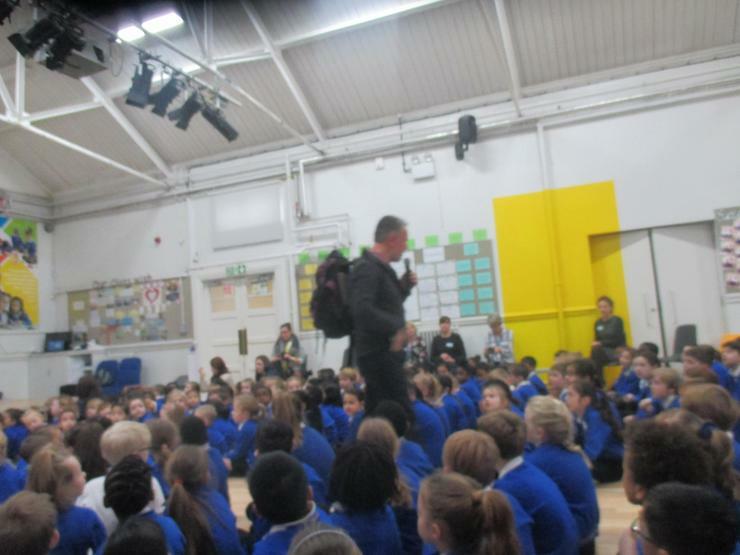 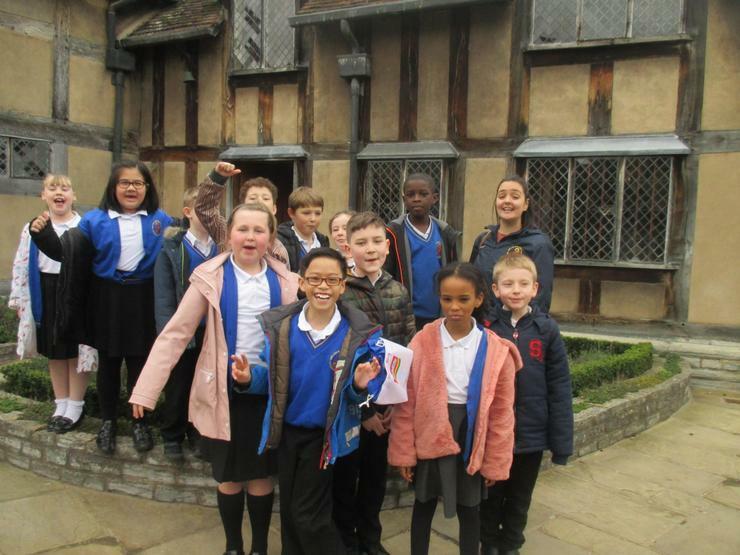 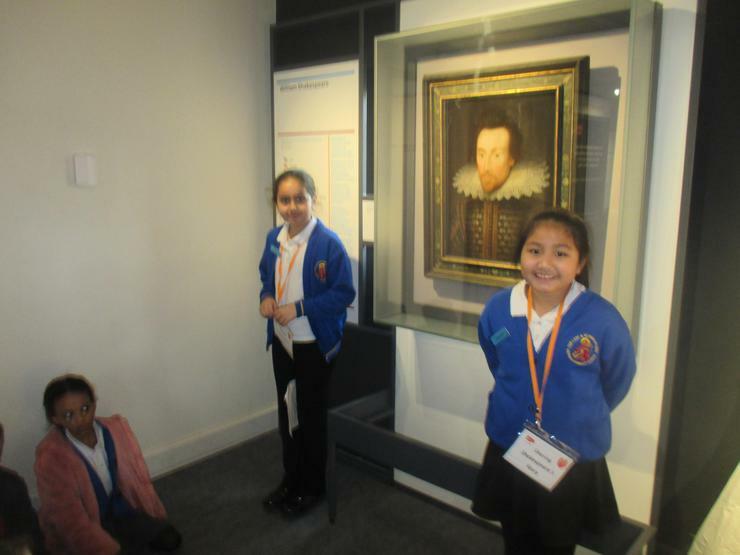 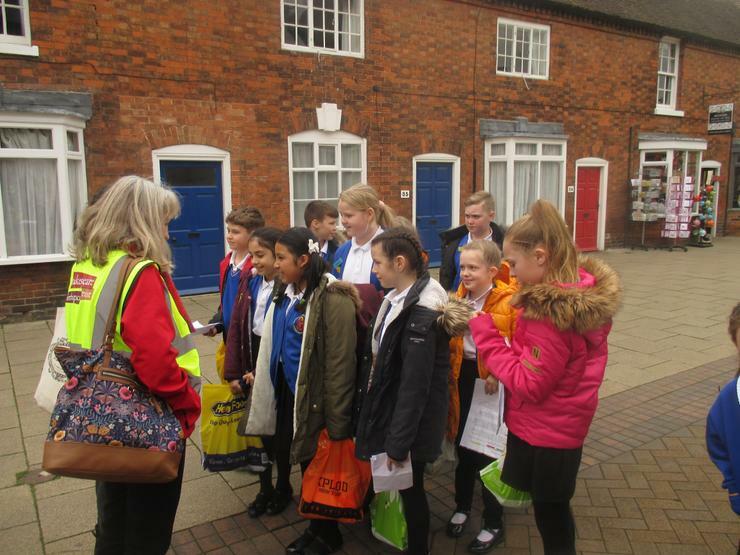 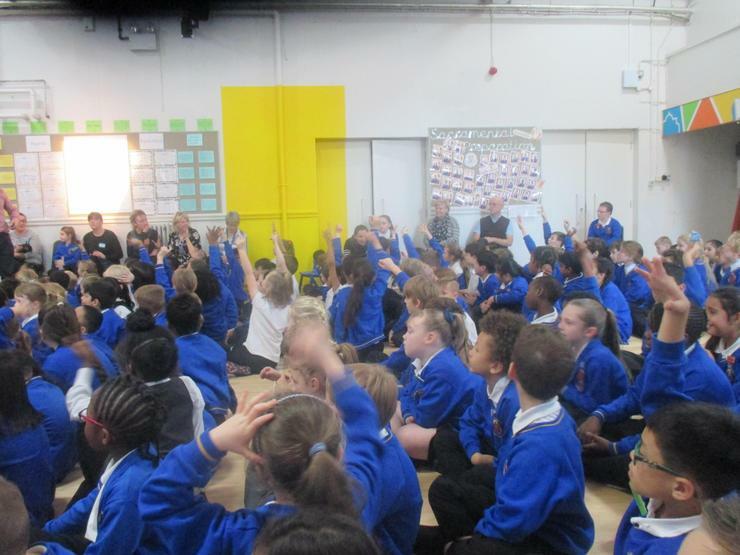 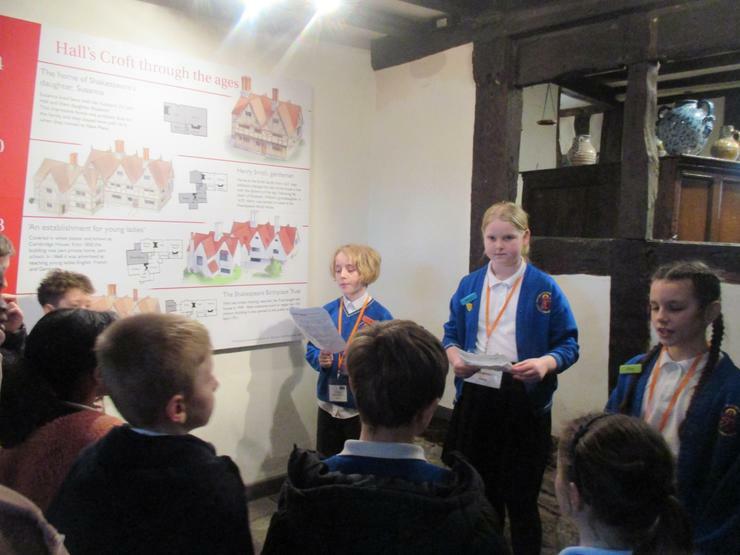 Year 4 represented the school very well and all got so much from this visit - thank you for supporting them in this. 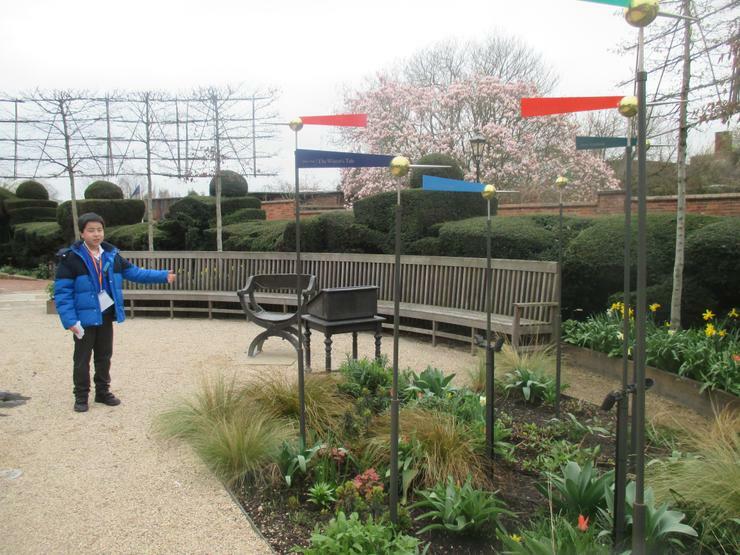 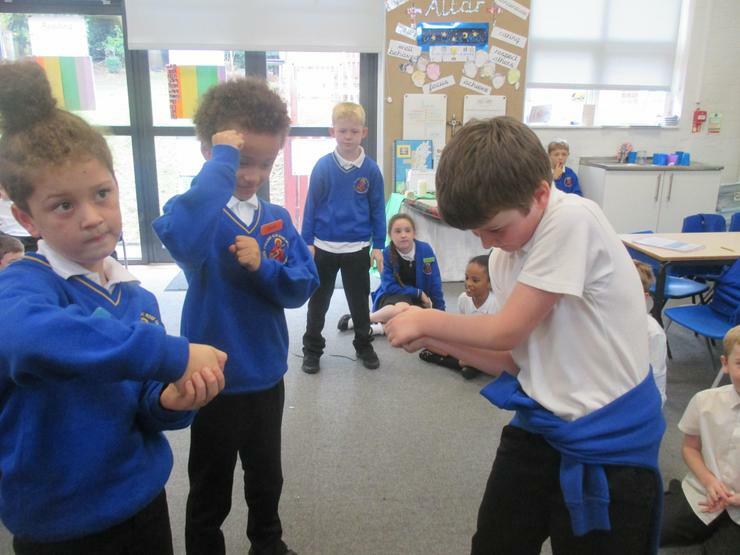 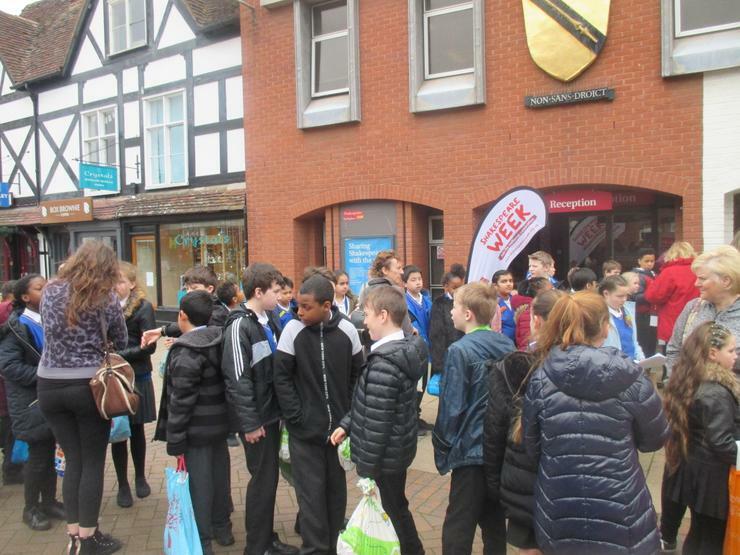 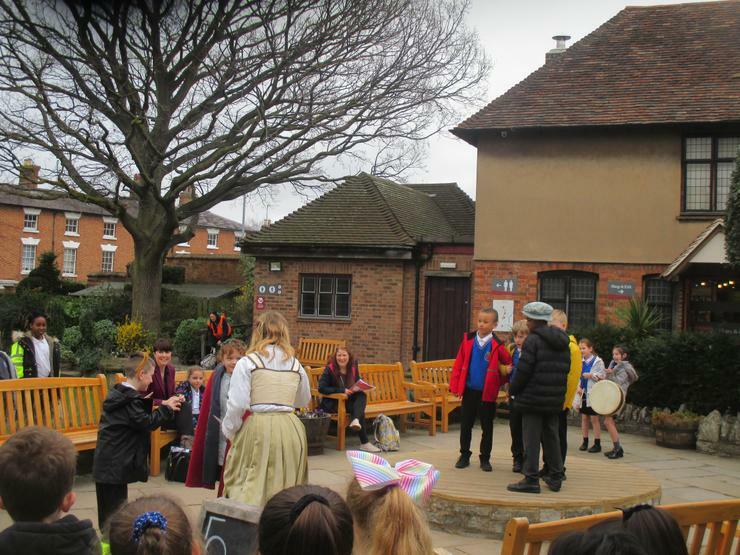 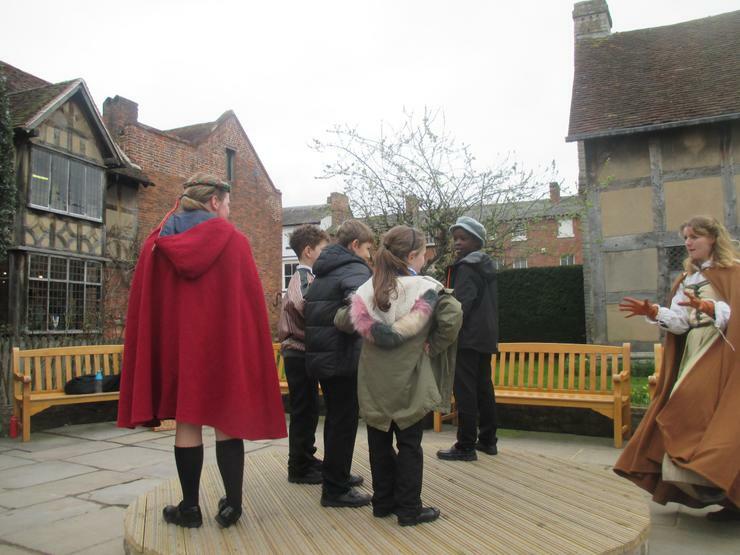 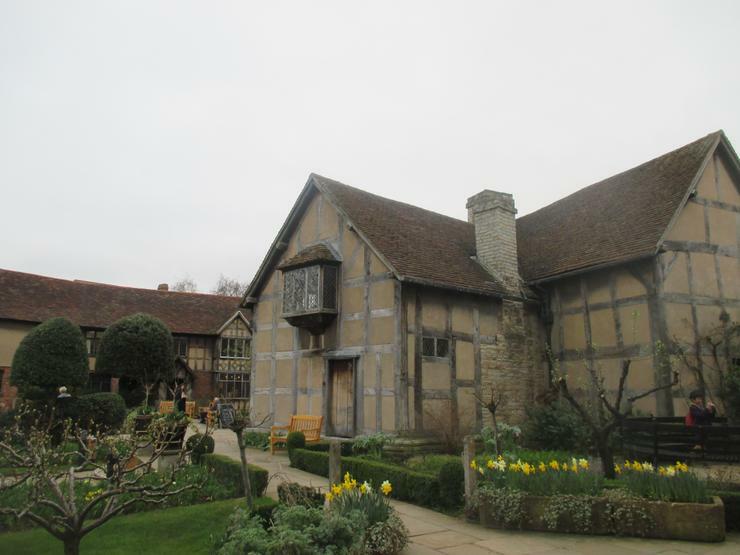 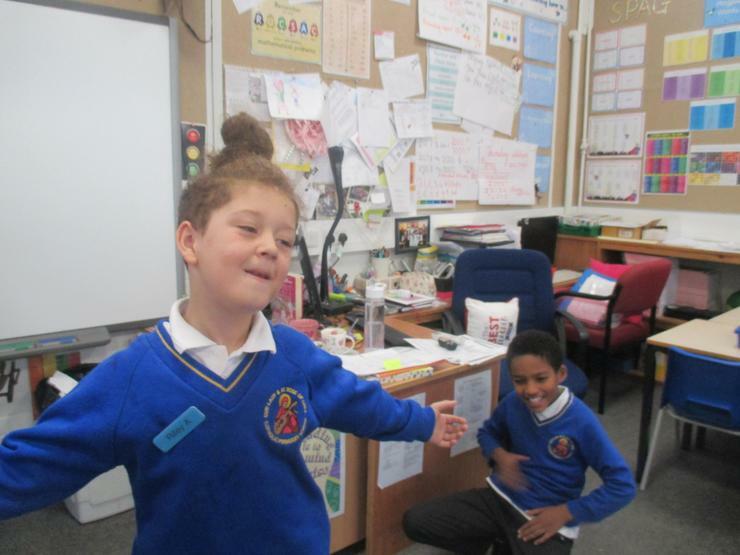 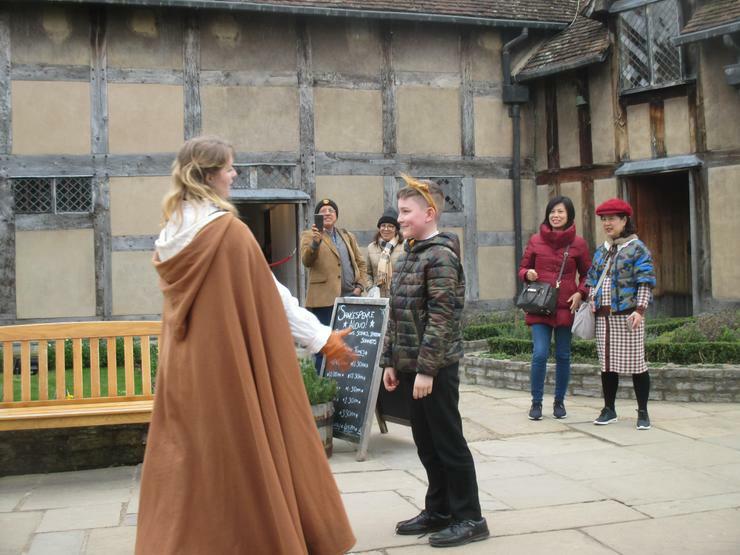 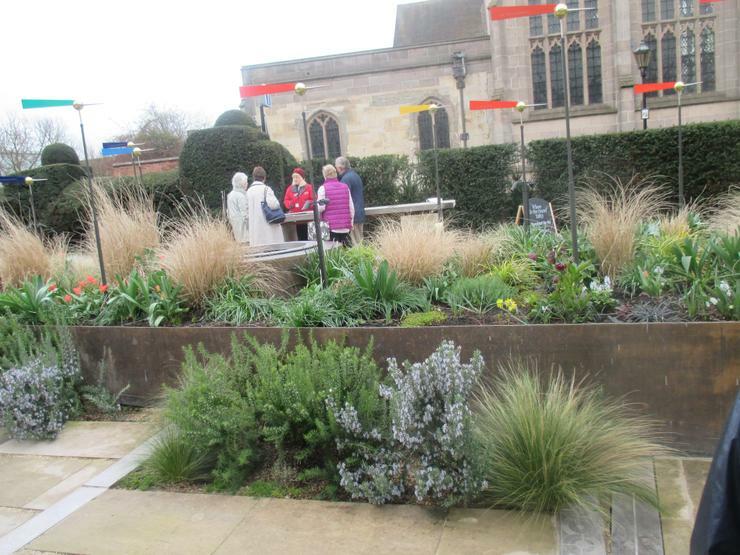 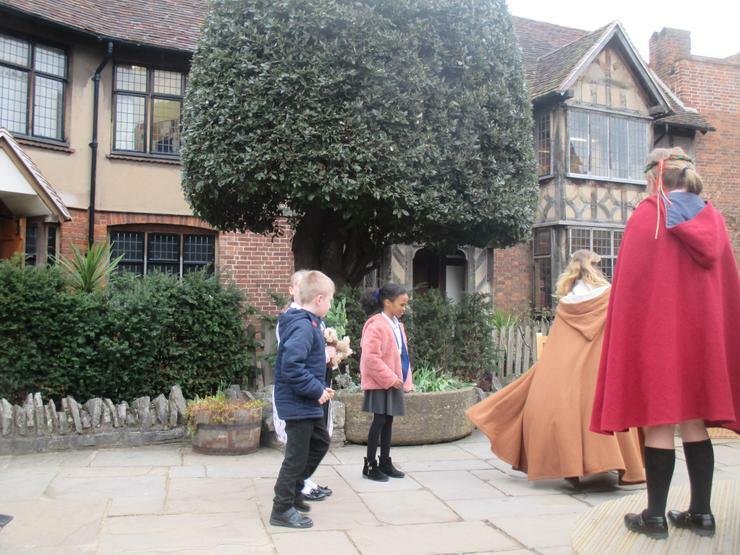 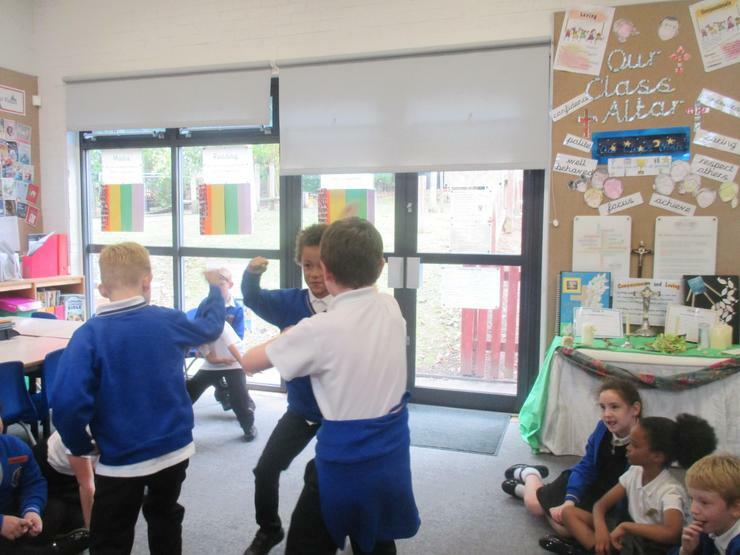 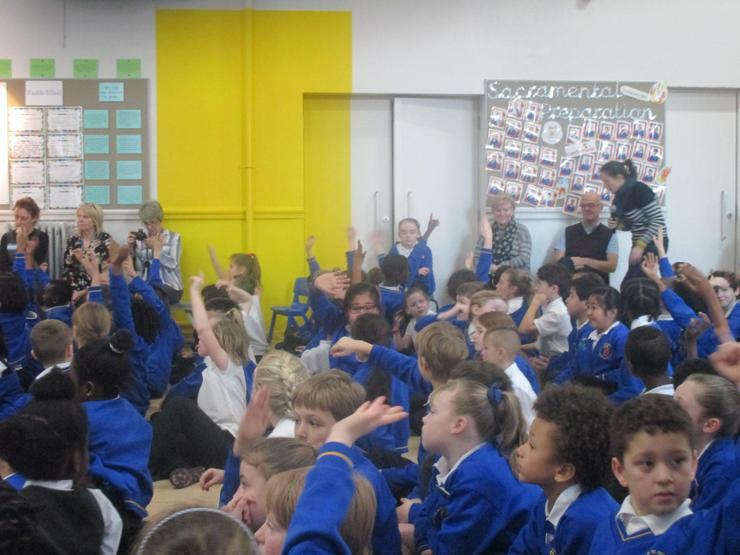 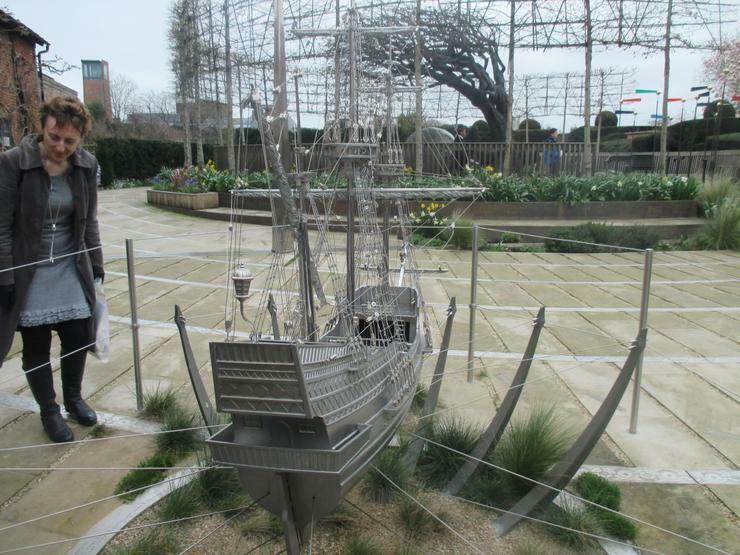 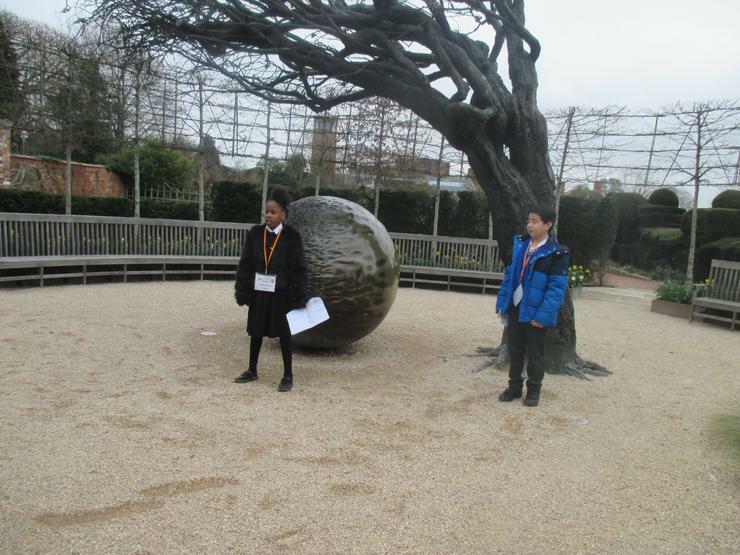 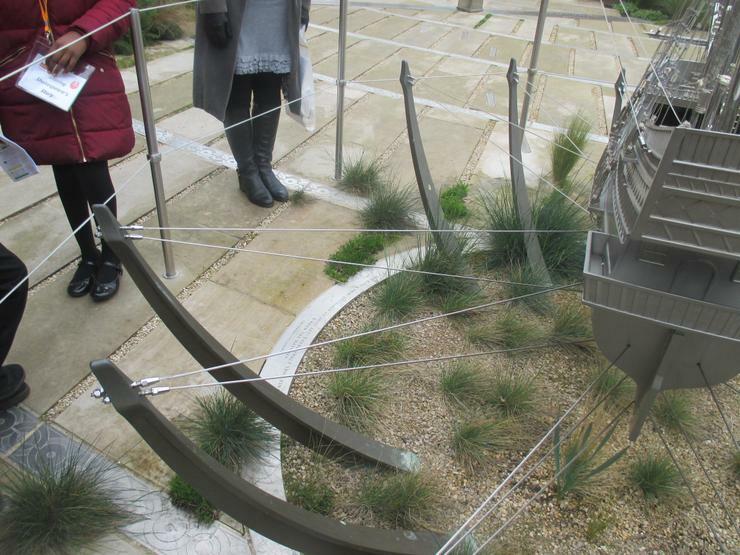 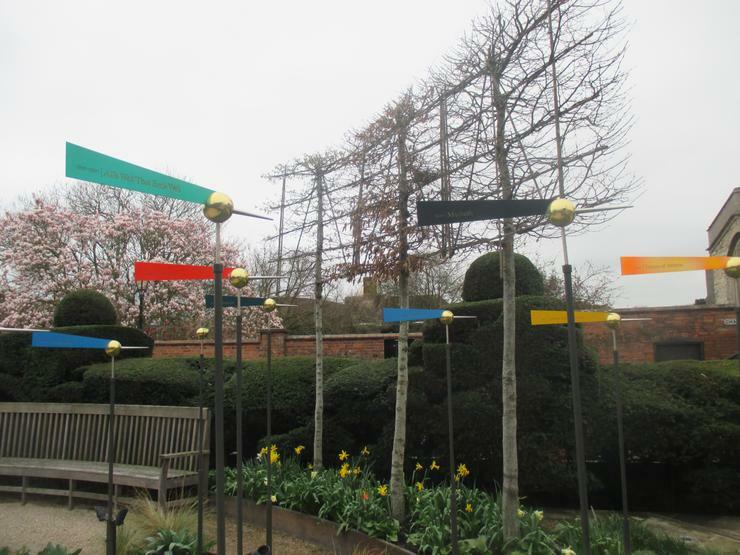 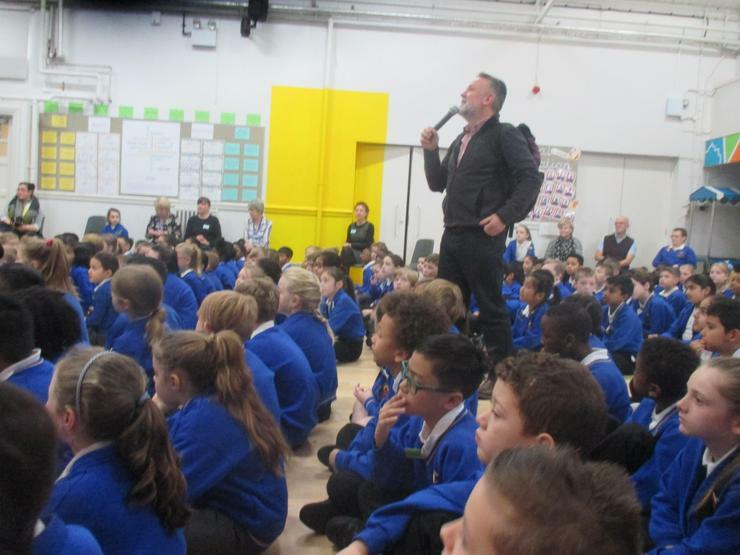 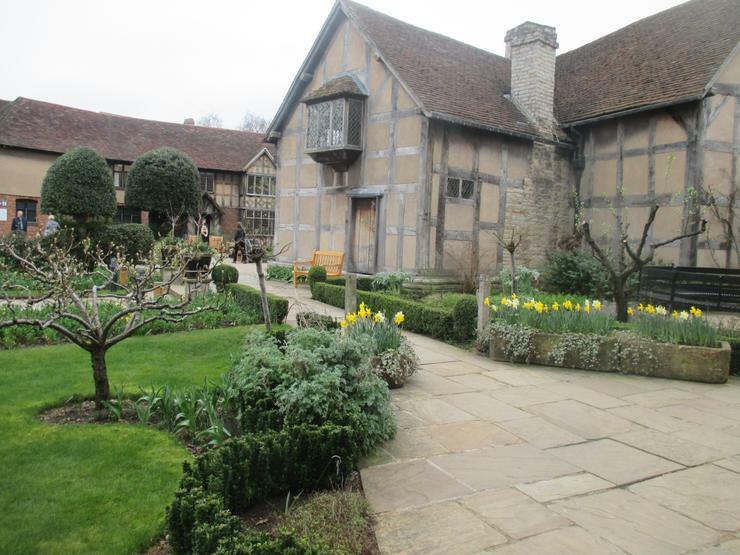 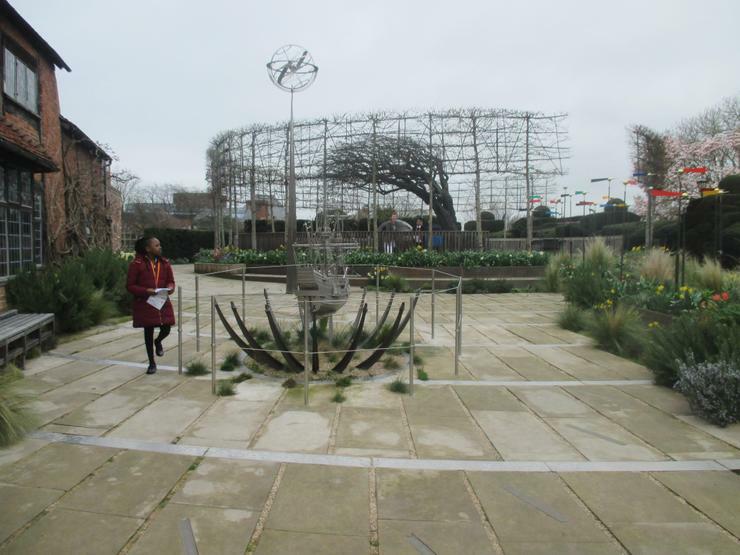 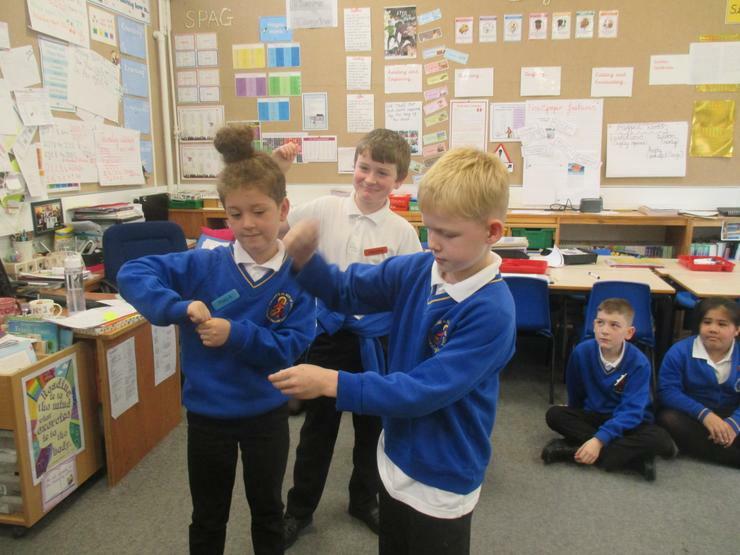 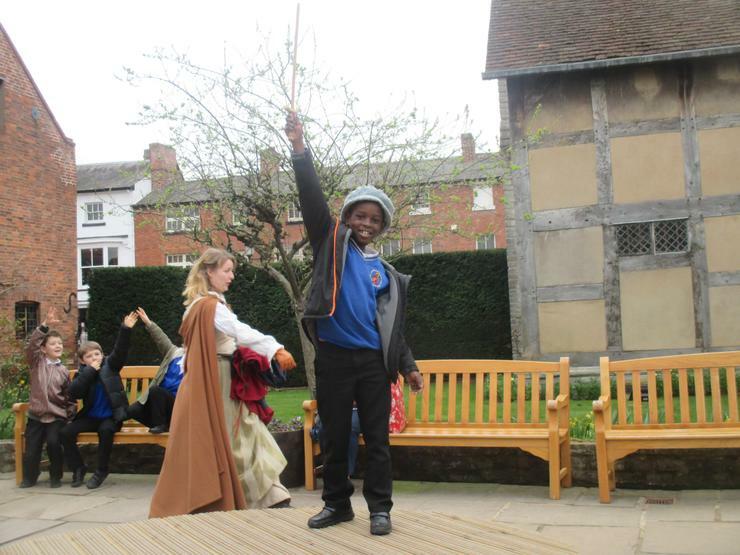 We have all enjoyed Shakespeare week, with particular focus on the famous play, the Tempest. 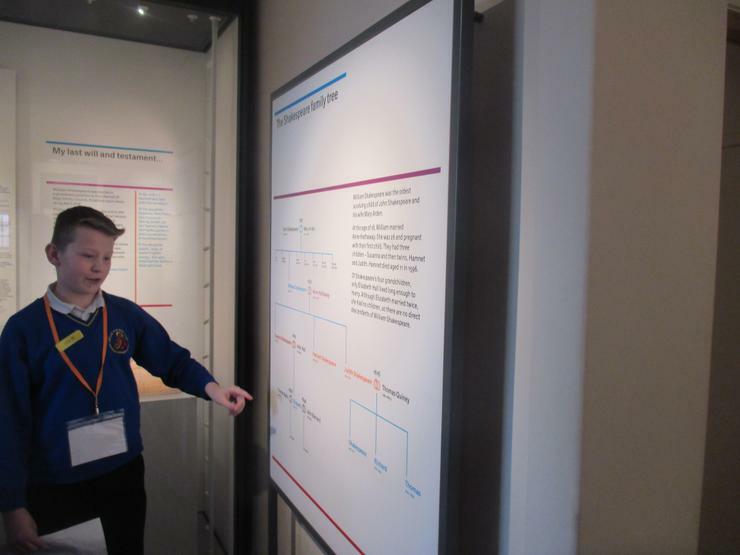 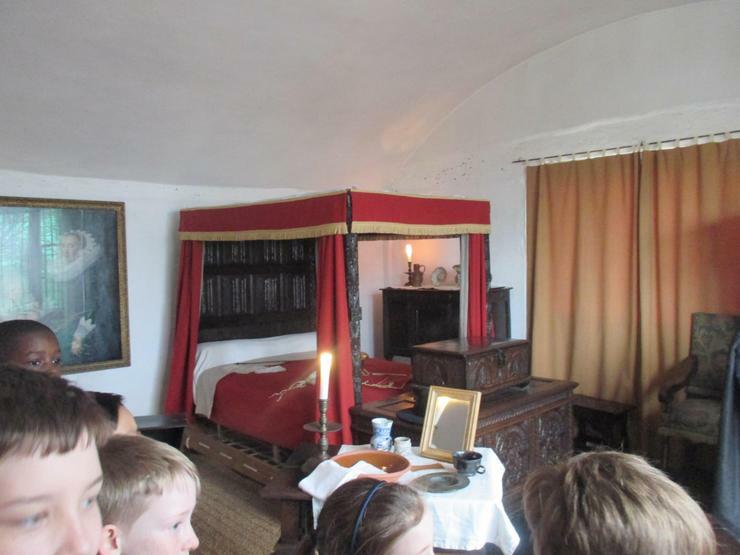 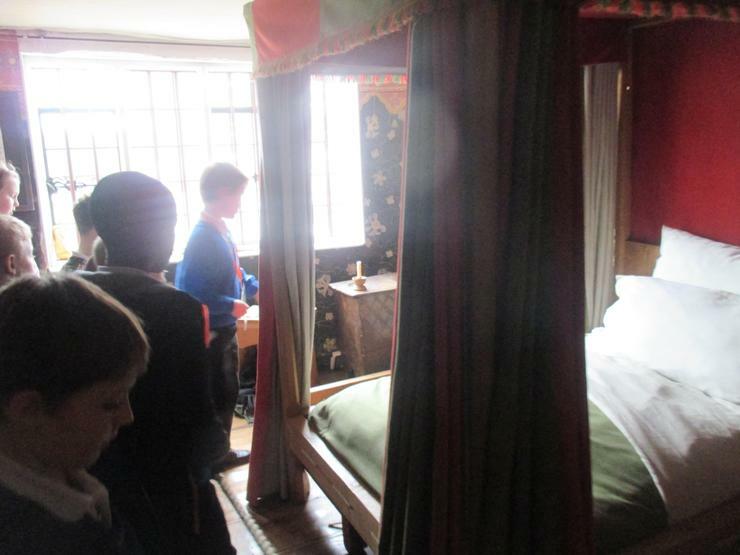 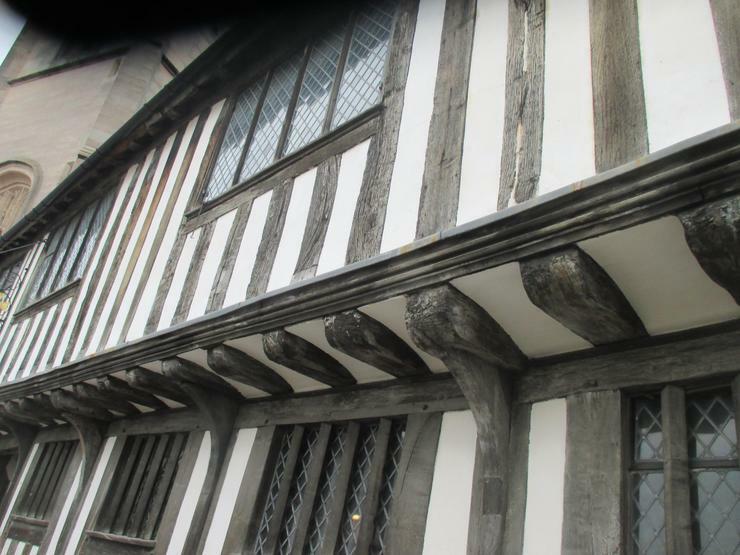 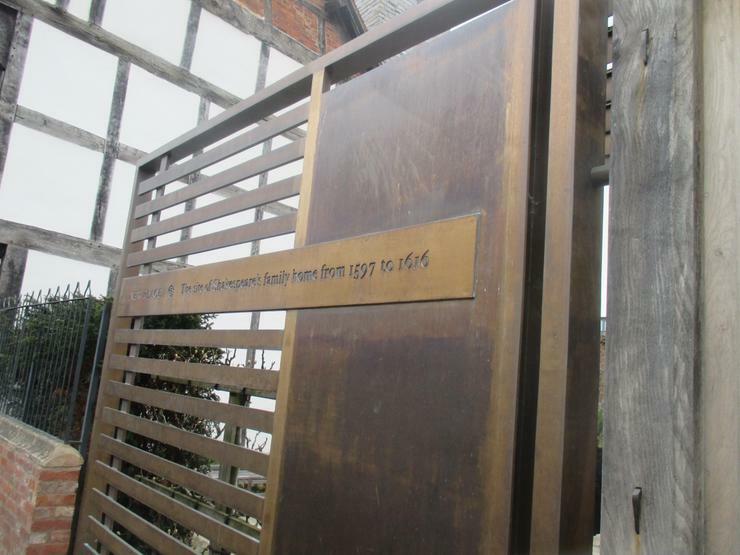 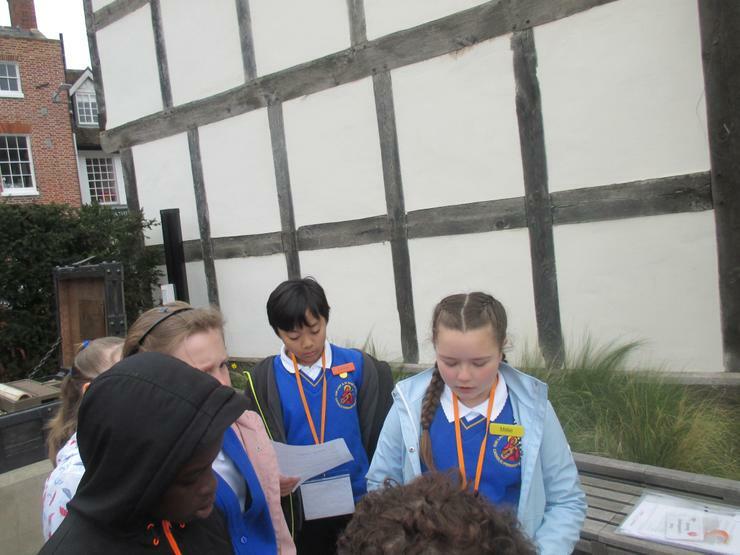 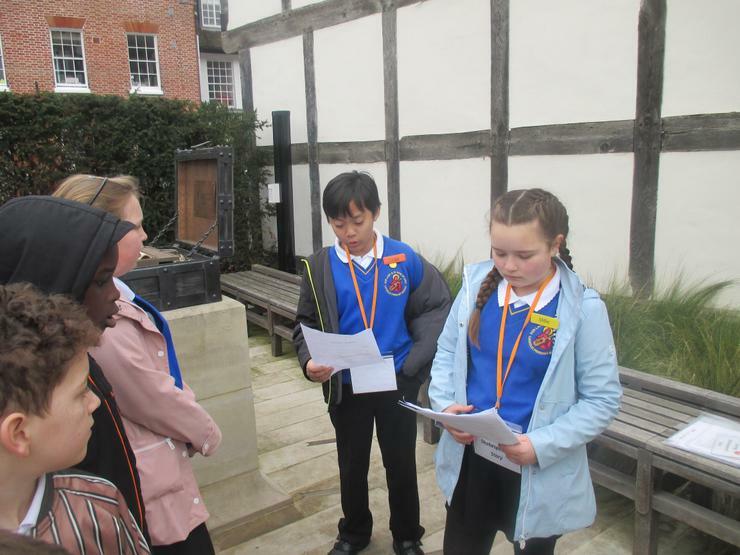 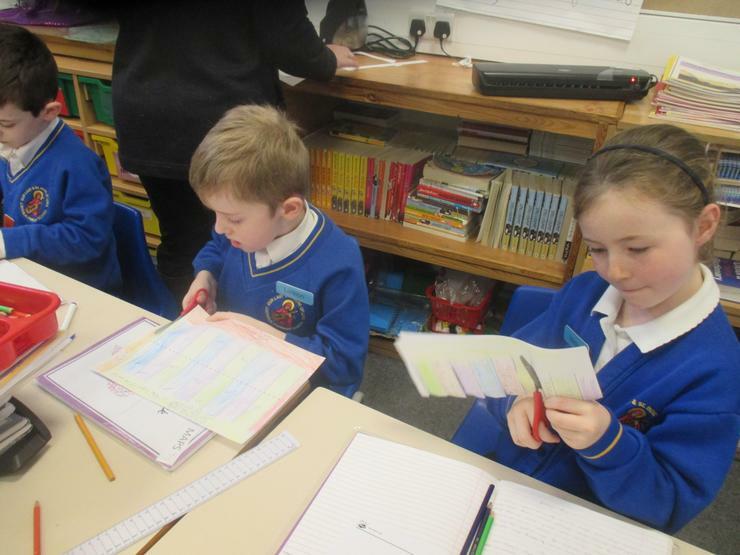 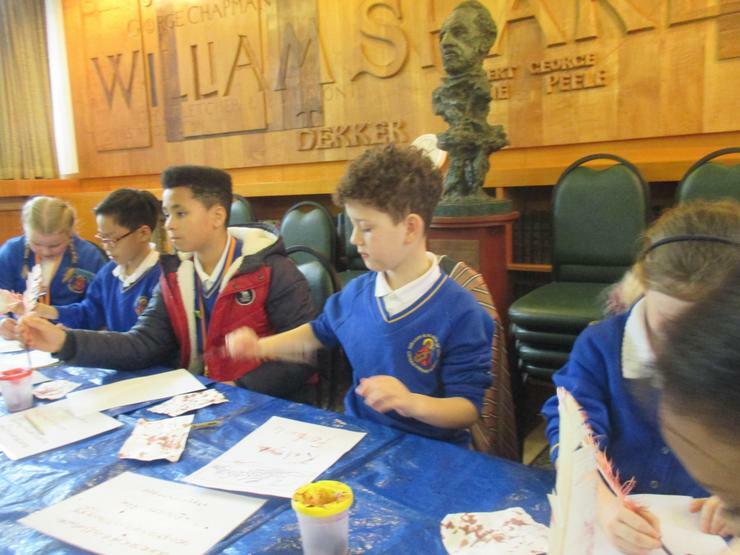 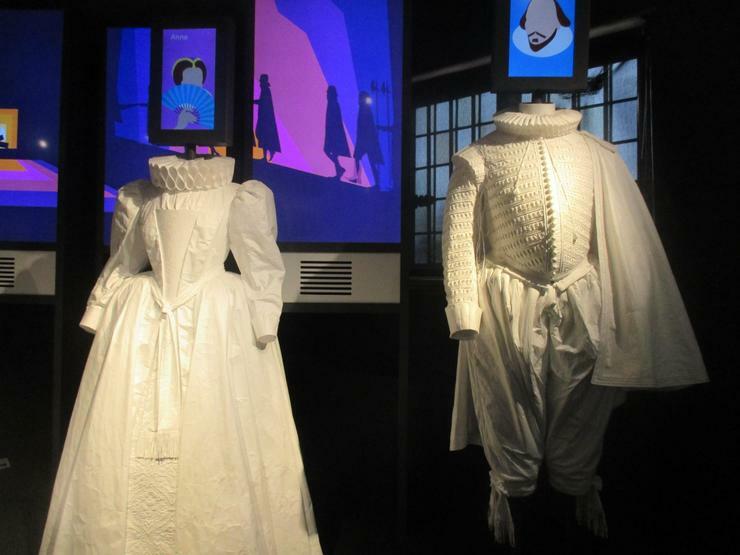 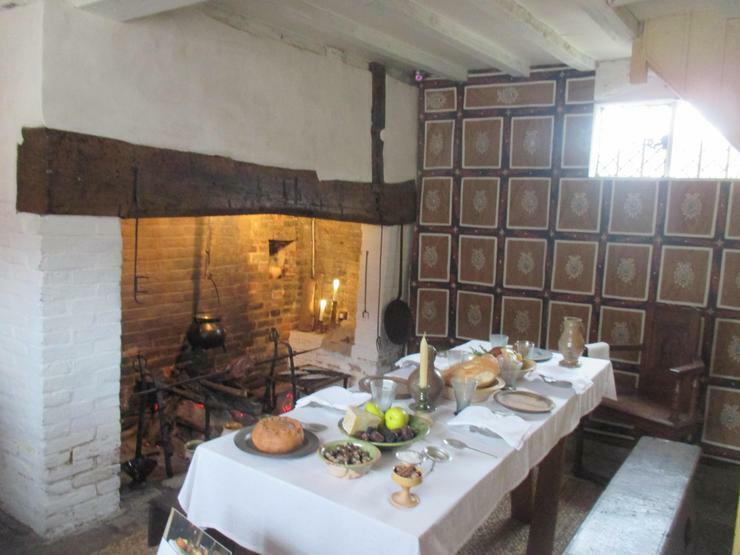 We have also explored facts about the famous playwright and his famous sonnets! 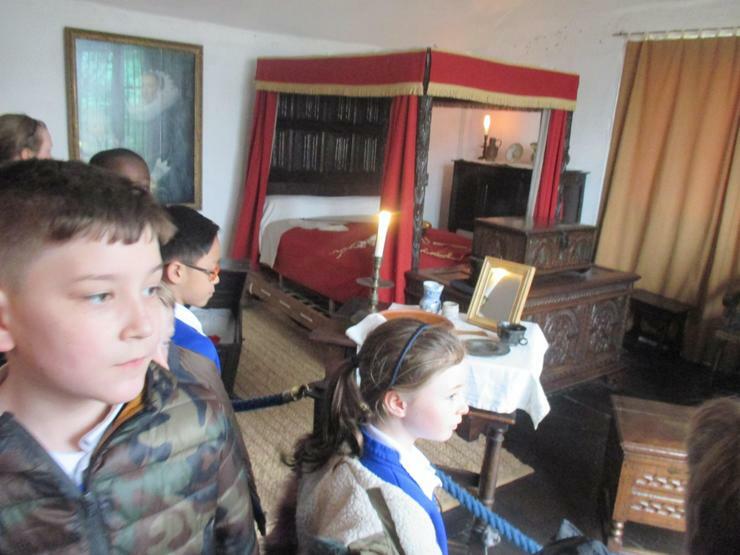 We all enjoyed visiting his birthplace and got so much from this wonderful experience. 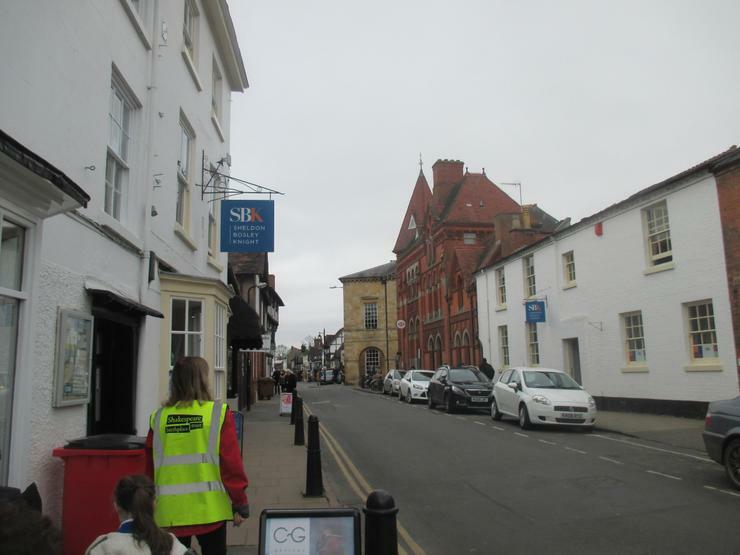 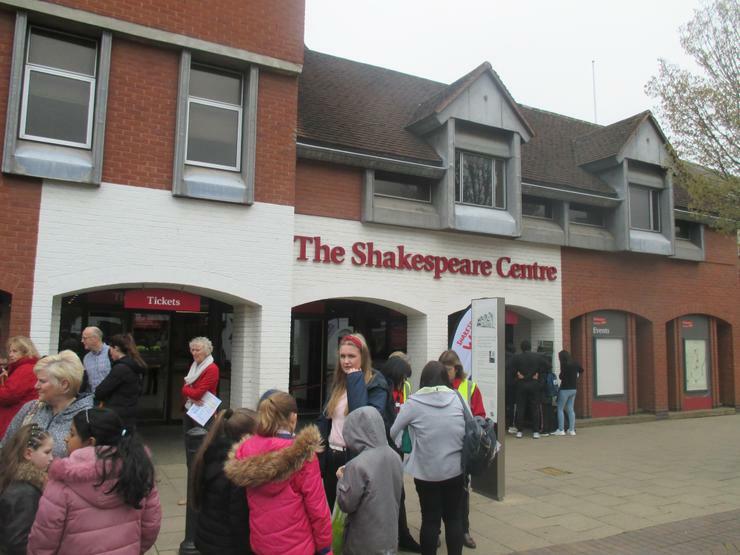 Special mention to Sofia, Giacomo and Aldin for being such confident and knowledgeable tour guides in Stratford! 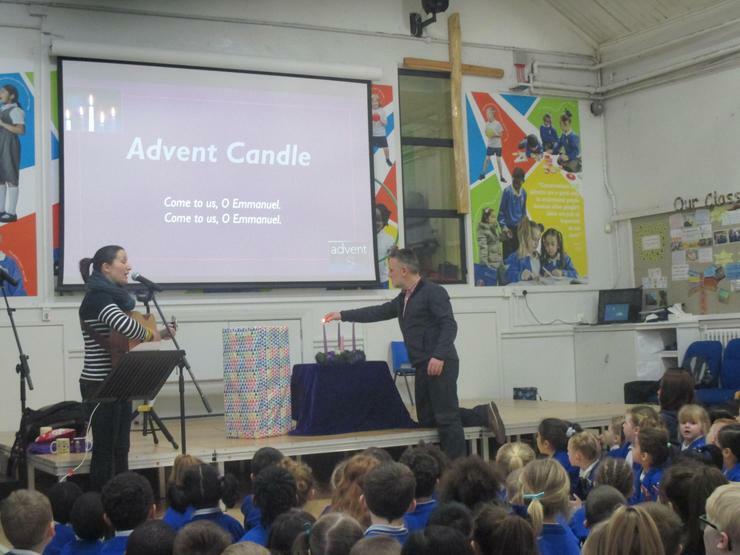 Jesus is the light of the world - R.E. 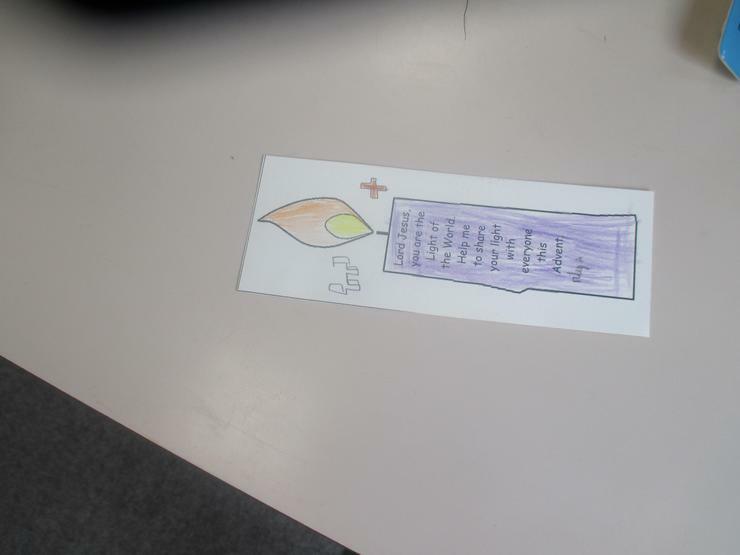 Within our R.E topic - Jesus is the light of the world, we have explored the event of Jesus' presentation in the Temple as a baby and the links to Candlemas in the Church. 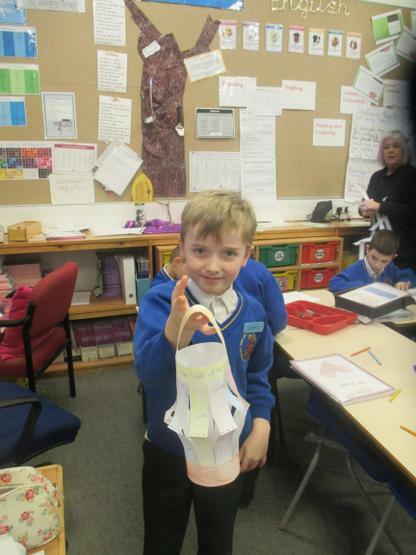 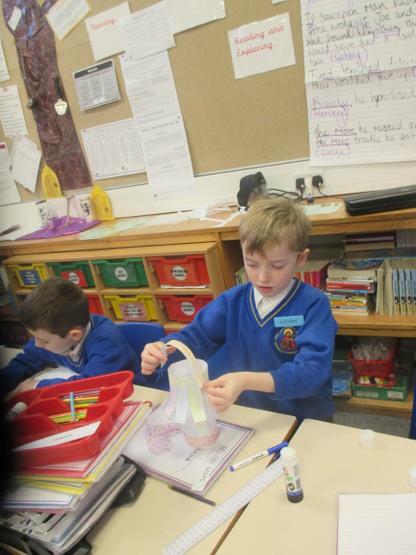 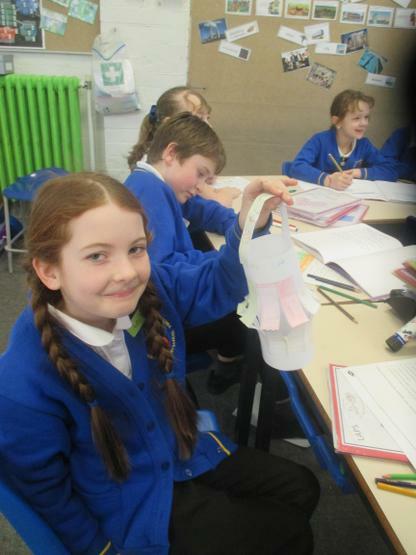 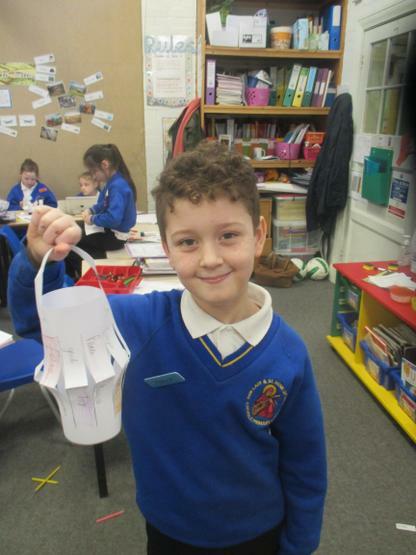 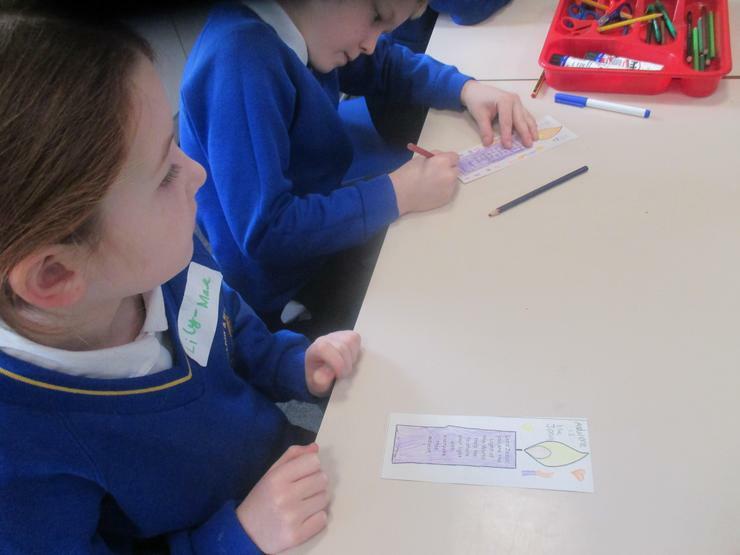 In our reflection lesson, we meditated how Jesus is a light in our lives and created a lantern each. 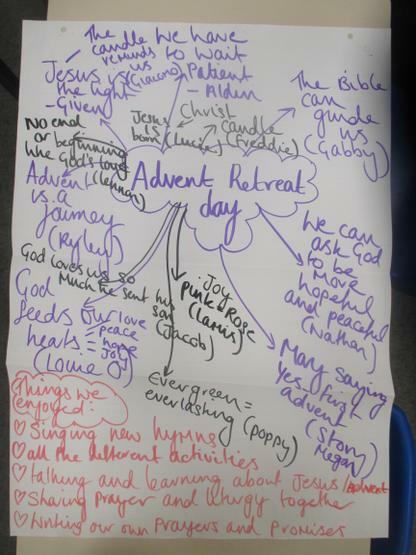 This has now become our prayer focus to remind us that Jesus' guides us every day. 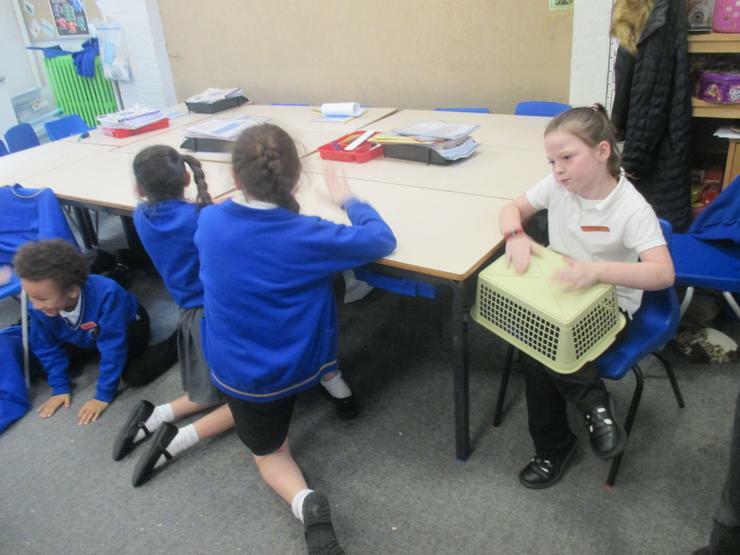 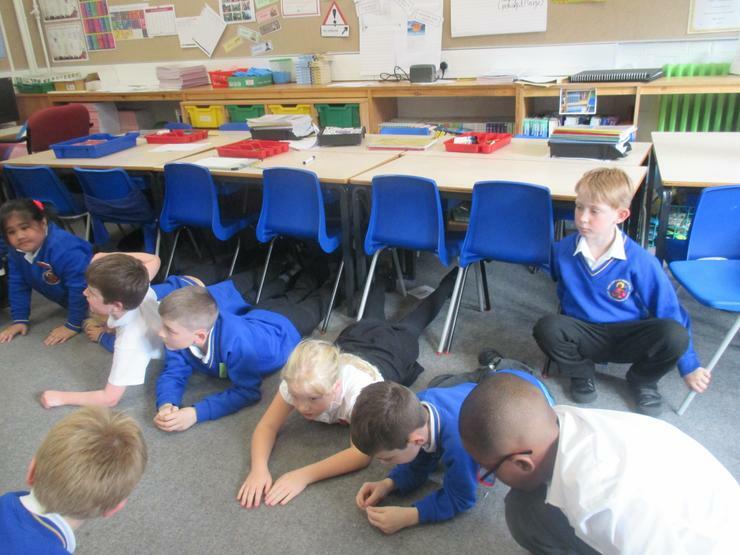 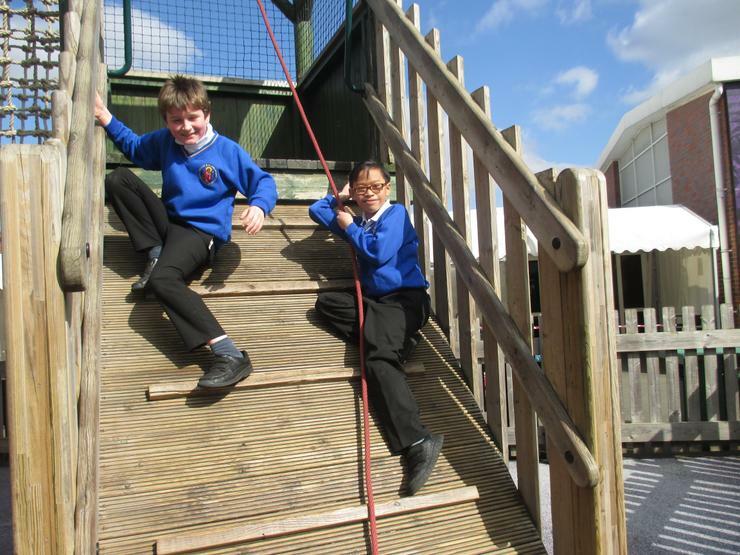 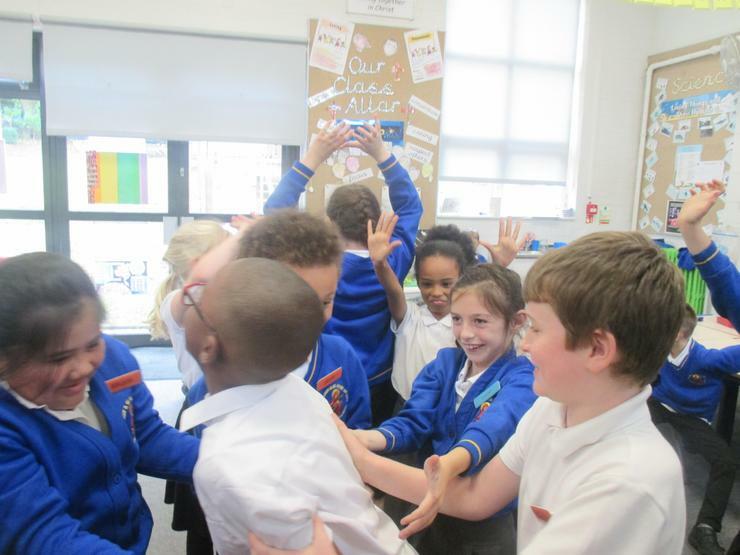 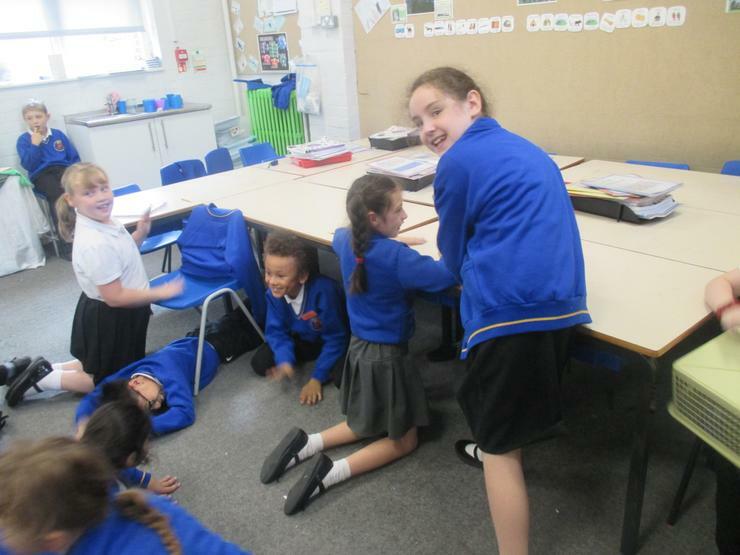 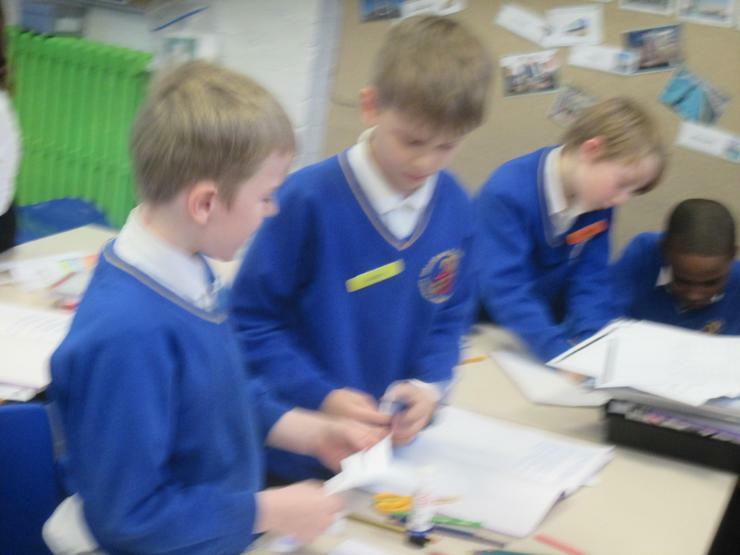 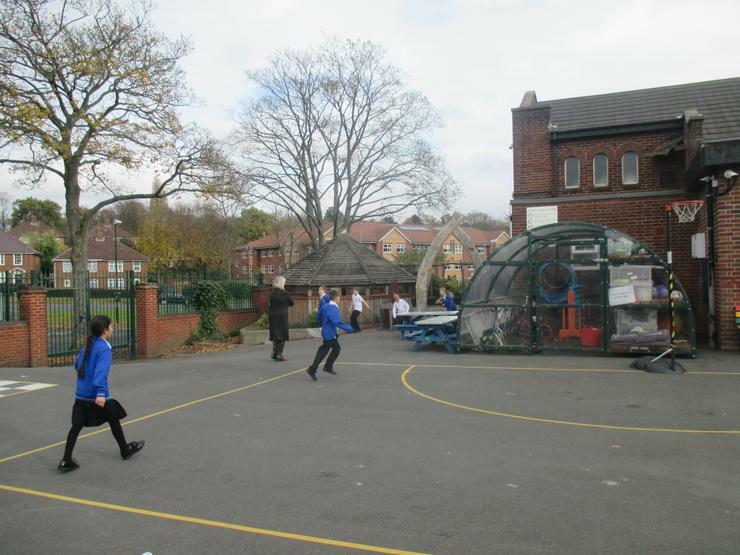 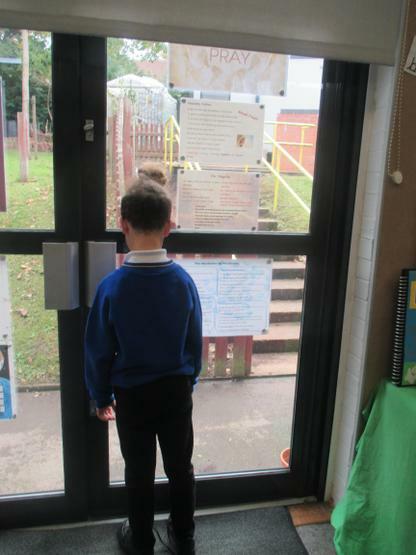 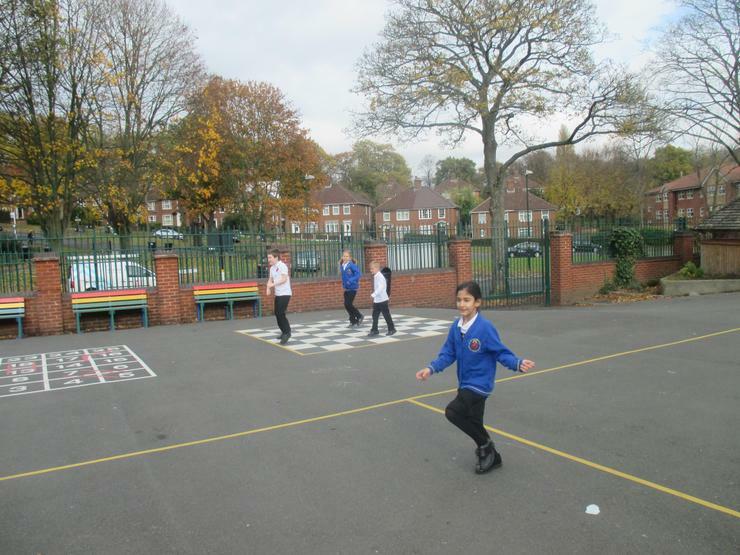 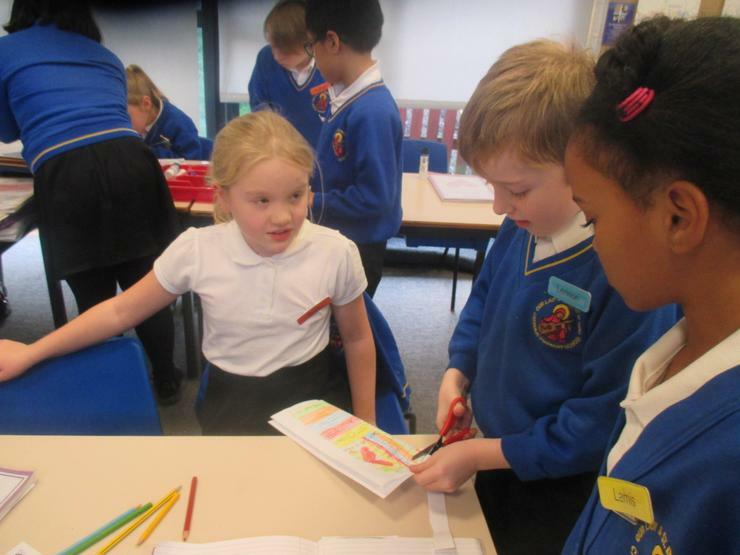 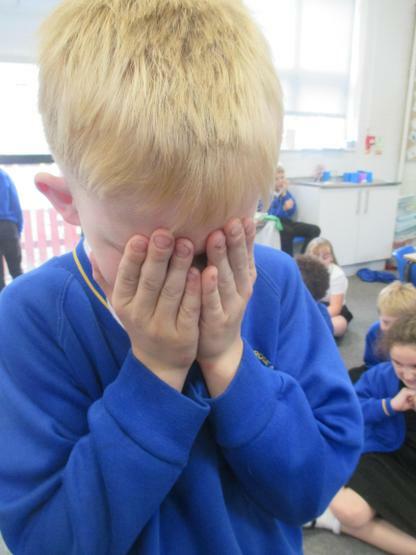 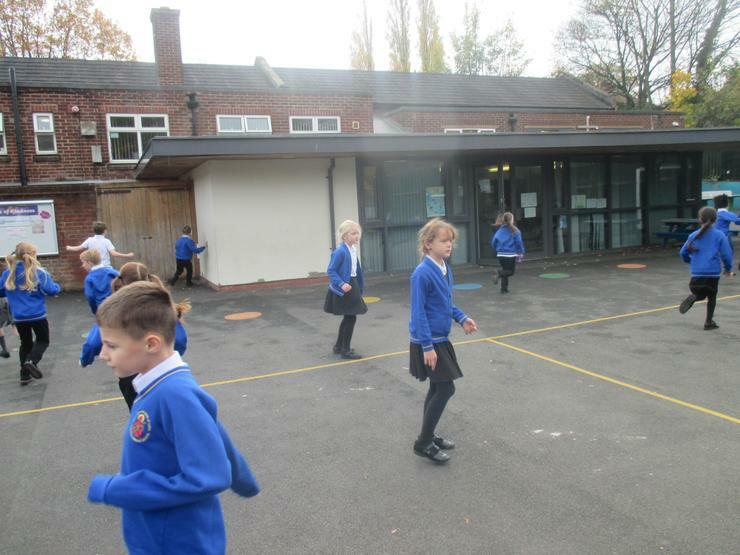 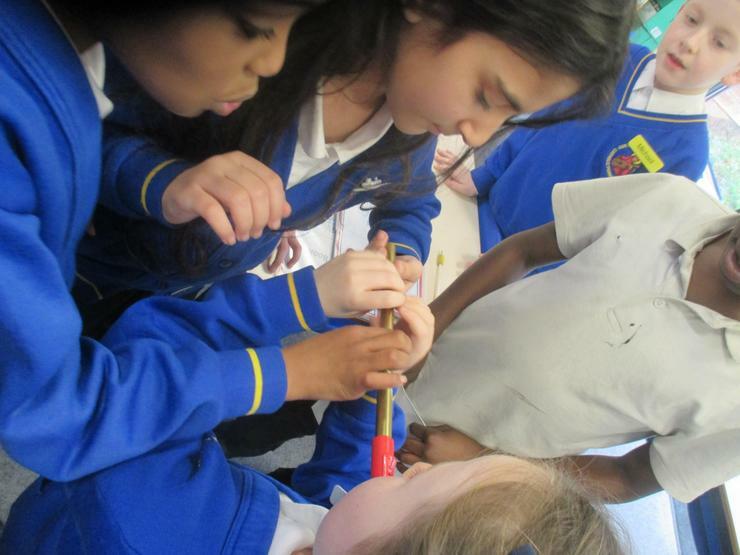 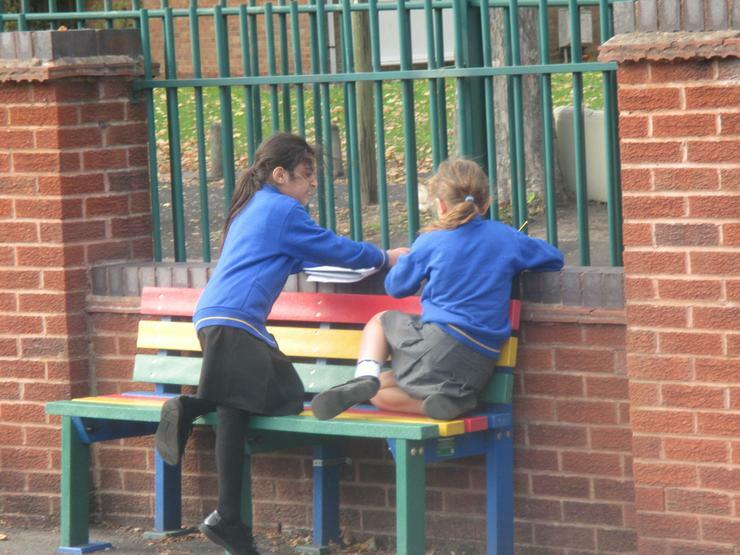 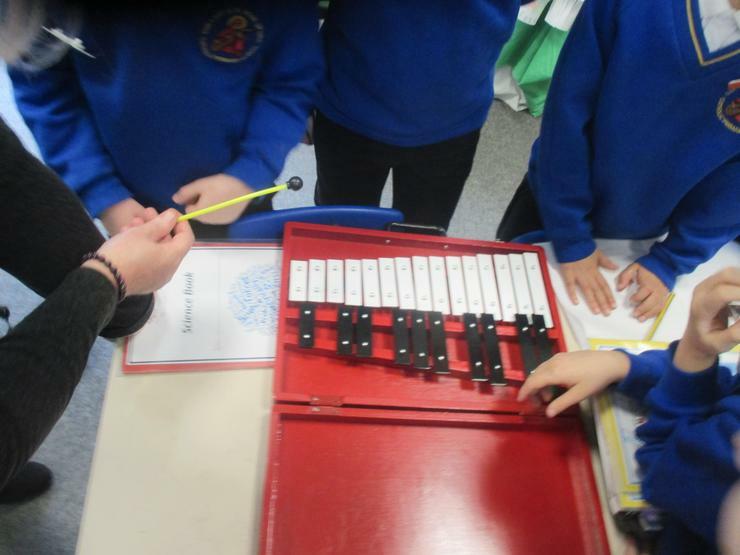 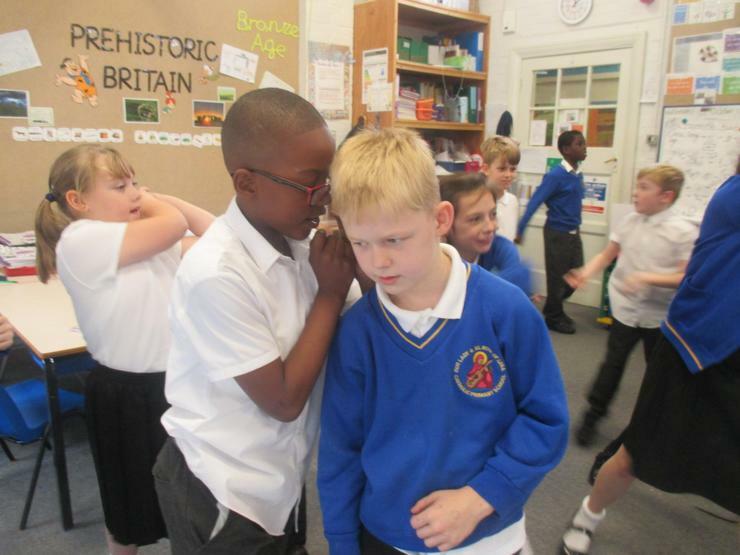 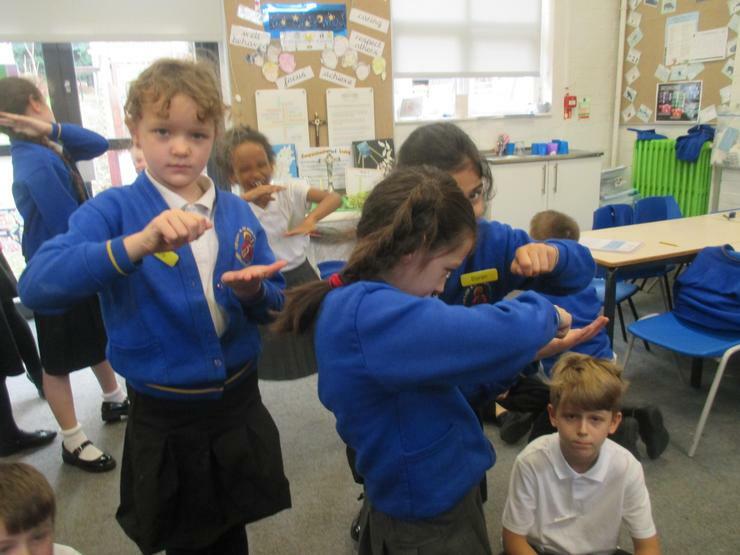 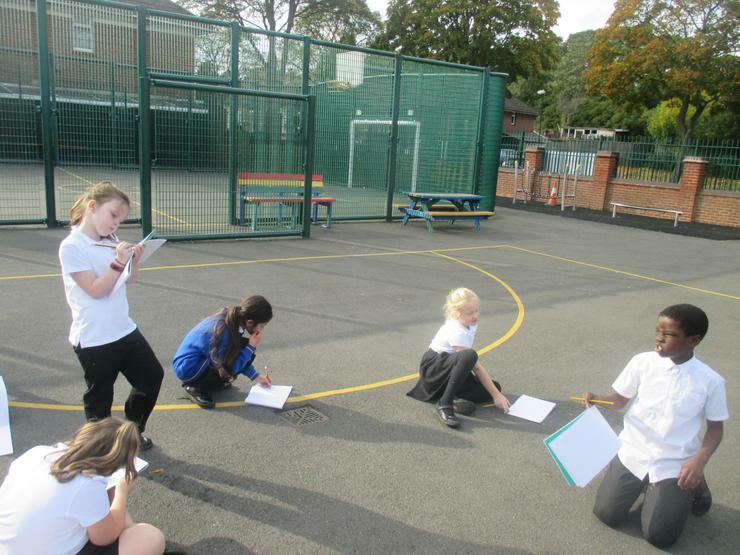 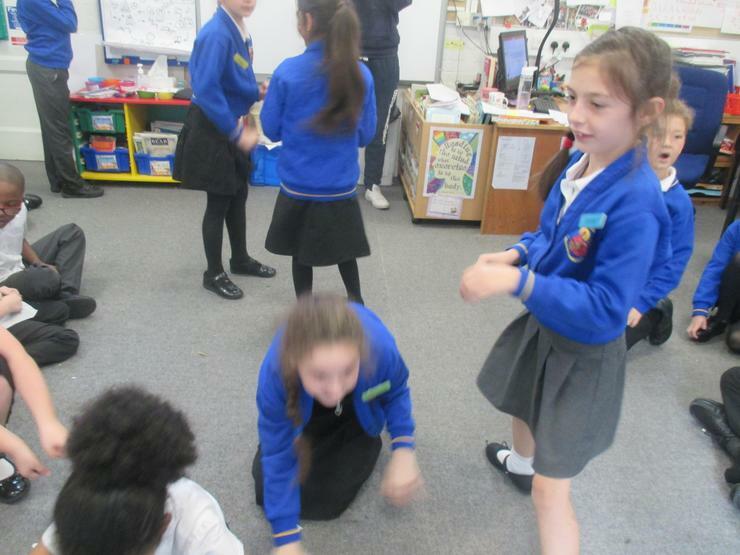 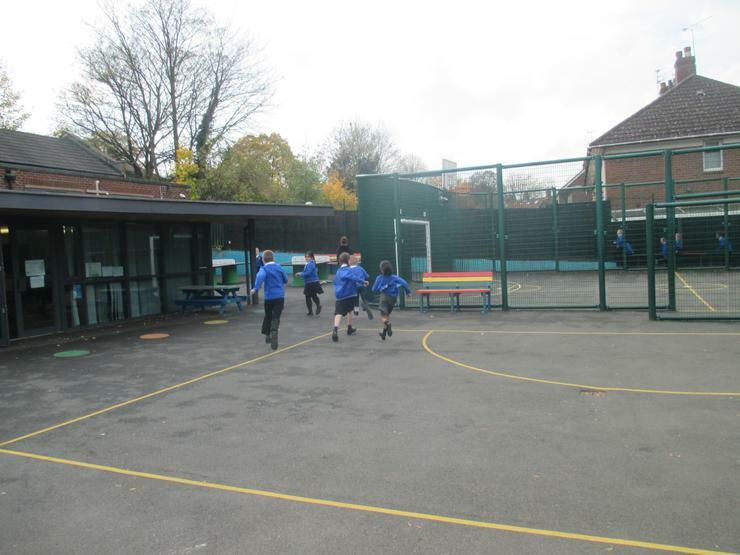 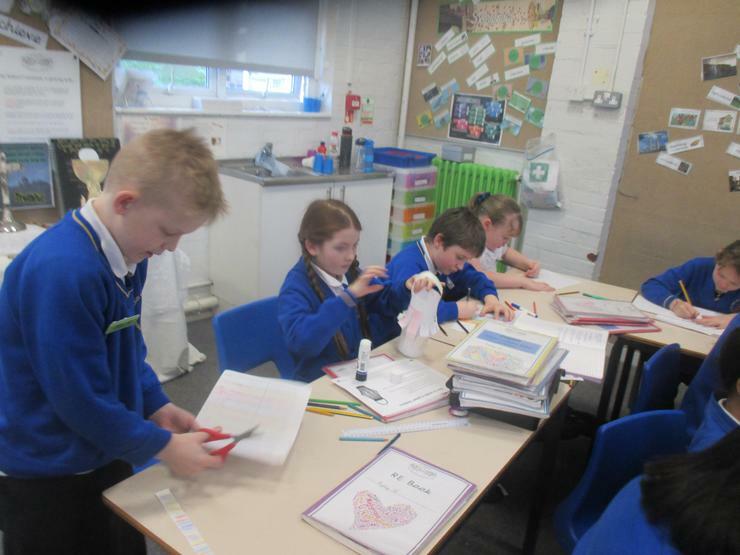 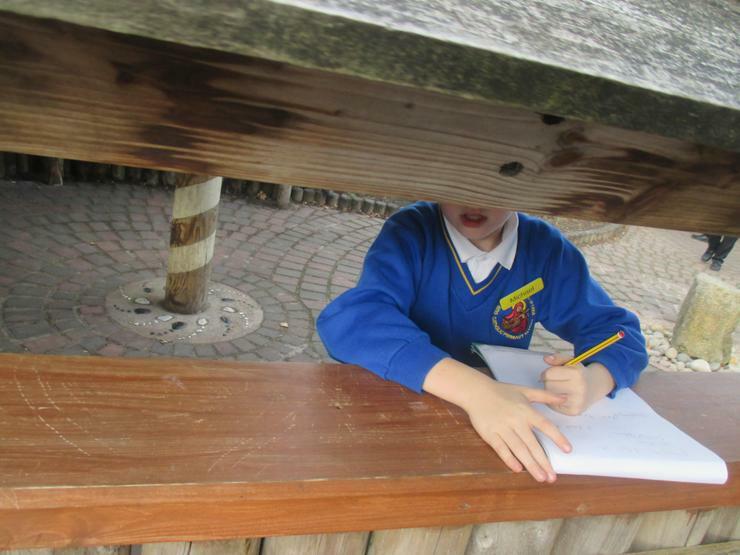 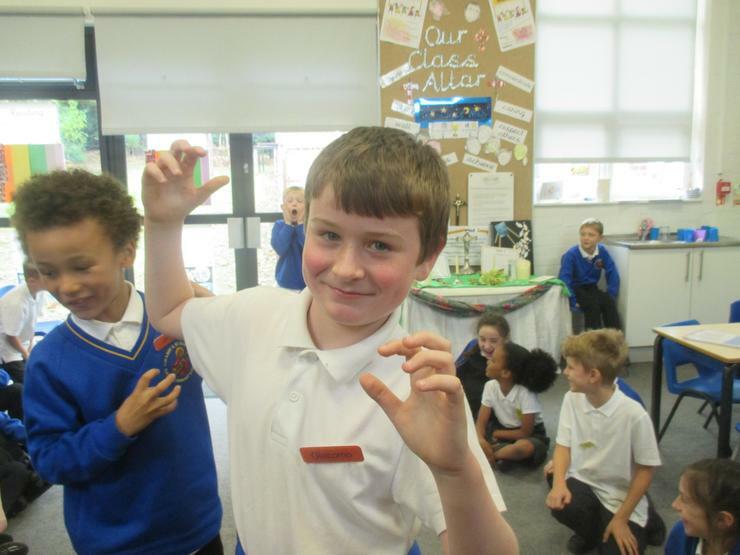 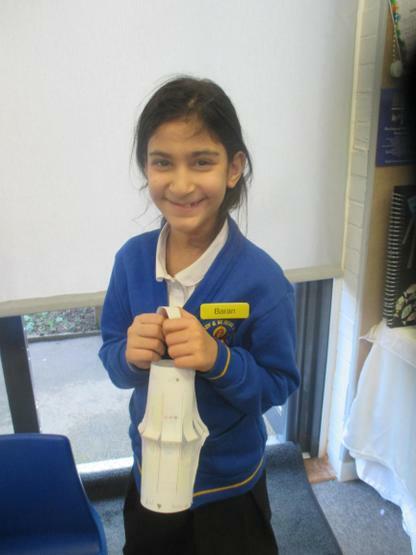 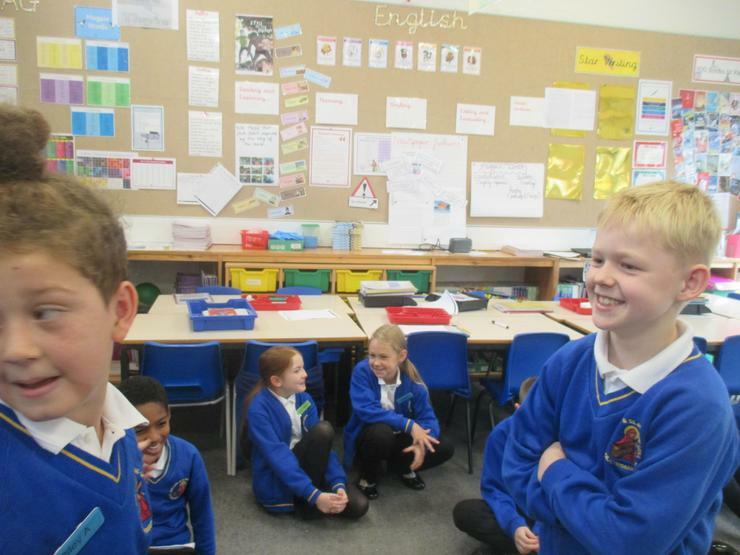 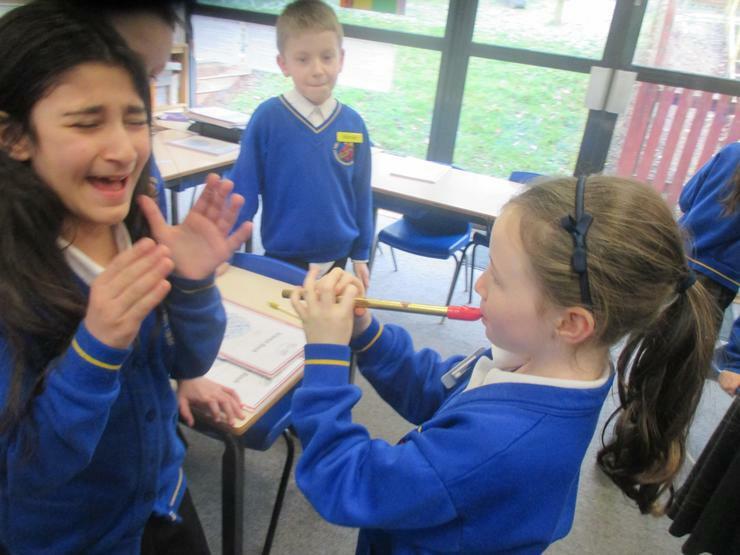 There were some strange sounds heard around the school as Year 4 investigated Pitch in Science. 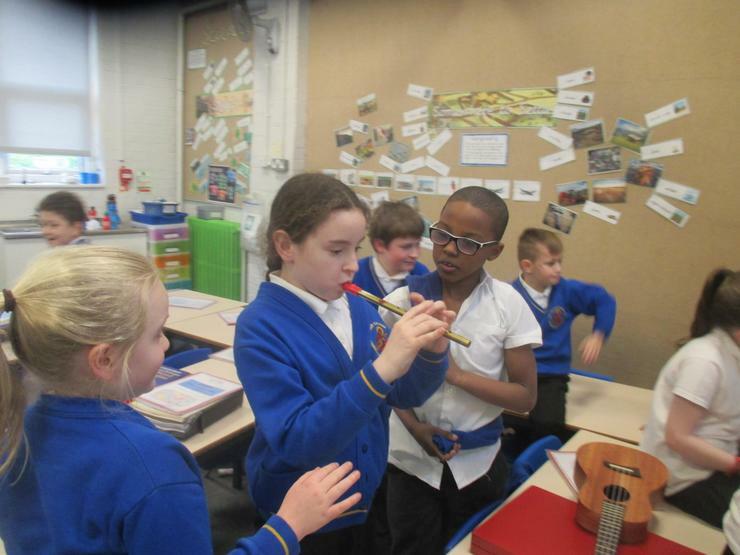 We demonstrated our own pitch abilities and then worked with music instruments to explore the different ways we get high and low pitch. 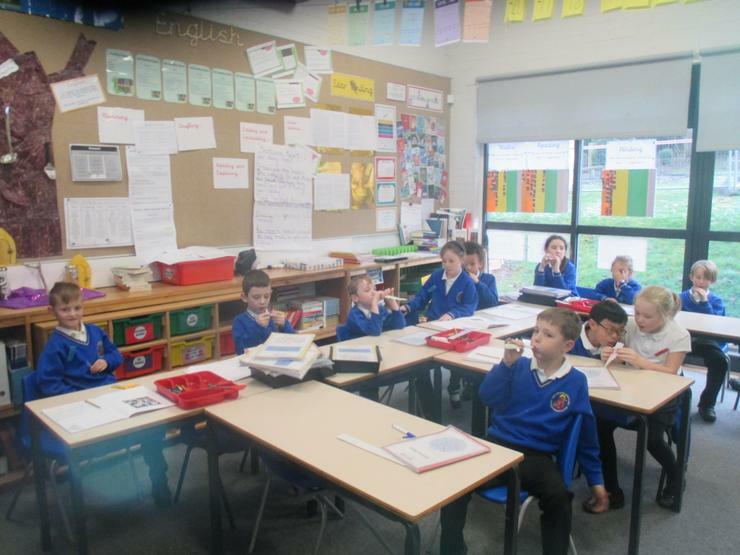 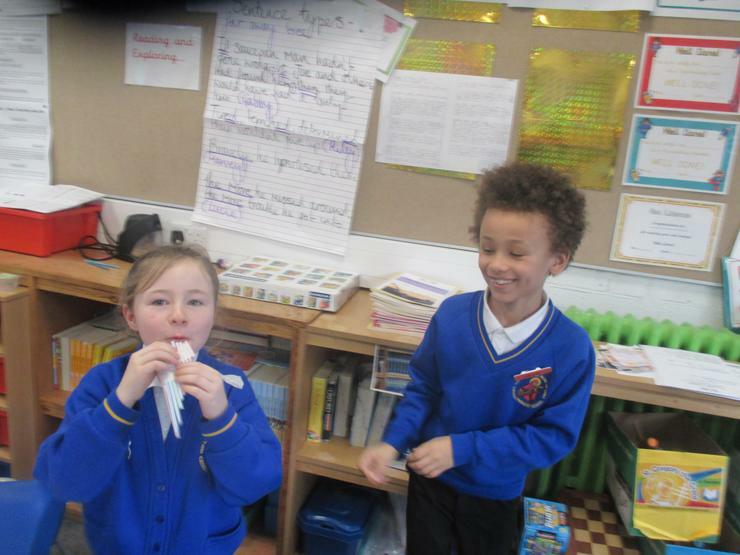 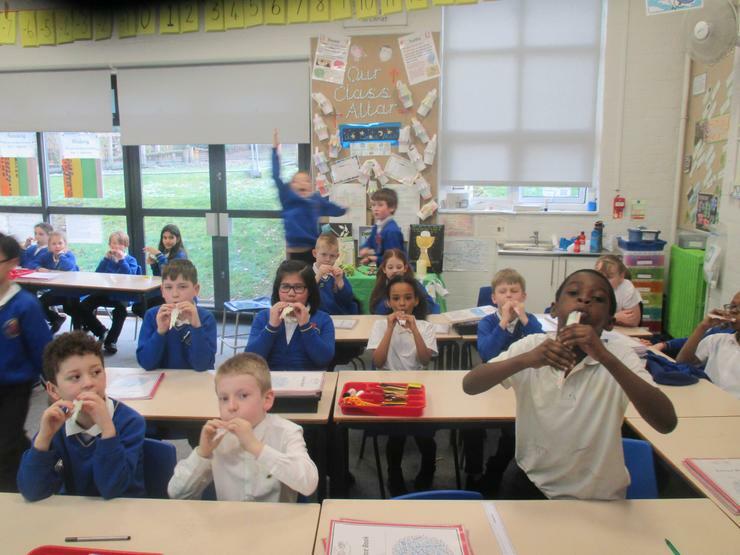 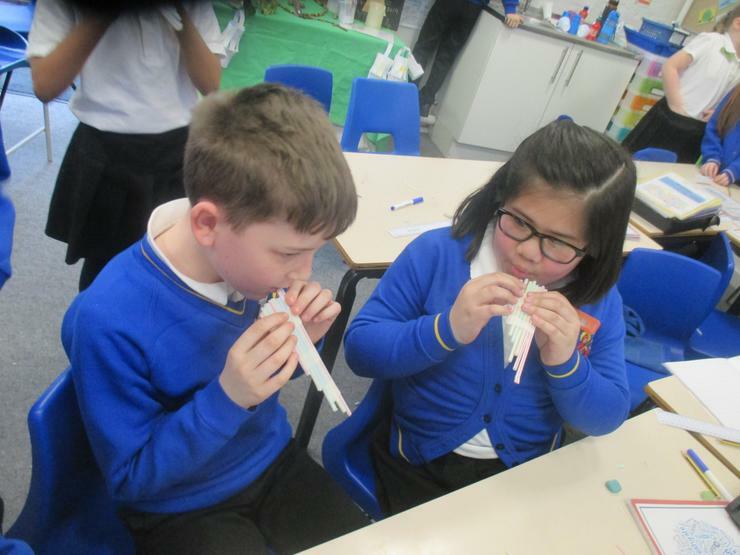 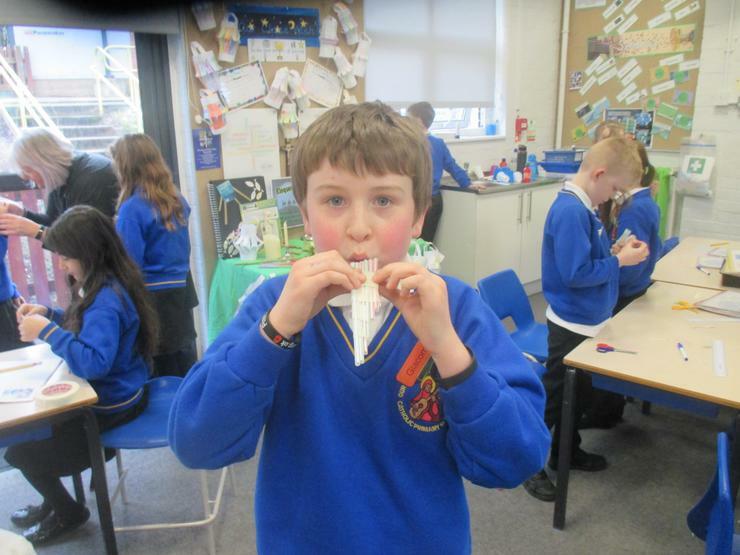 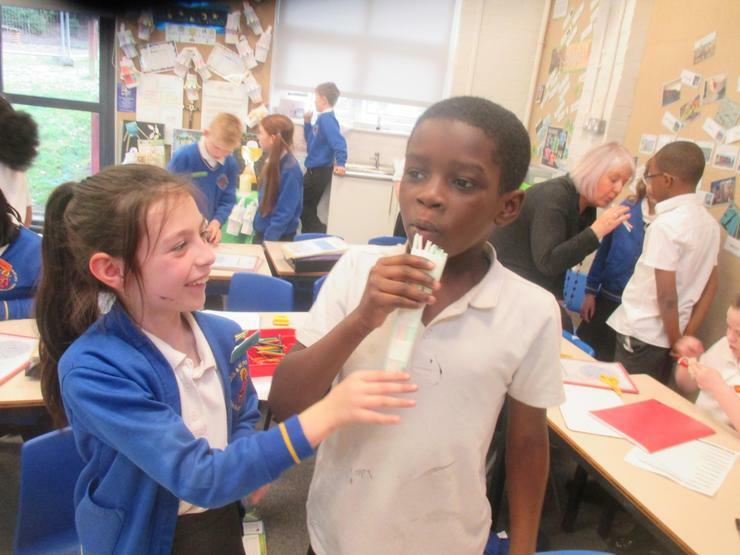 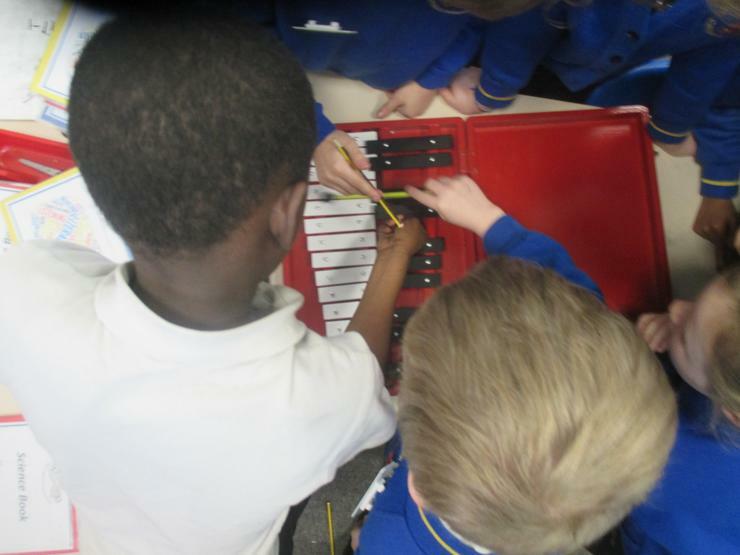 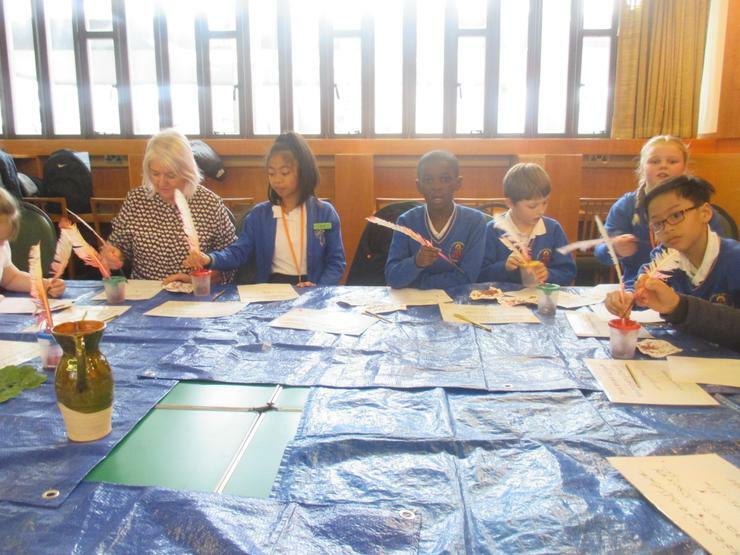 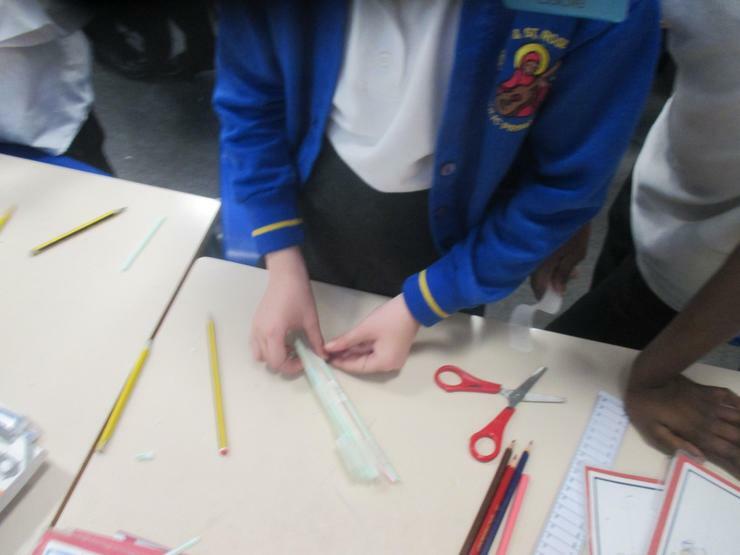 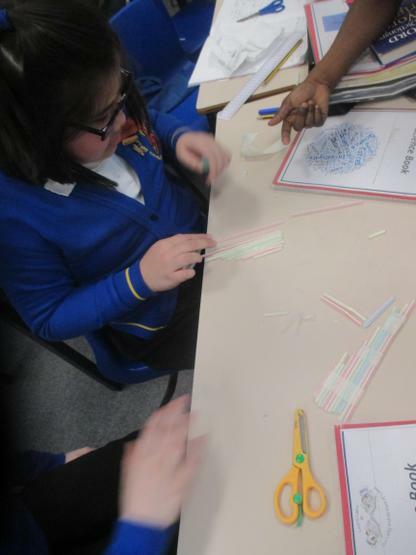 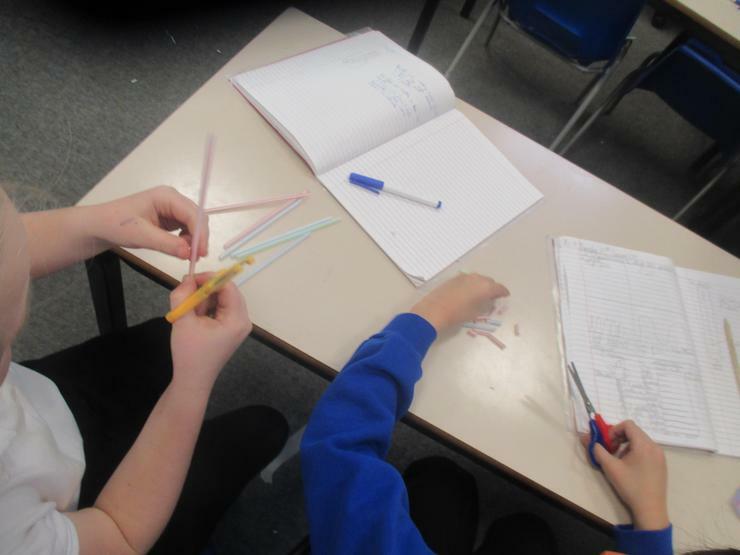 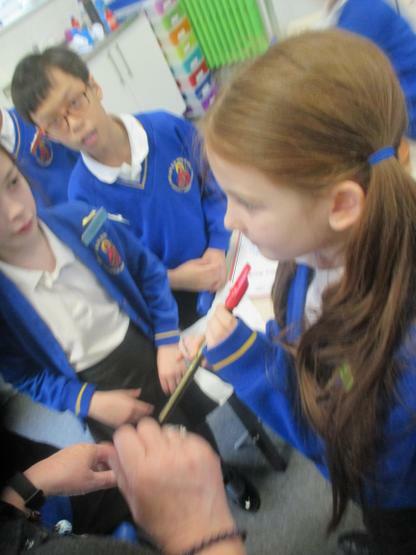 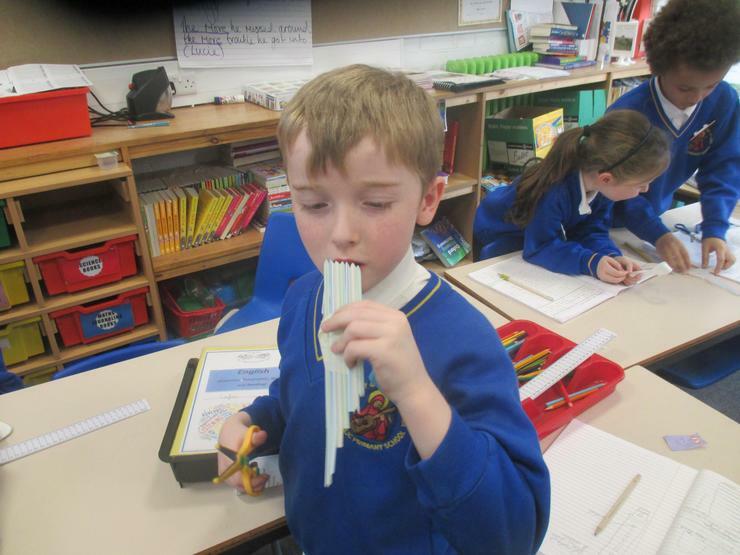 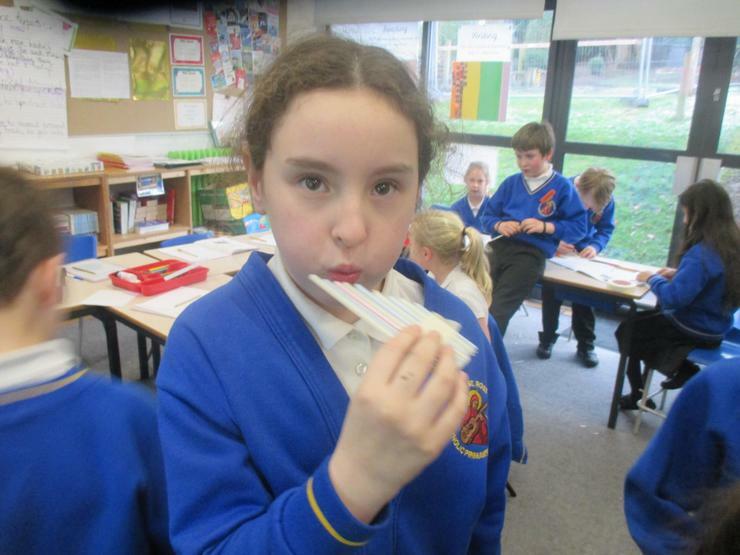 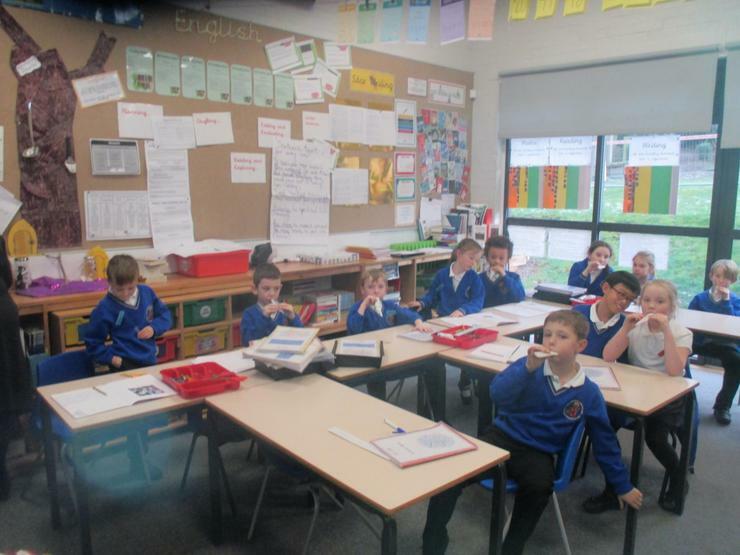 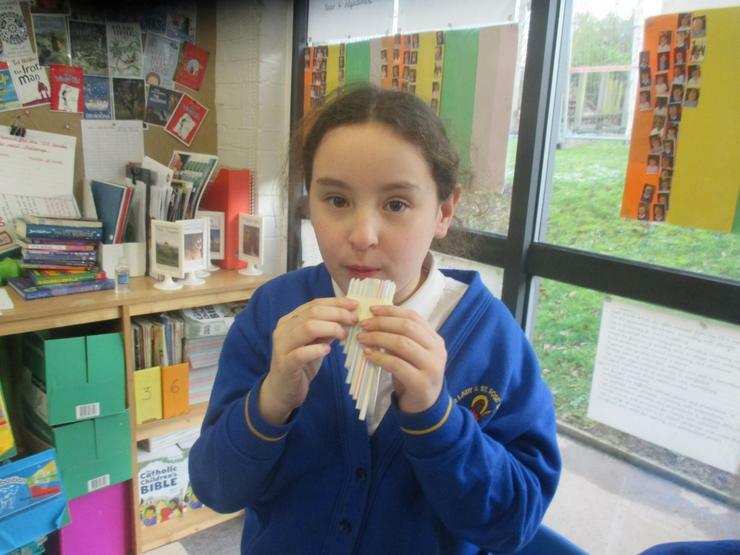 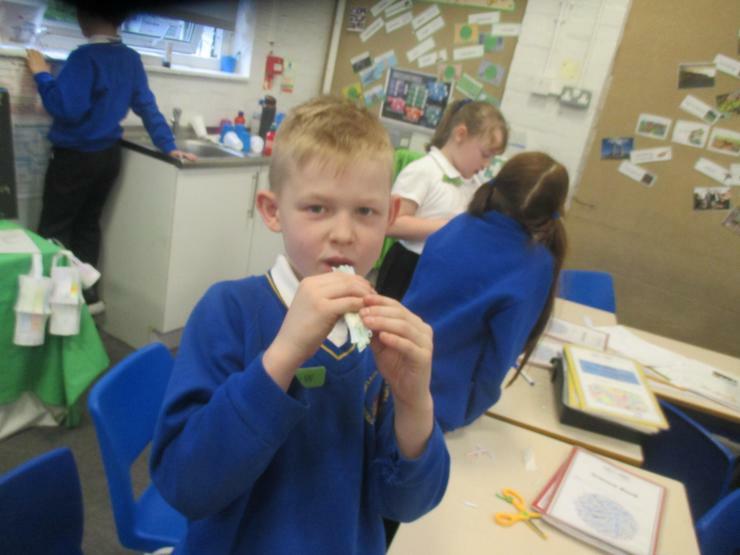 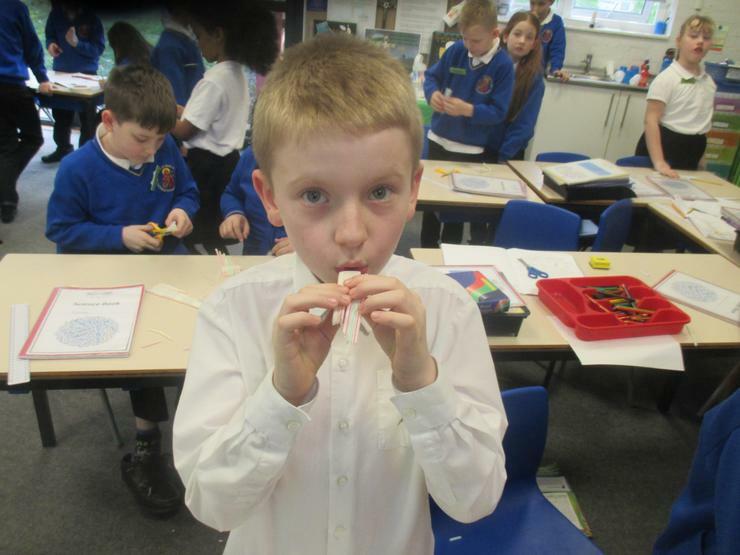 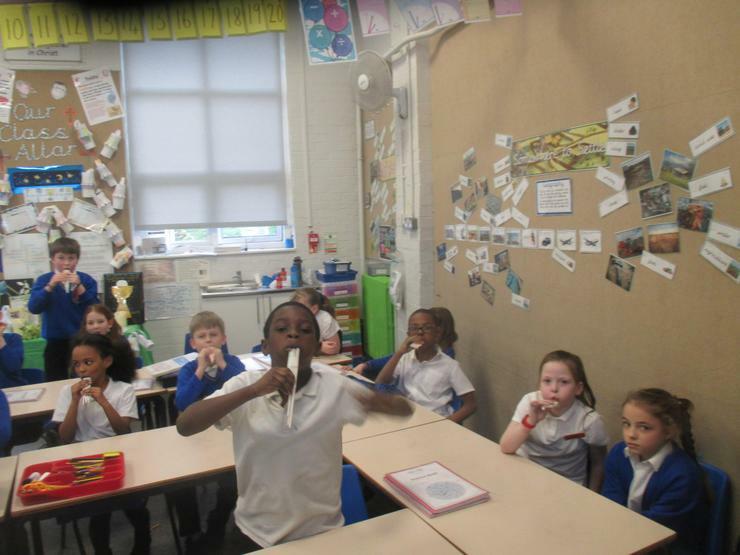 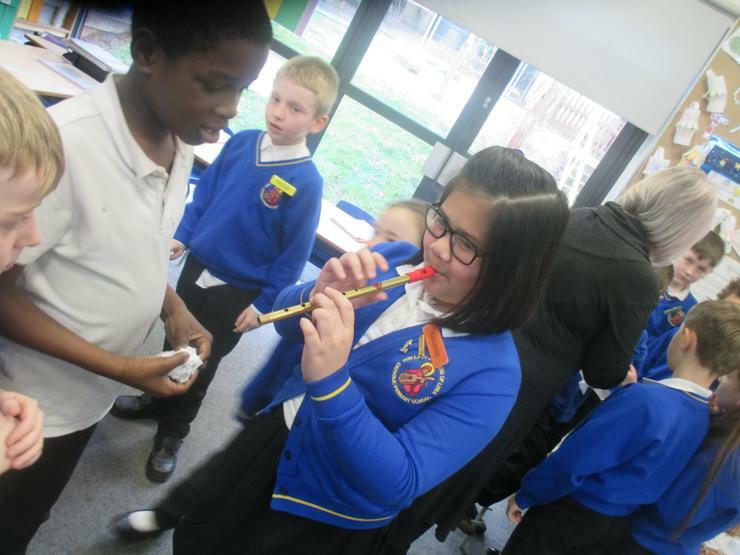 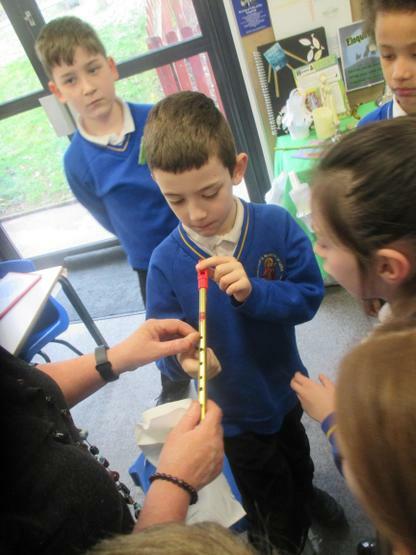 We then turned our hands to making Pan Pipes from straw to get the desired pitch and all learned a lot! 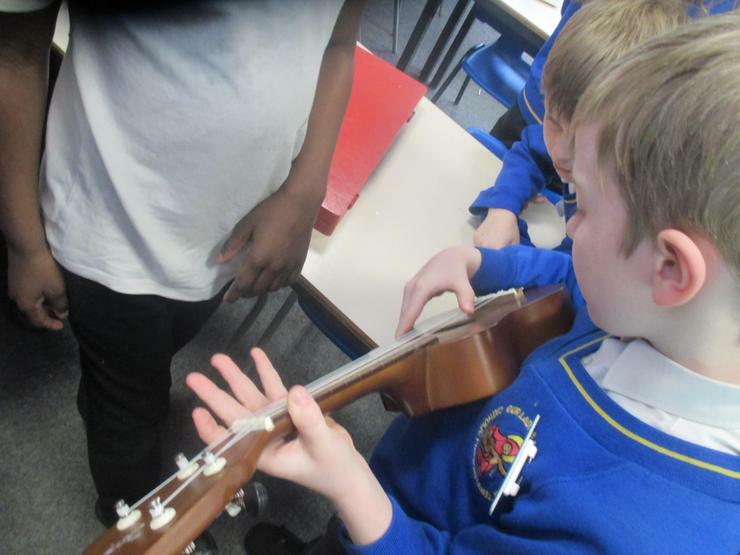 After the success of our first term learning Ukulele, we are so fortunate to continue our lessons with him every Friday. 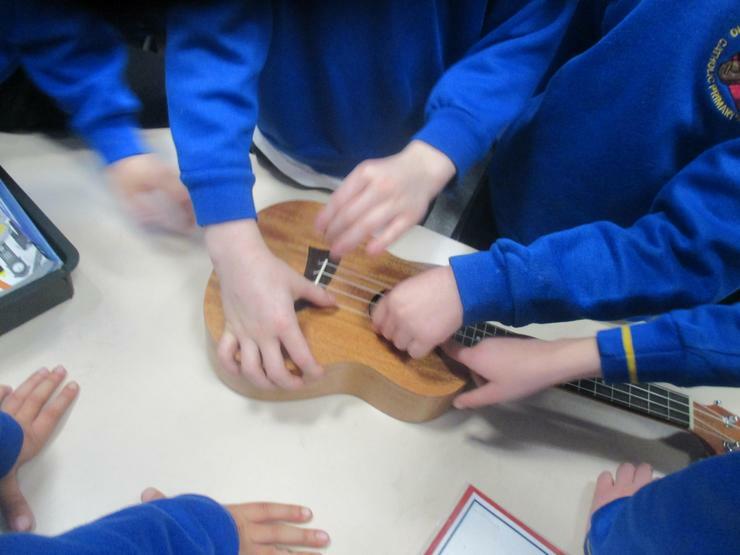 We have learnt the basics such as tuning, strumming and plucking and now learning longer songs. 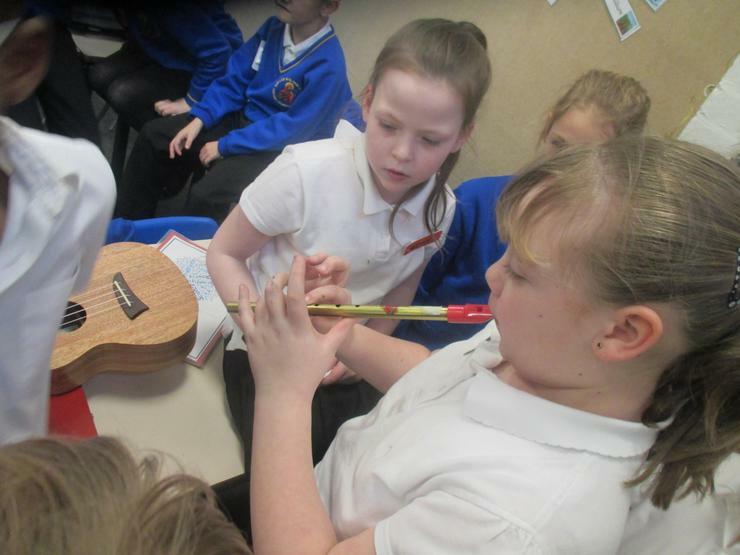 We thank God for the fantastic gift of music and the talents he helps us develop. 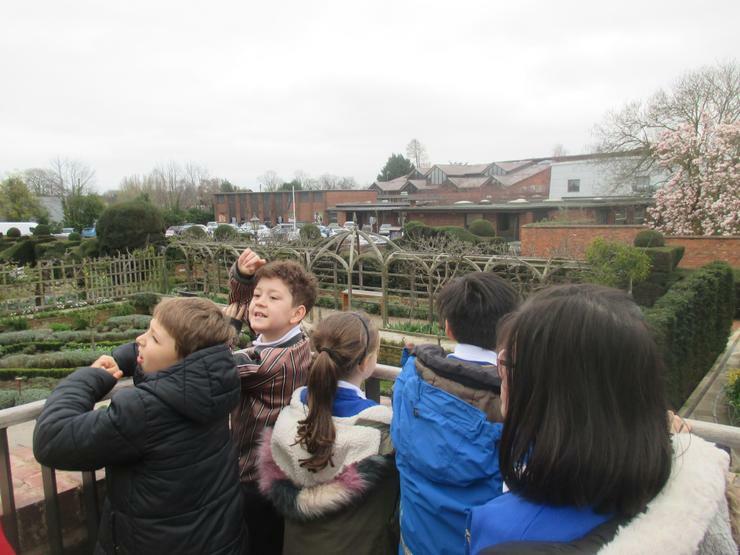 We are always amazed by God's world and his awesome creation. 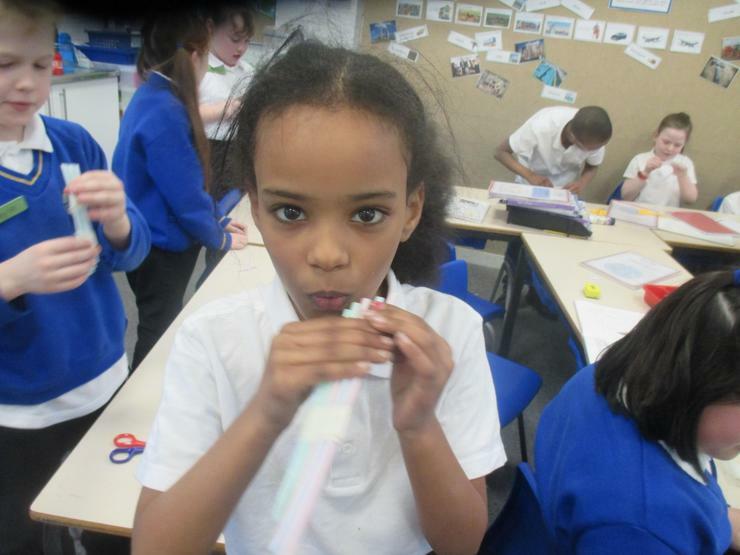 In Science, we are exploring the concept of sound. 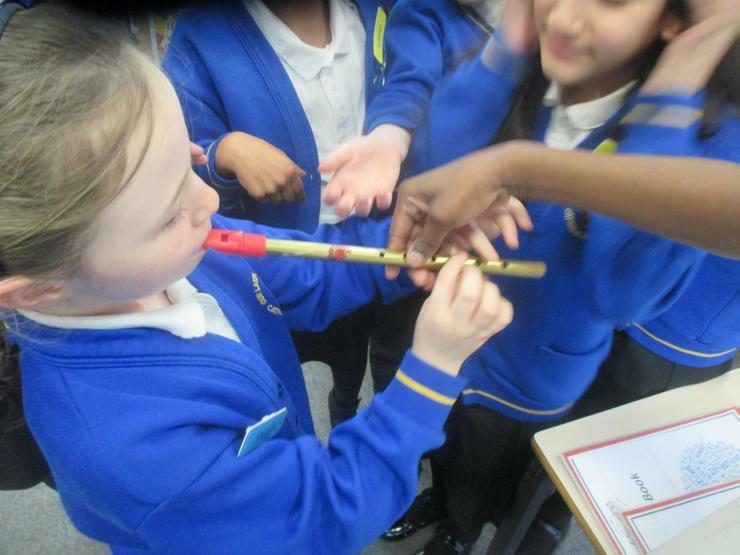 We explored vibrations and how it is those that make a sound for us to hear. 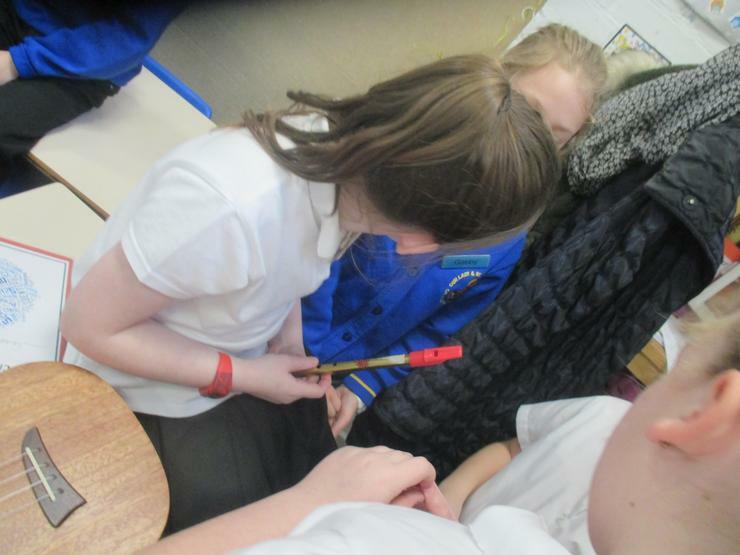 We did this through several investigations so that we were able to see the vibration, making the noise. 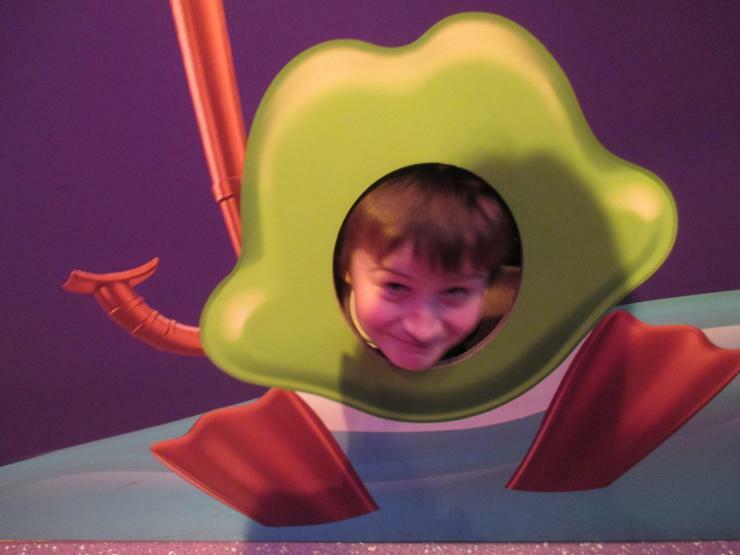 I hope you all had a wonderful break! 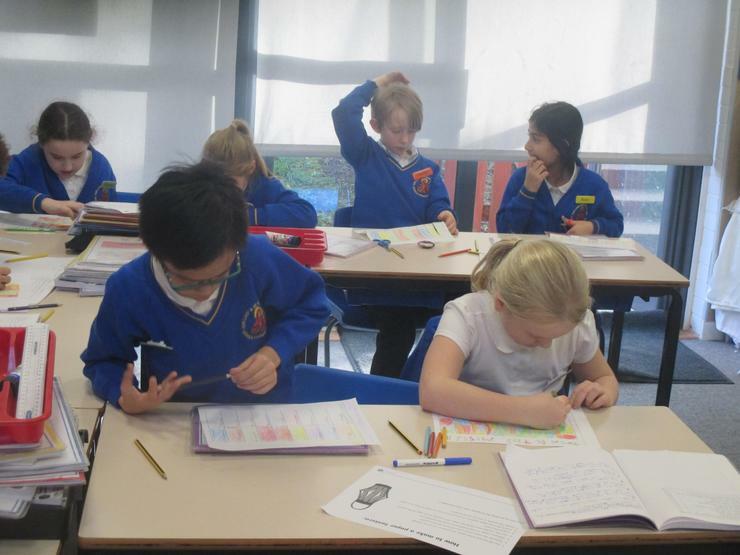 We are back, ready for a fantastic 2019 in Year 4. 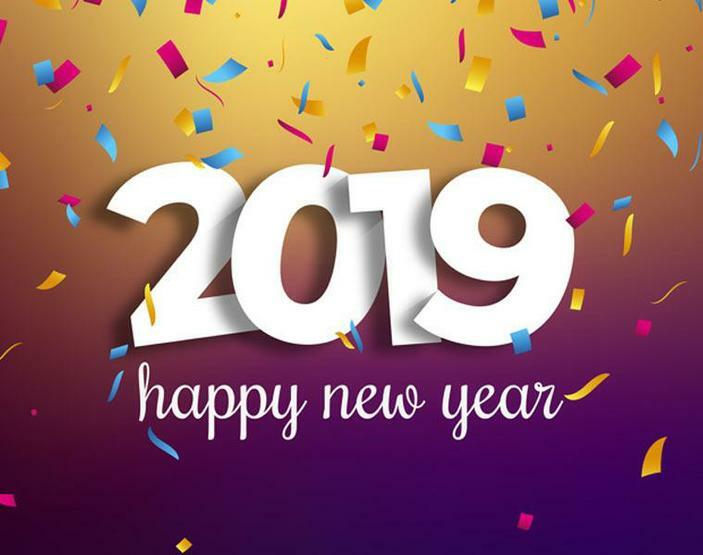 May God bless all of our endeavours and guide us throughout this academic year to success. 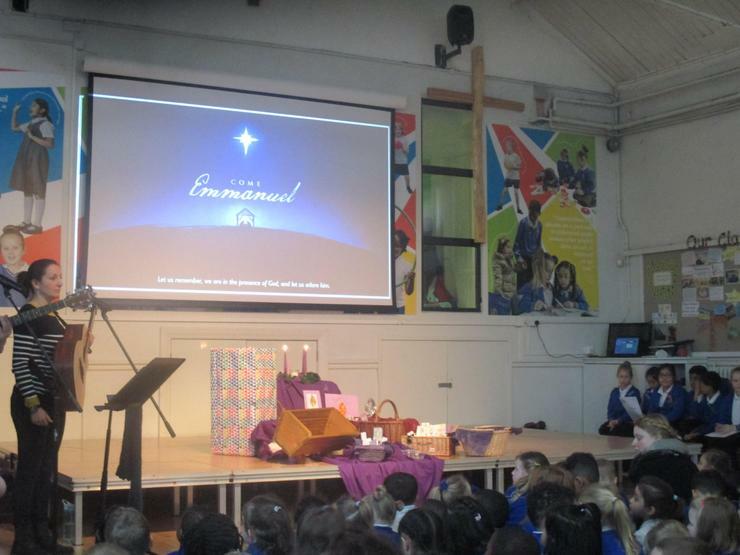 After two weeks of rehearsals and learning lines KS2 and Year 2 performed our Christmas performance in the Church. 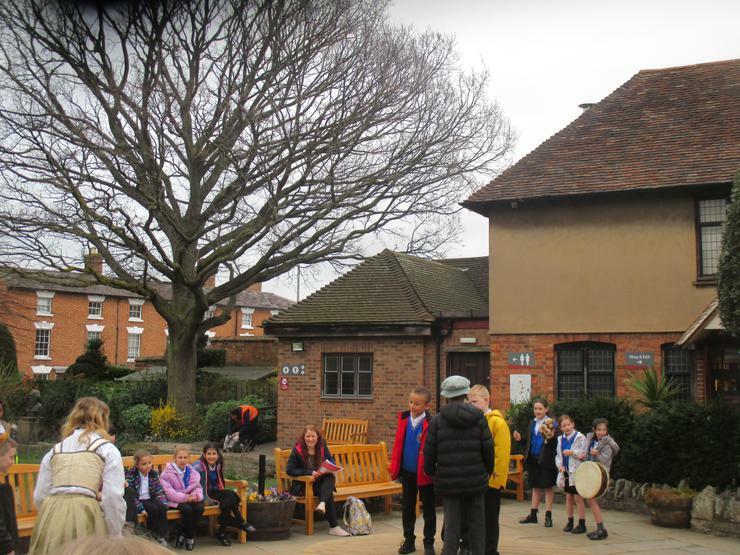 It was the perfect setting to retell the nativity story and reflect on the true meaning of Christmas through Carols, readings and reenactment. 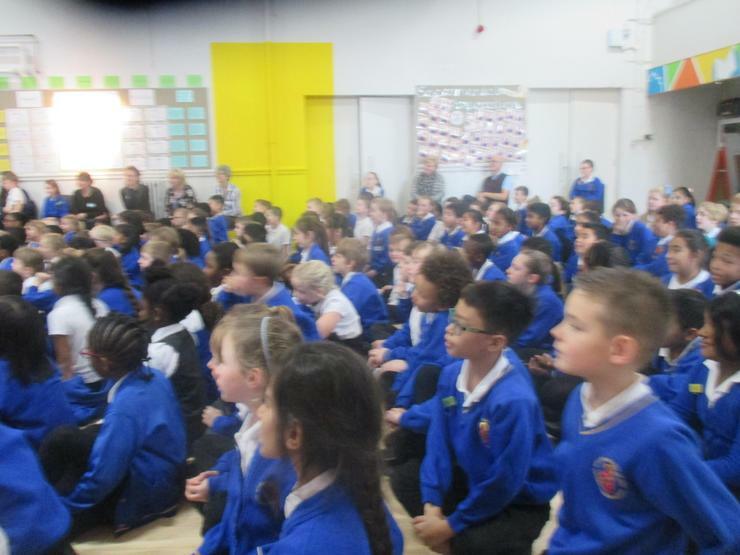 The children did themselves proud and I know everyone who saw enjoyed it! 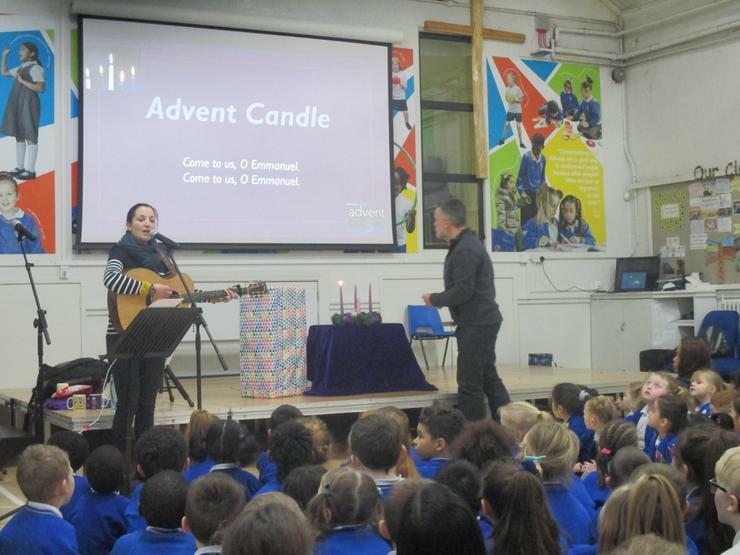 As we prepare for Christmas during Advent, we think about those less fortunate than ourselves. 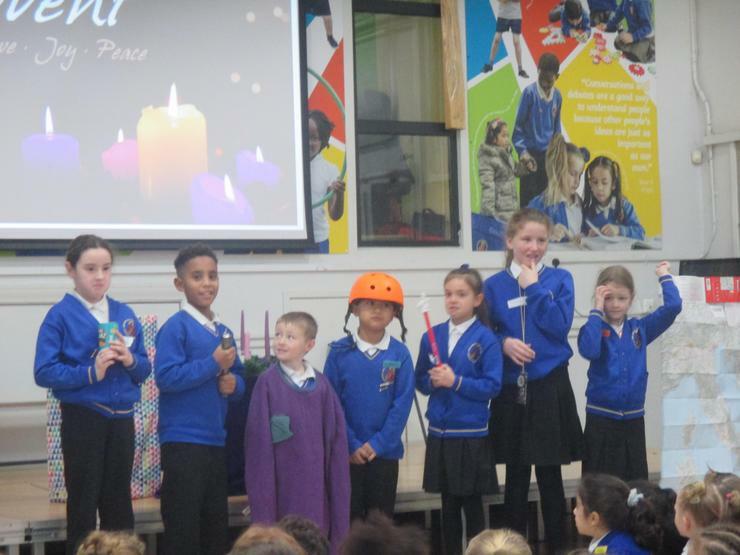 Our Christmas enterprise is all about making something from scratch and selling it within our School community to raise funds - this time it went to the Church and we made extra to gift to our friends at Castle Croft Retirement home. 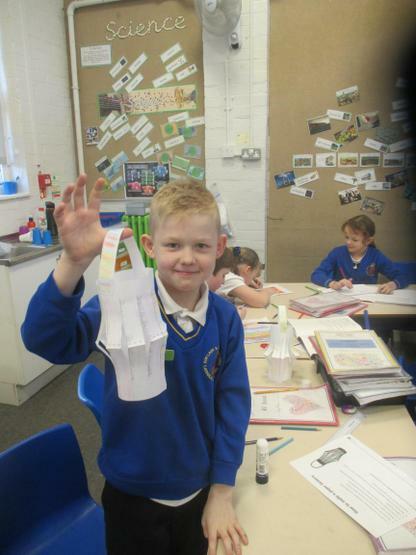 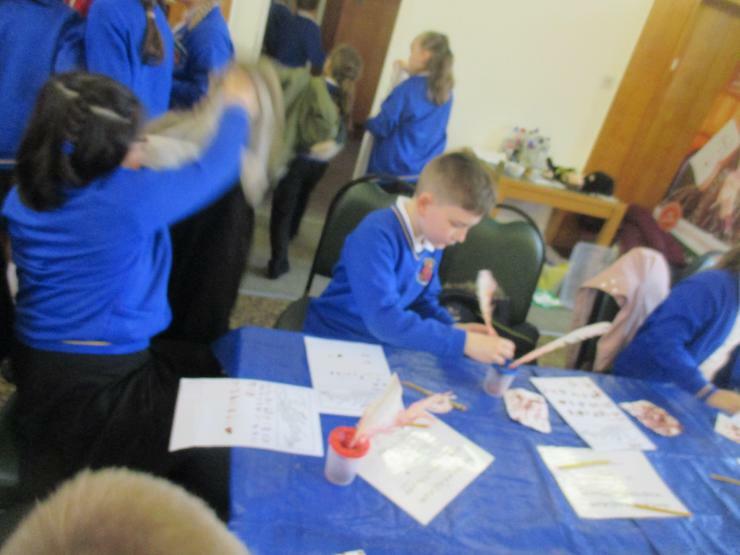 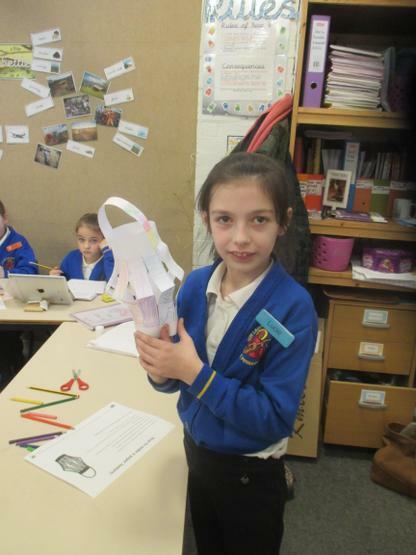 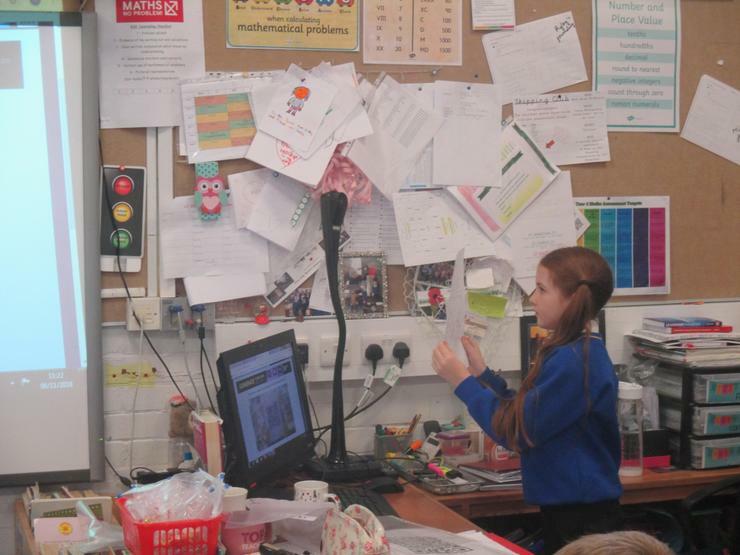 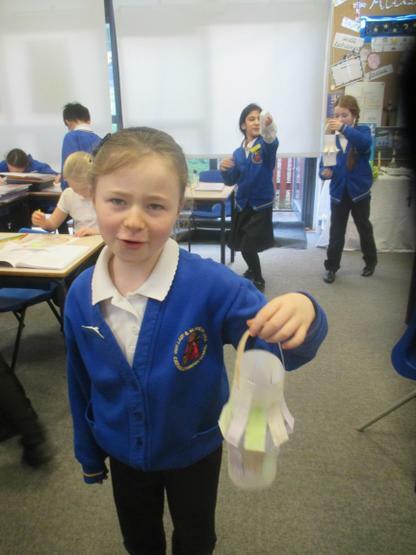 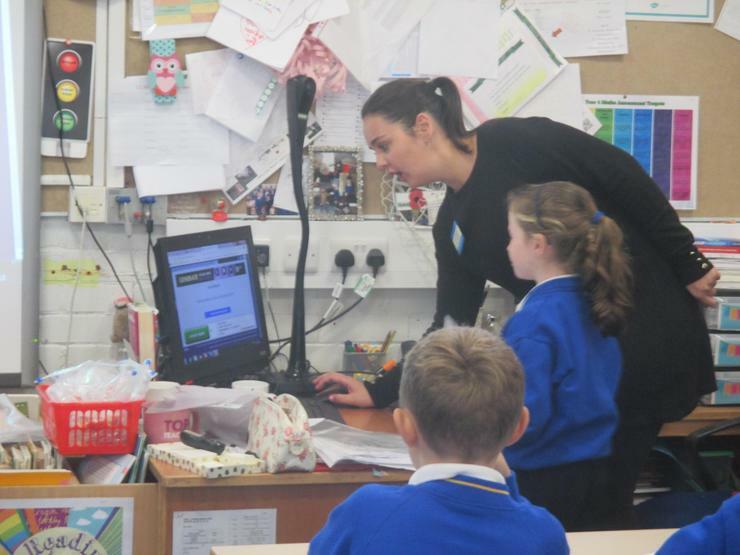 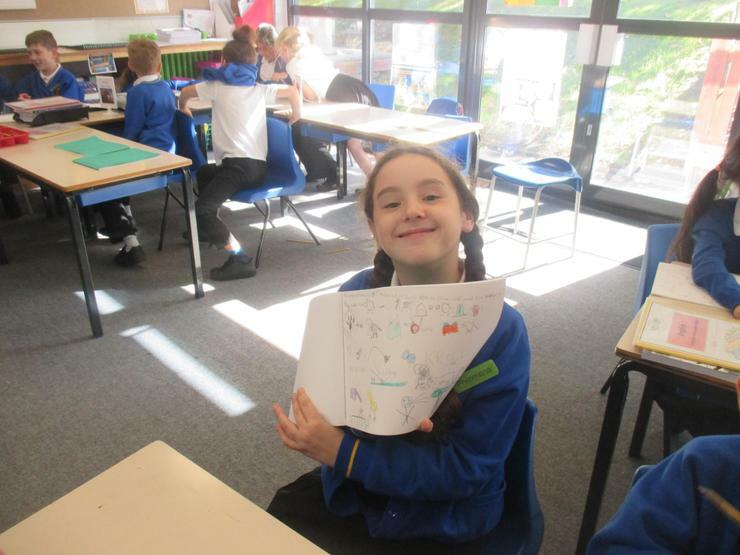 We all enjoyed making, marketing, selling and buying. 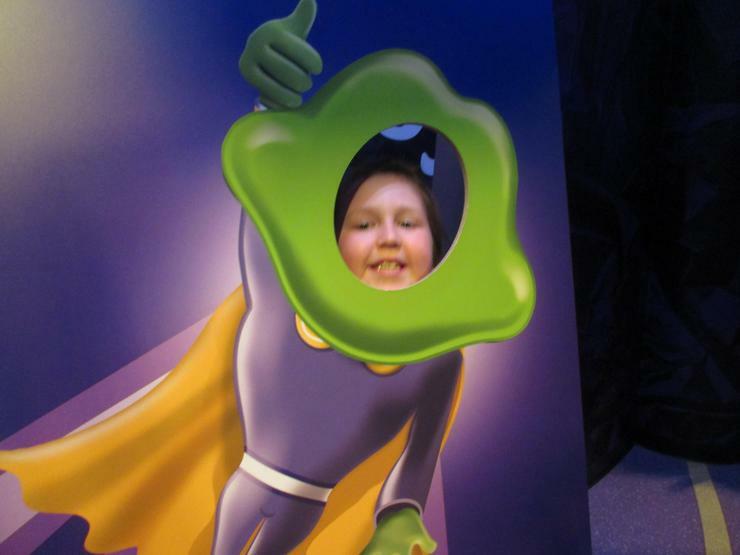 All for an excellent cause, close to our hearts. 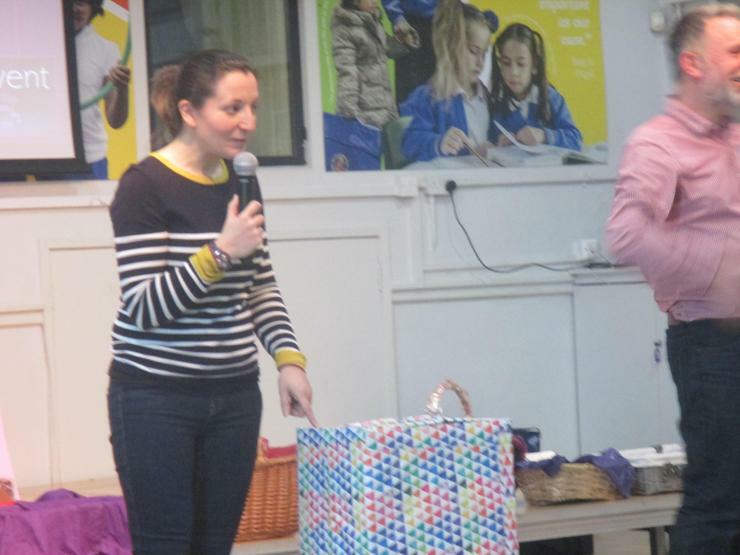 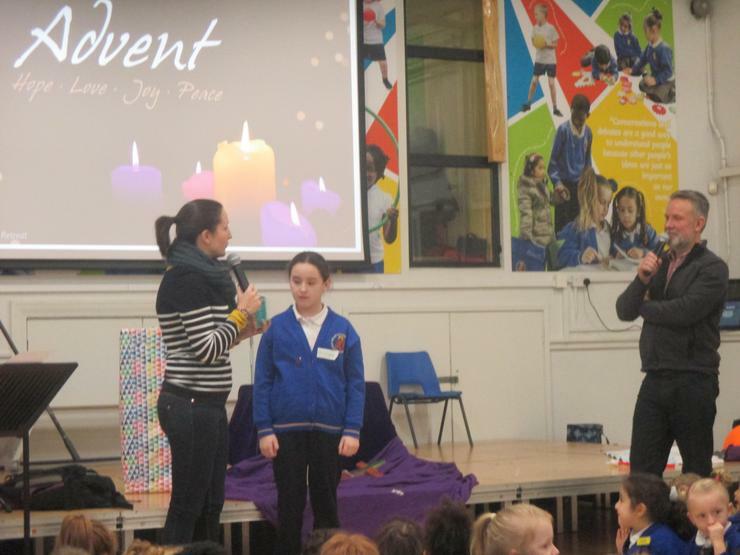 We welcomed Dan and Emily back into our school for a special Advent retreat day. 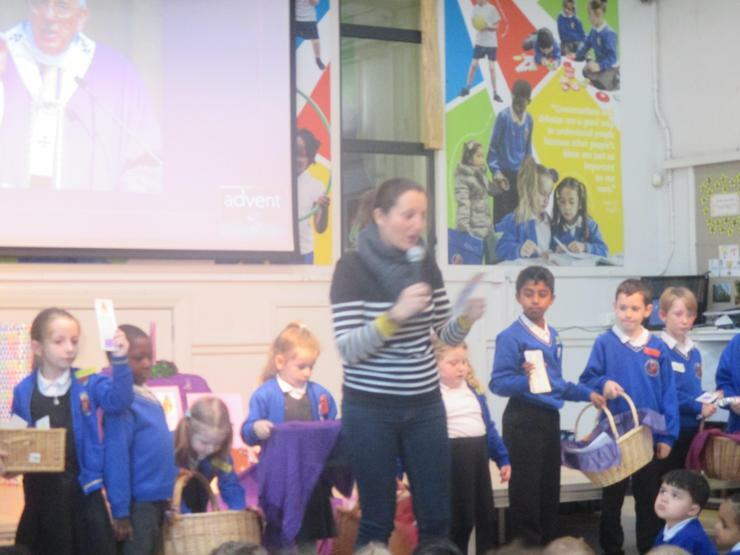 It was so wonderful to help us prepare our hearts for Advent and understand the meaning for this season in the Churches Liturgical Calendar. 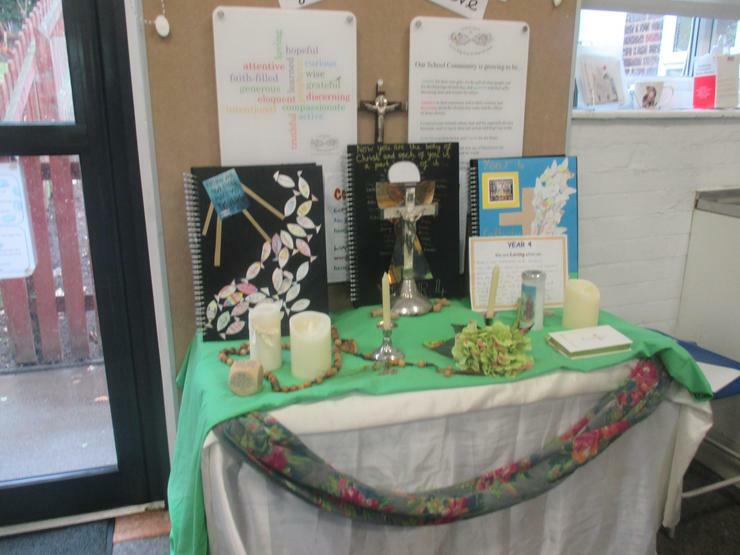 We learned through prayer, hymns, discussions, reflection and a liturgical service to end. 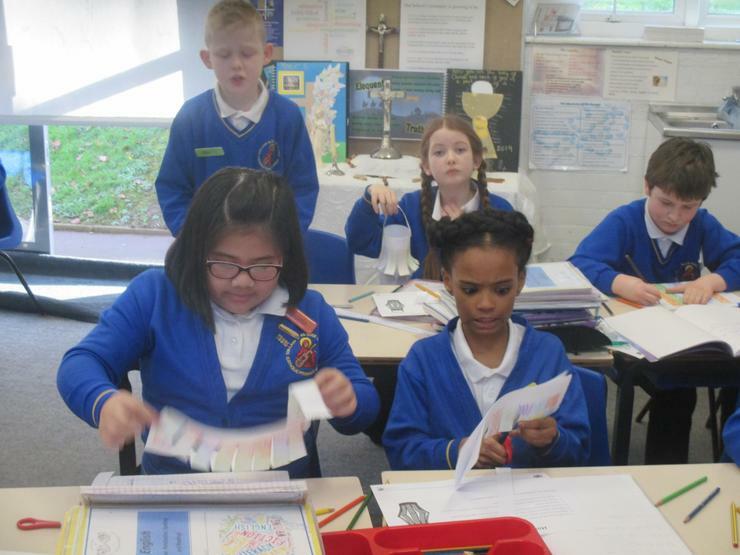 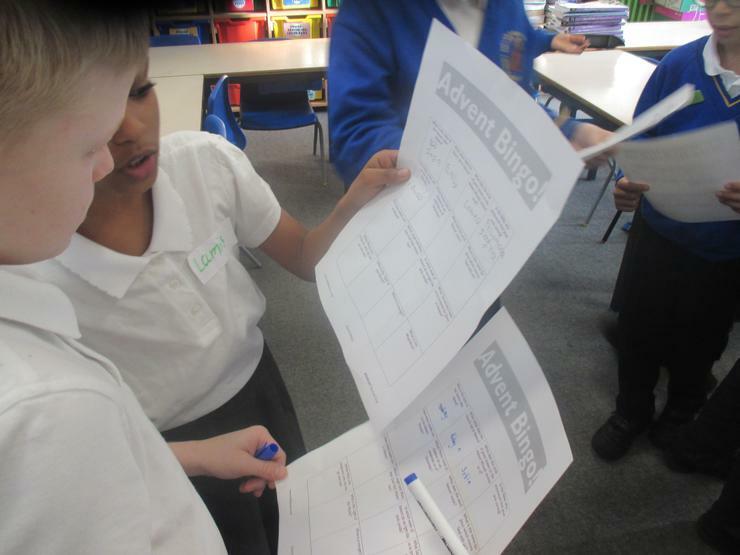 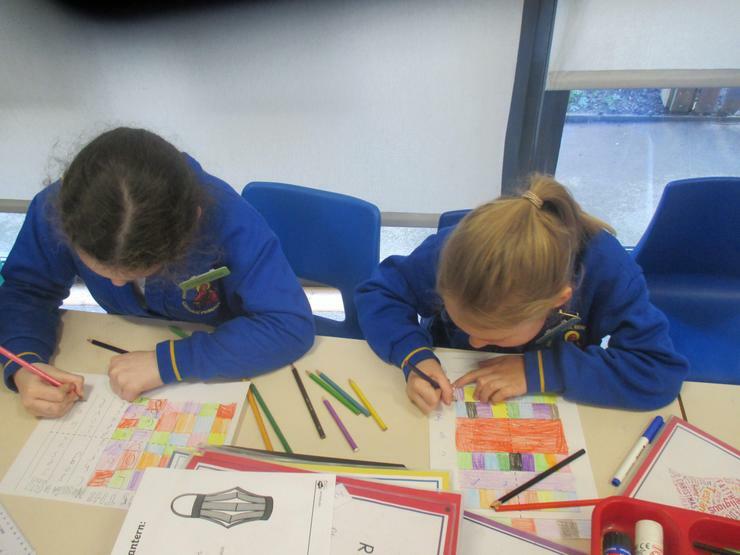 Year 4 are busy practising their advent reflection for the whole school on Monday 10th December. 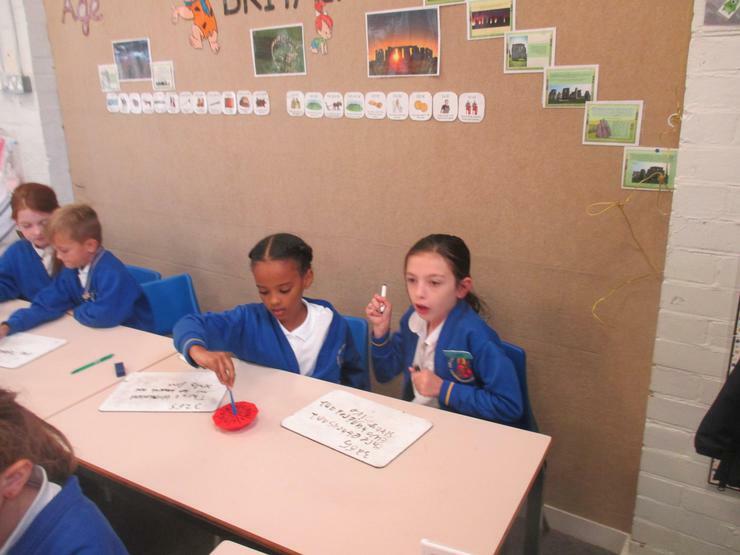 Your child will be sent home with some lines to practise - please ensure they are confident saying this aloud. 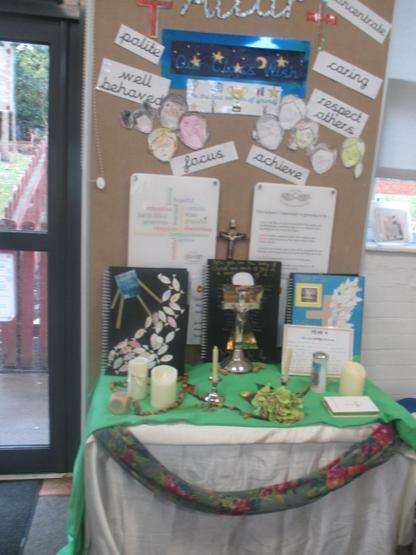 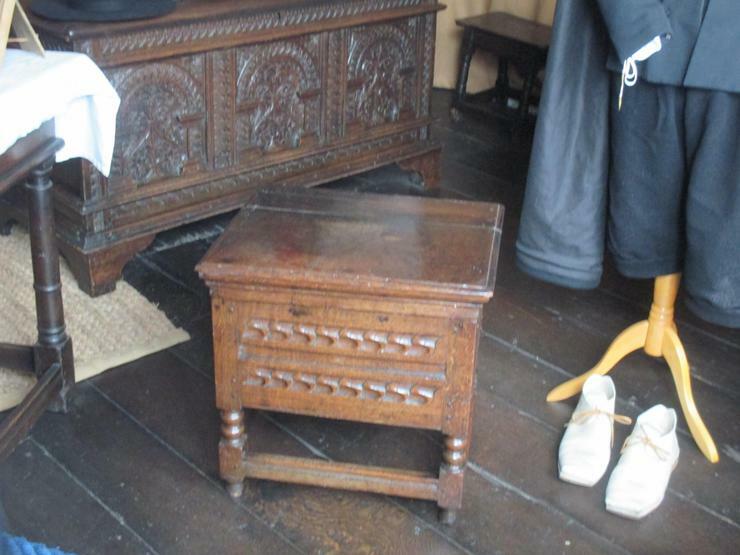 You are most welcome to join us in the hall at 9am to share in this special reflection with us. 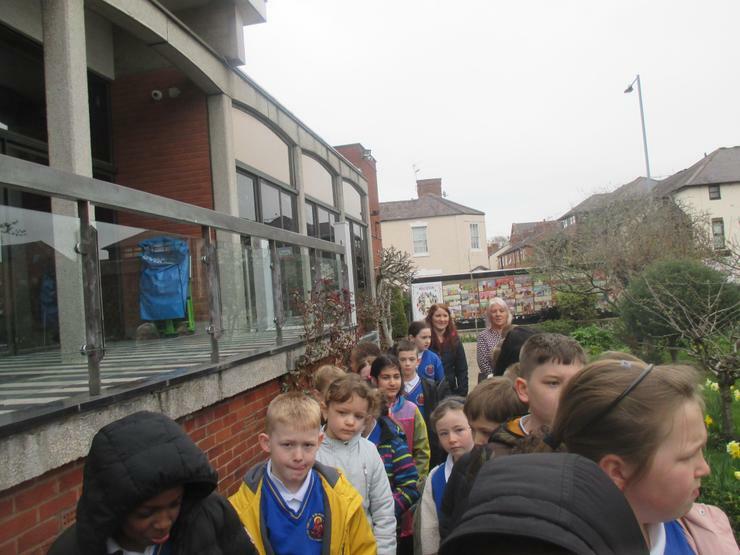 Year 4 have been having lessons at Linden road Baths every day for the past two weeks. 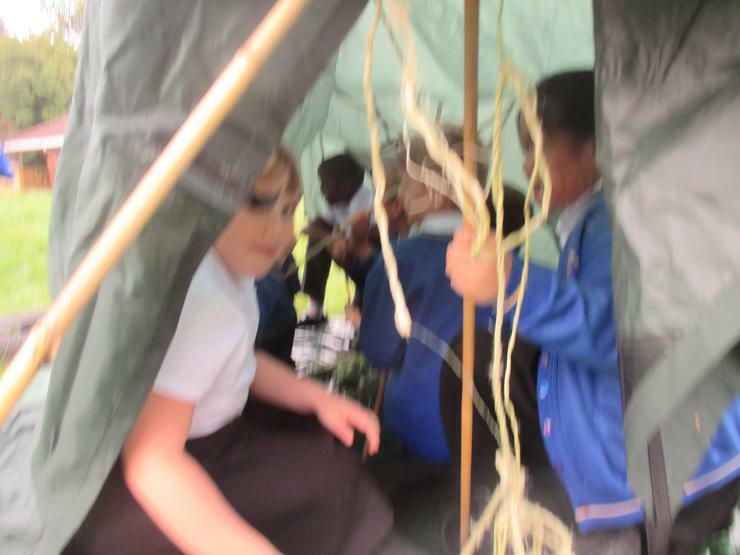 They have been learning key stokes and survival skills. 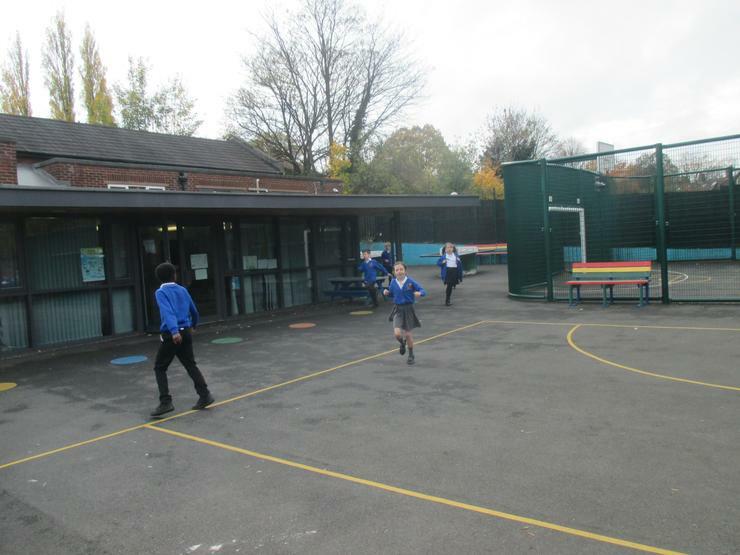 They have improved beyond all recognition and are much more confident swimmers. 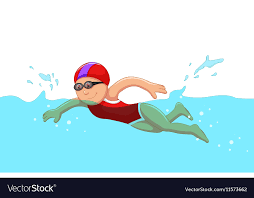 They were able to demonstrate their skills and swim for badges with Many children receiving 25m, 10m and 5m badges including some children who began the block with armbands. 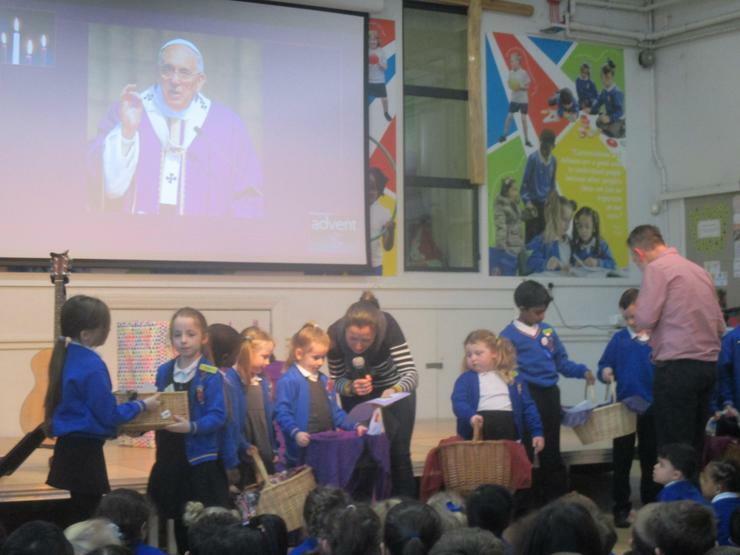 They will be celebrated in celebration assembly this friday and be able to bring their certificate home. 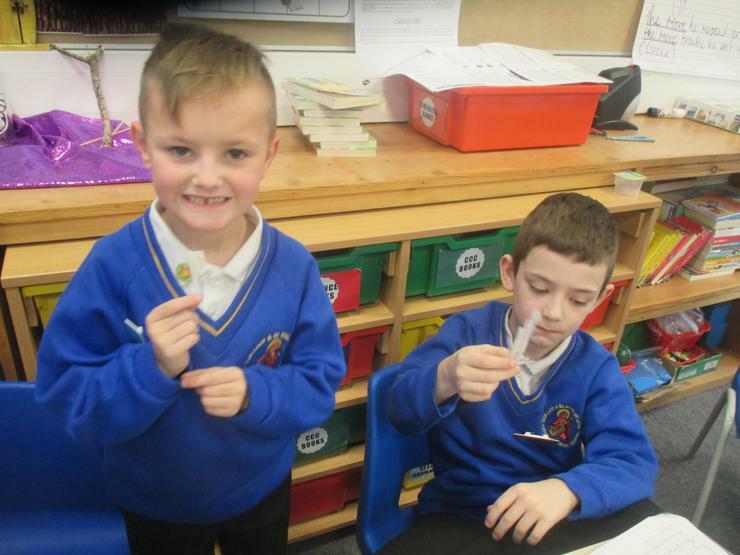 Should you wish to have the badge that they are able to sew onto their swimming costumes, they will need to be purchased directly from Linden Road. 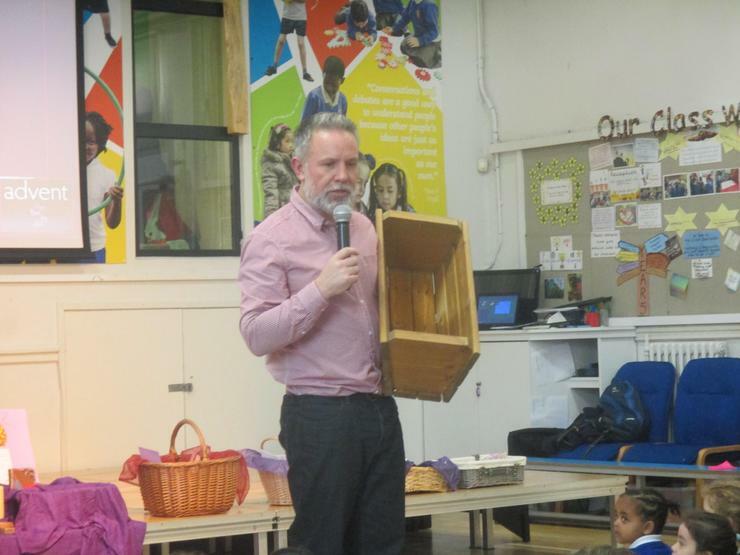 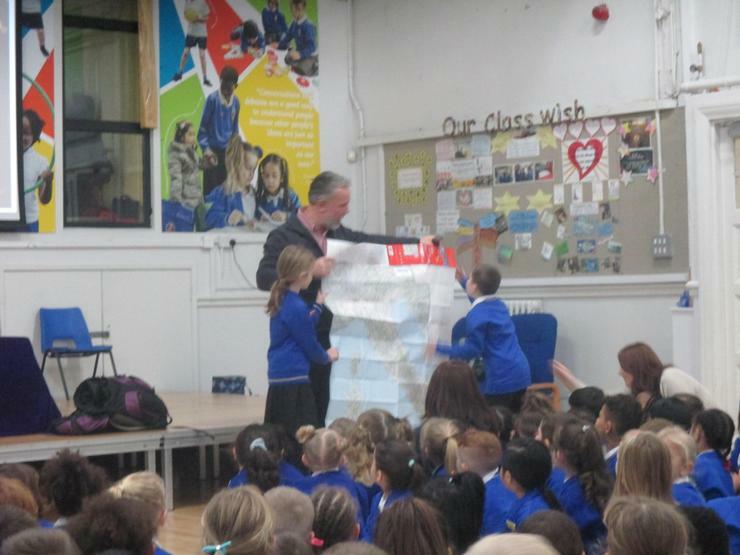 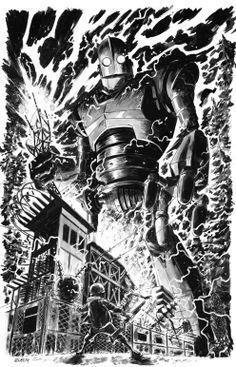 We were off to a very exciting start this half term with an introduction to our new Novel - The Iron Man. 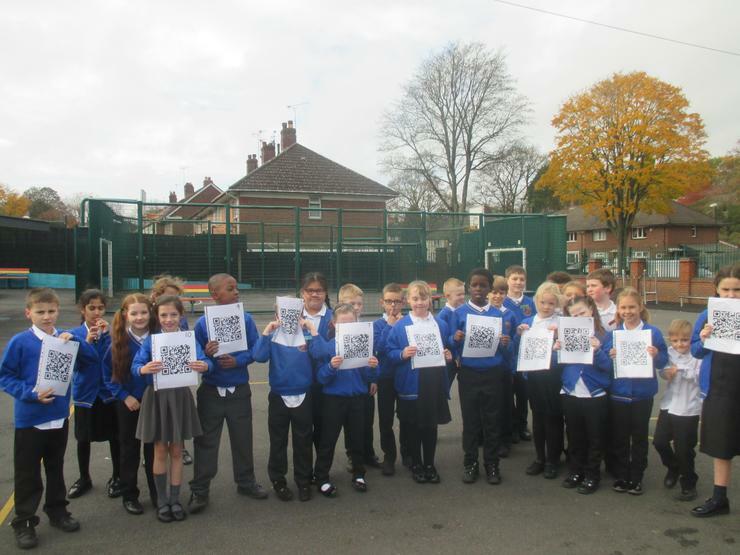 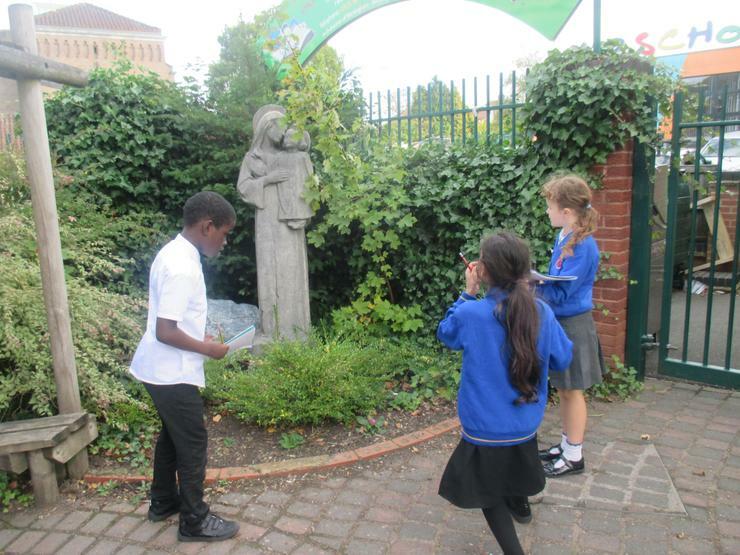 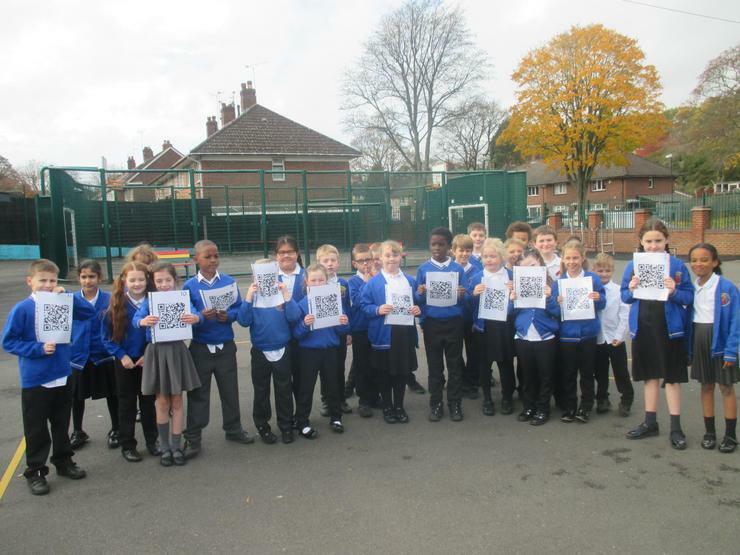 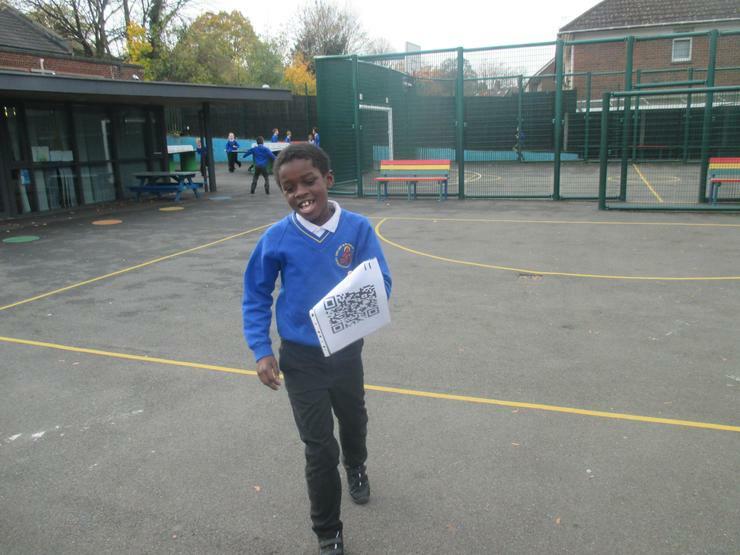 The children were set a QR code hunt around the playground. 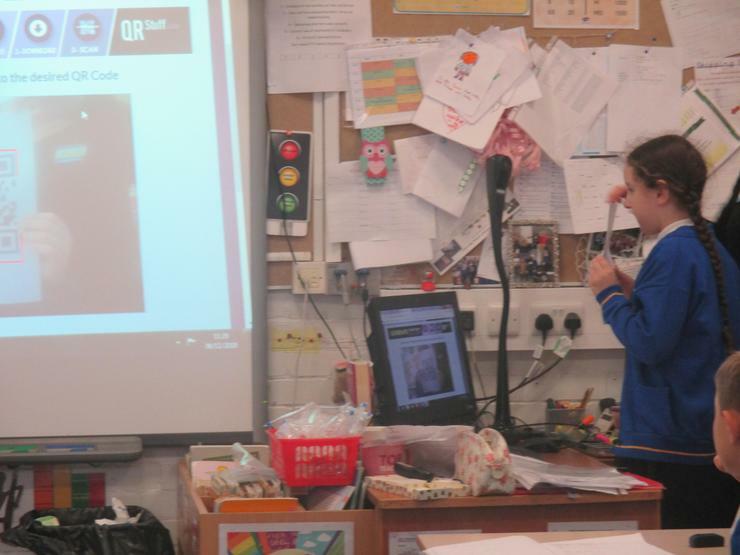 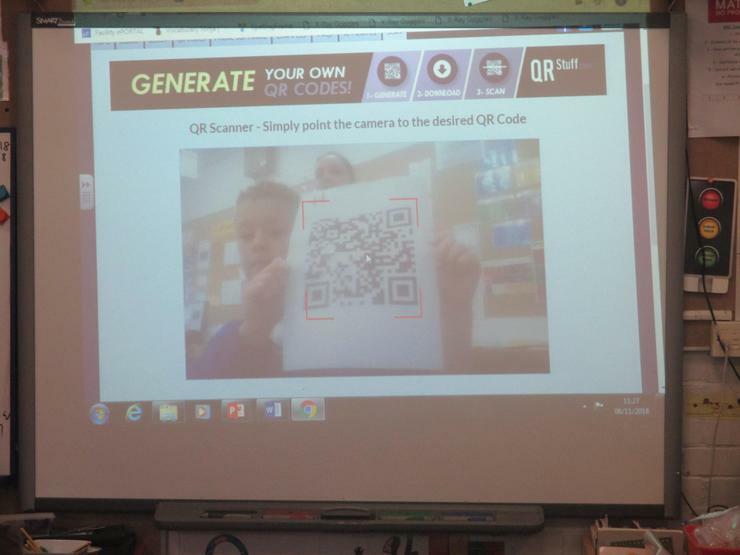 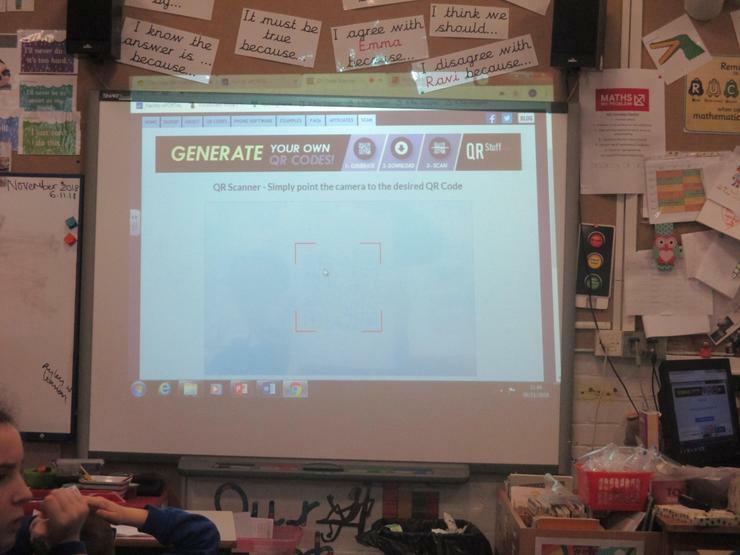 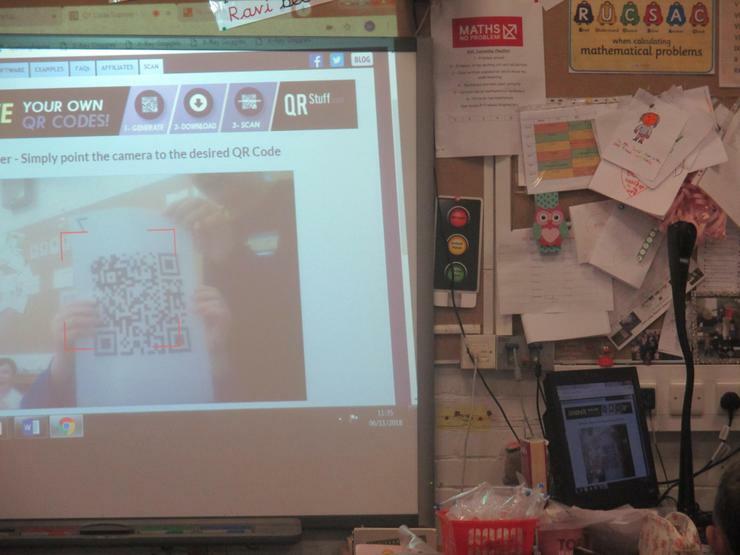 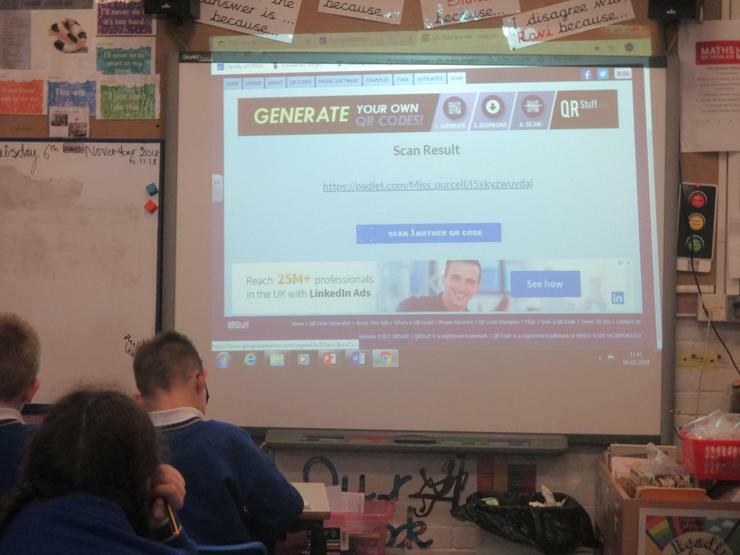 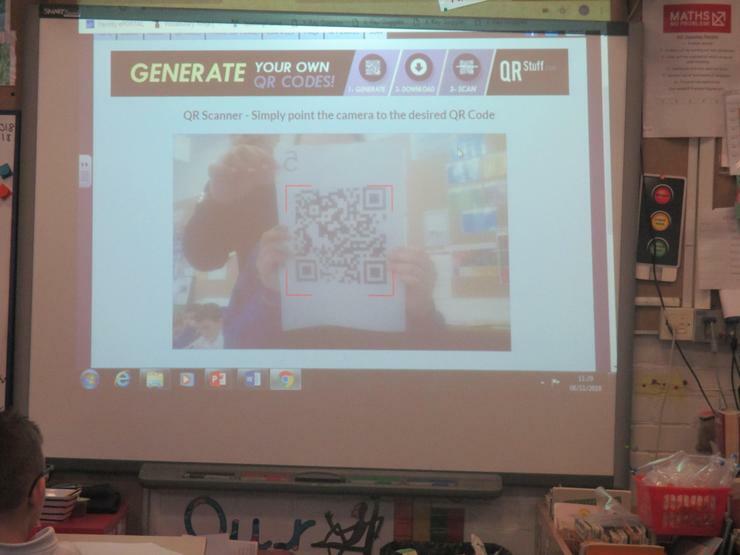 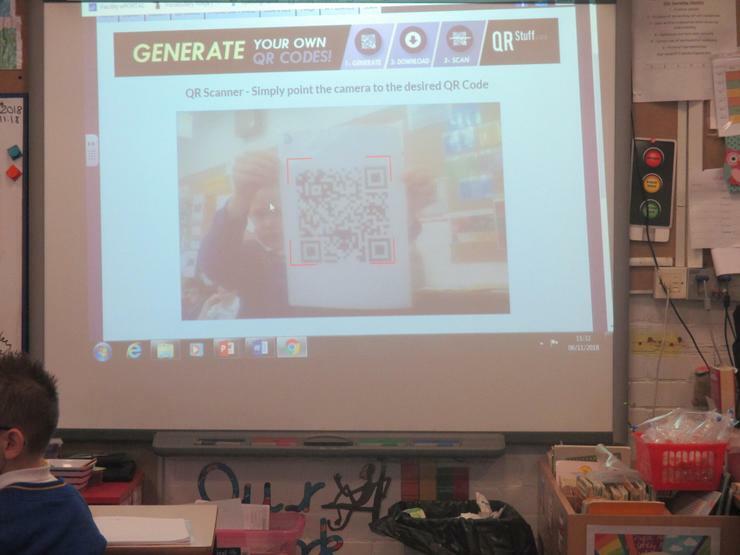 They found them all extremely quickly and then came back to class and scanned them into a QR code reader. 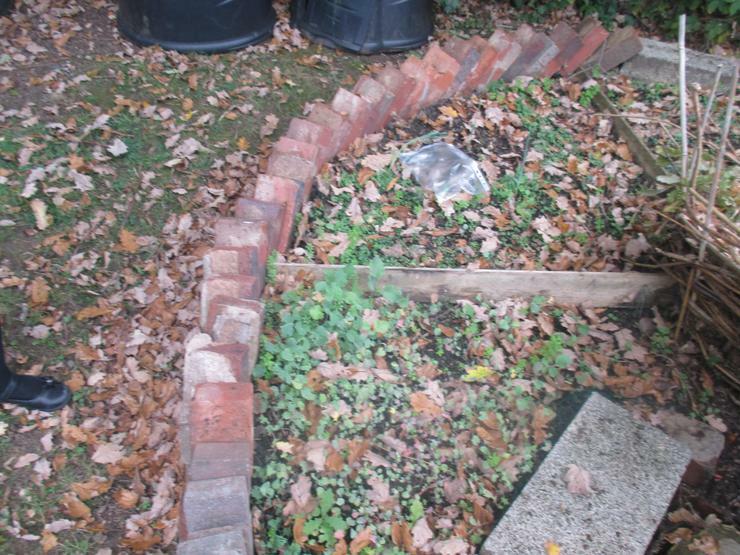 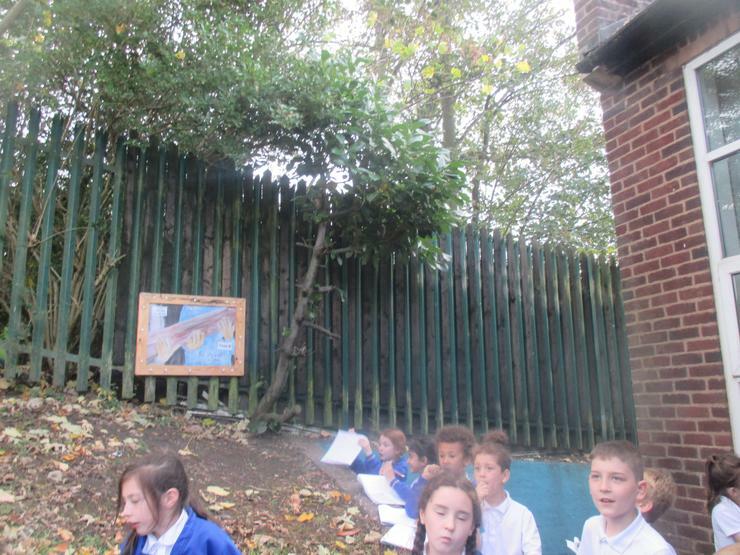 Each one revealed a photo which was a clue. 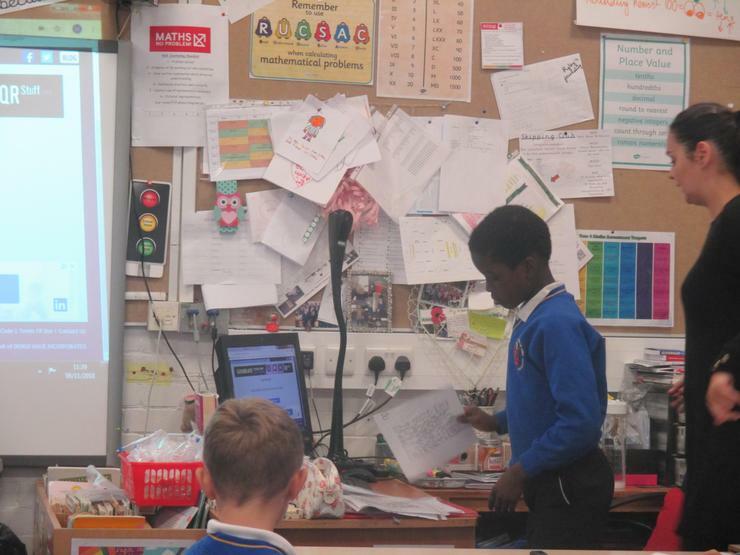 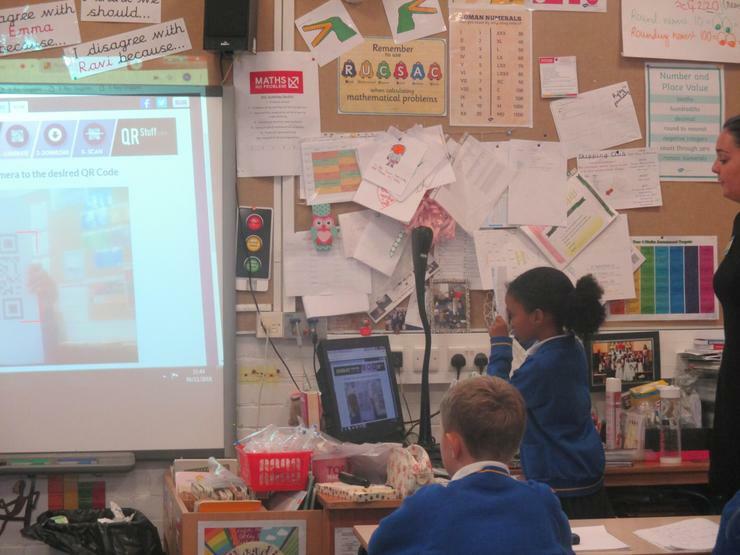 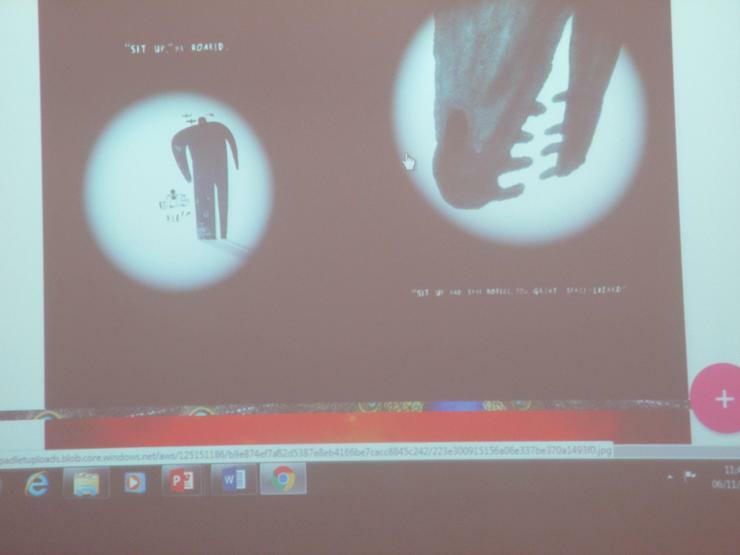 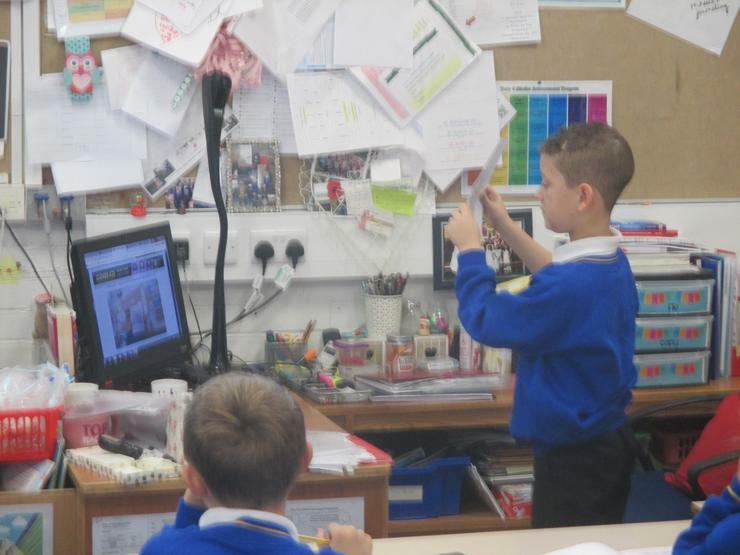 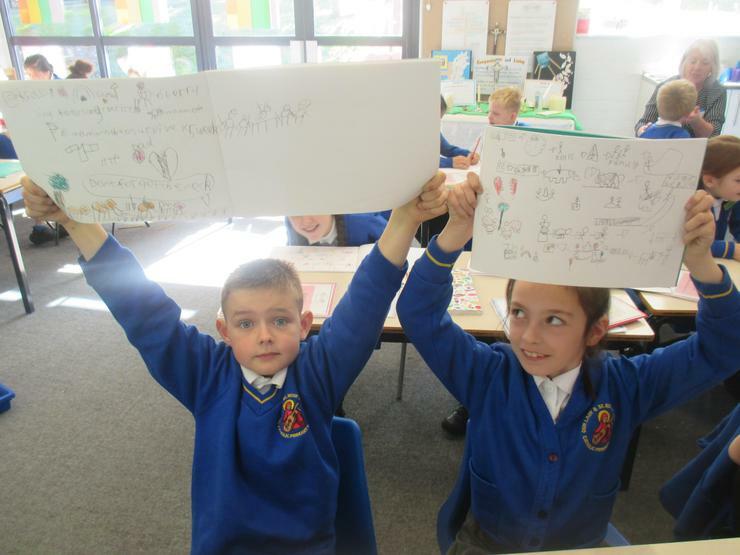 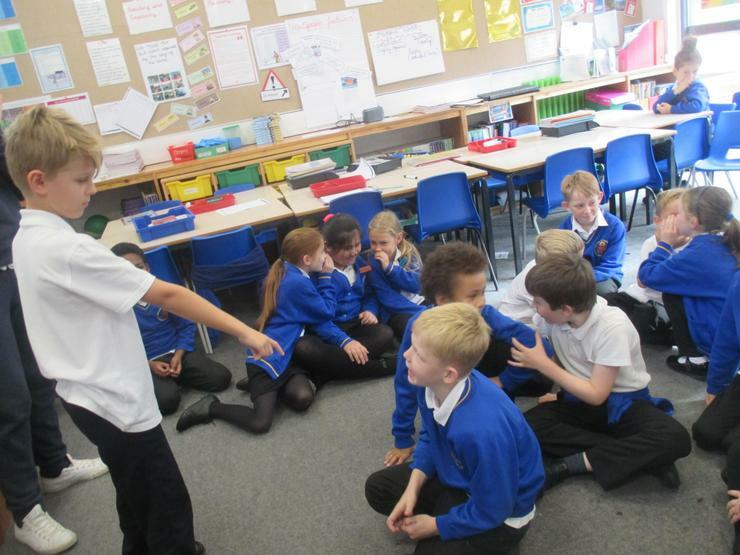 The children offered their own inference and prediction until number 11 revealed a video re-telling of chapter 1. 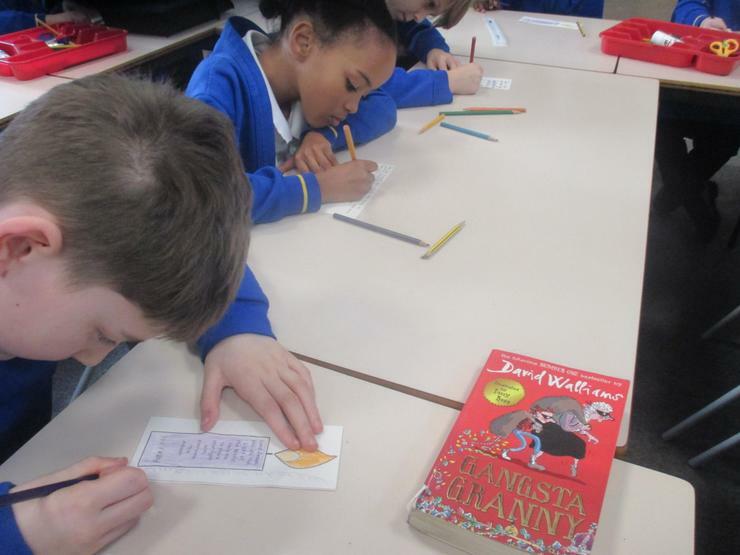 The children are all really curious already to read this book and discover the plot! 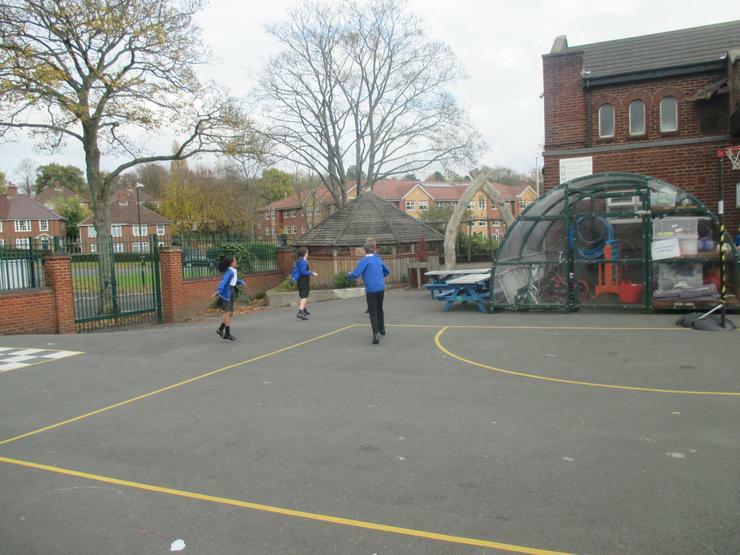 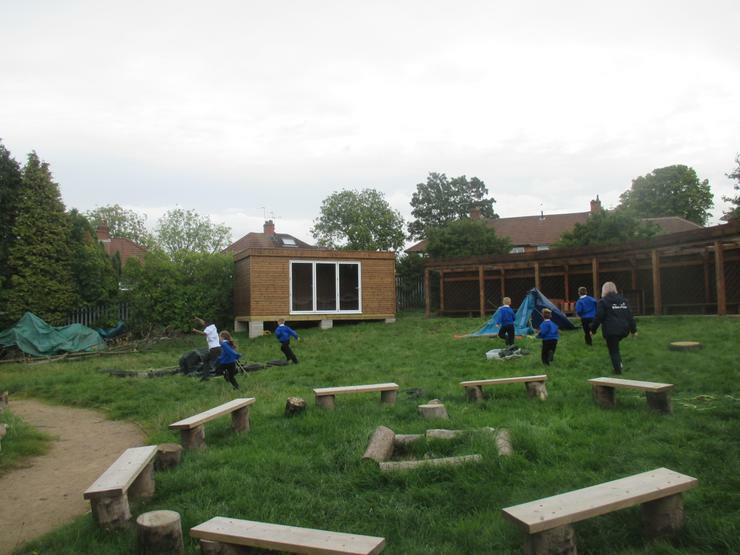 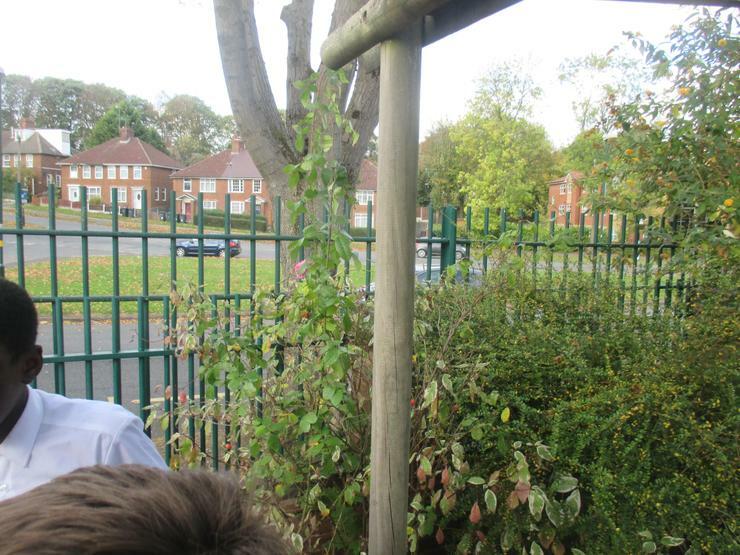 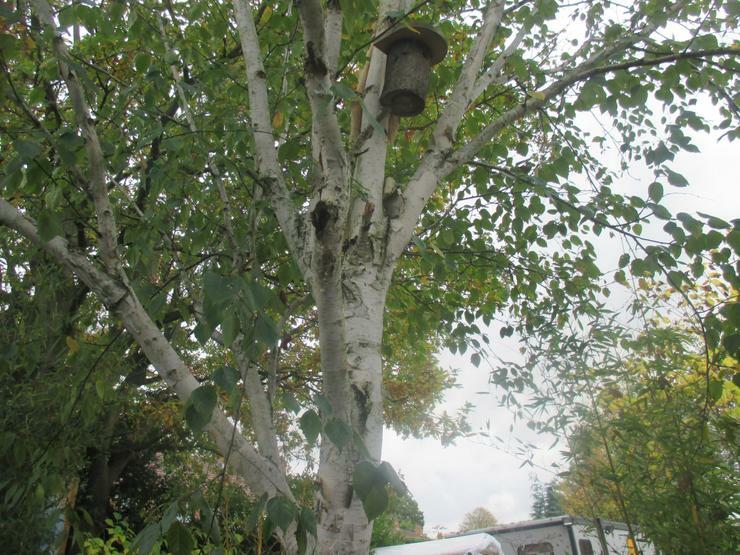 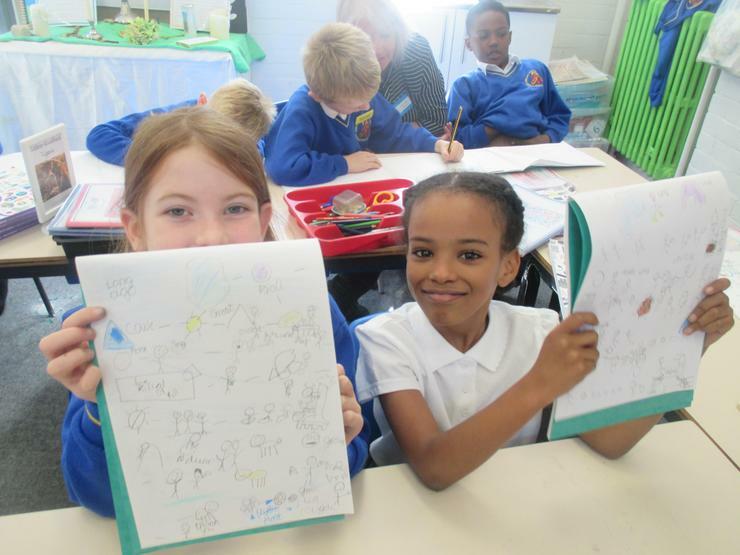 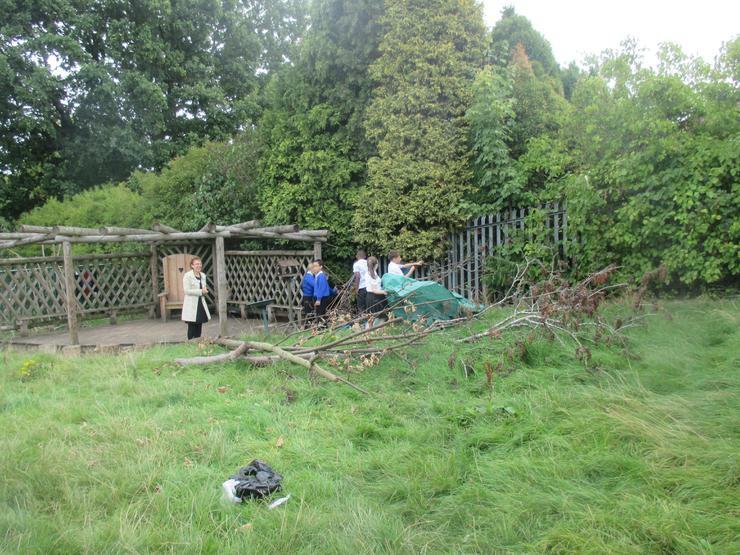 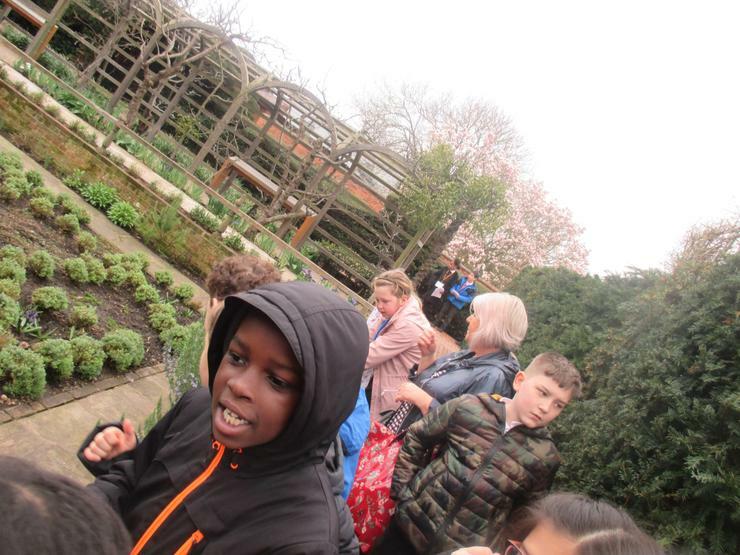 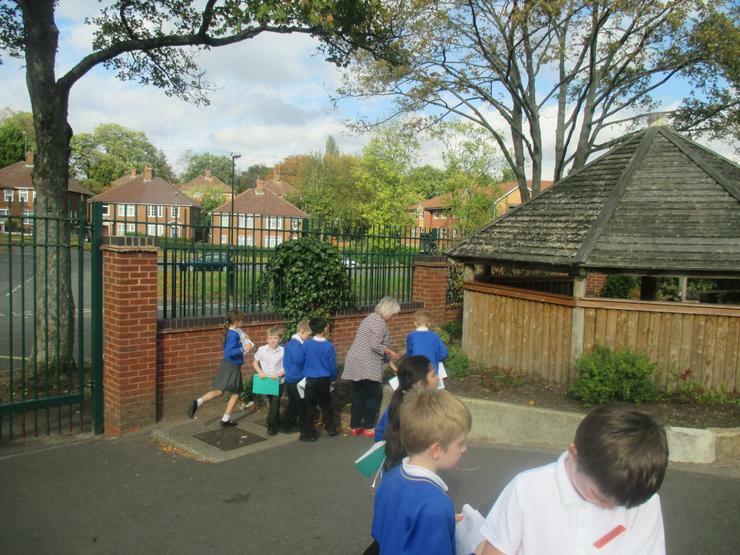 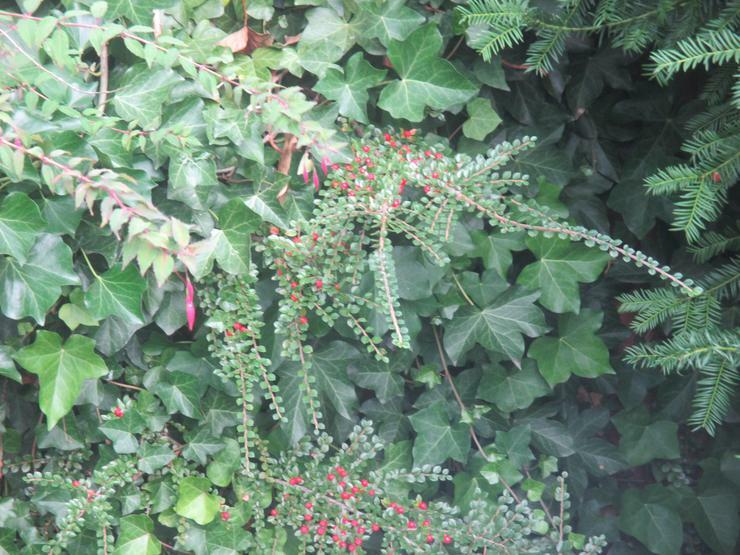 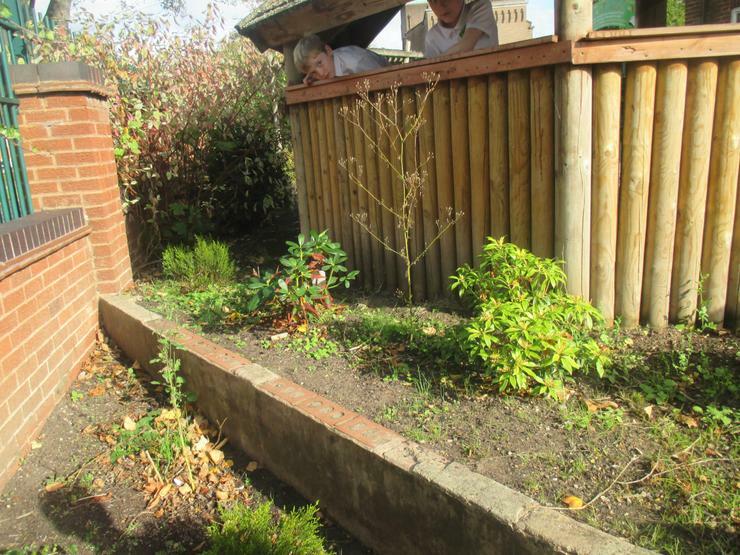 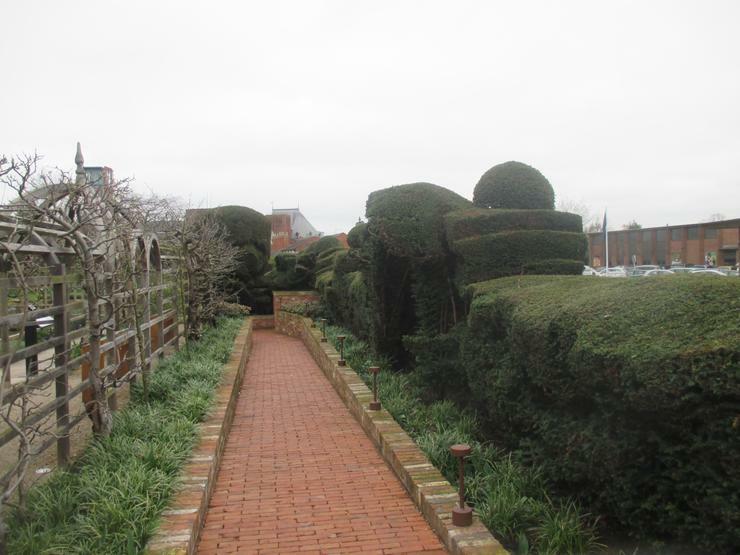 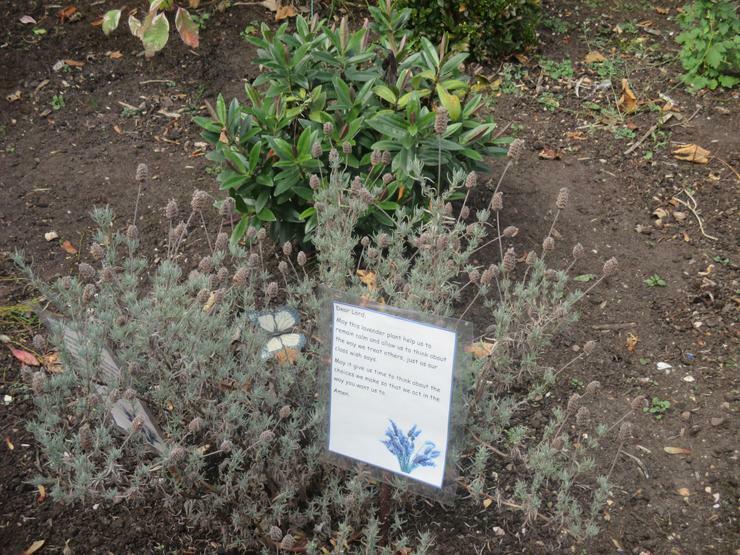 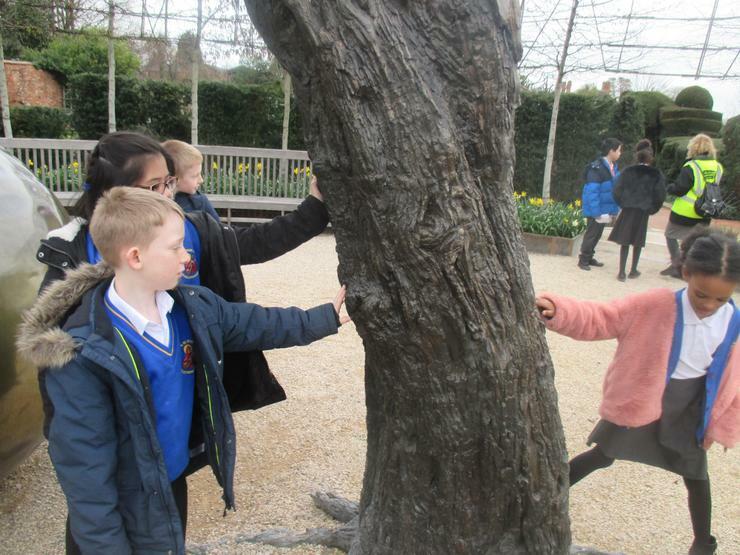 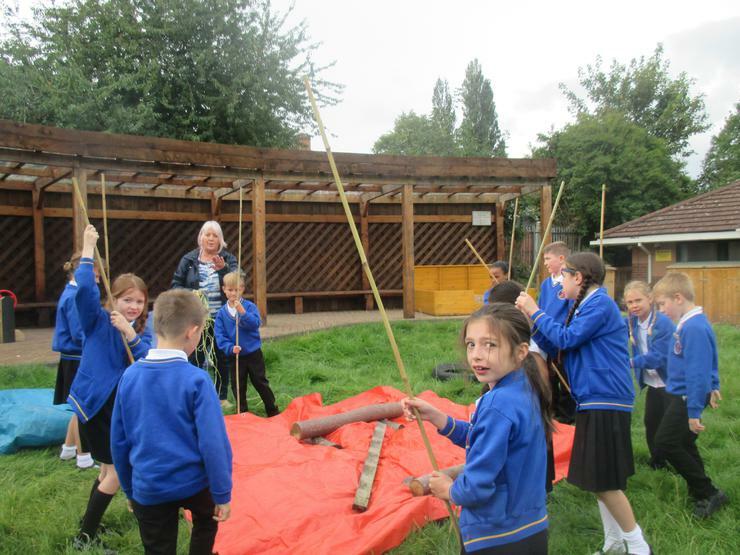 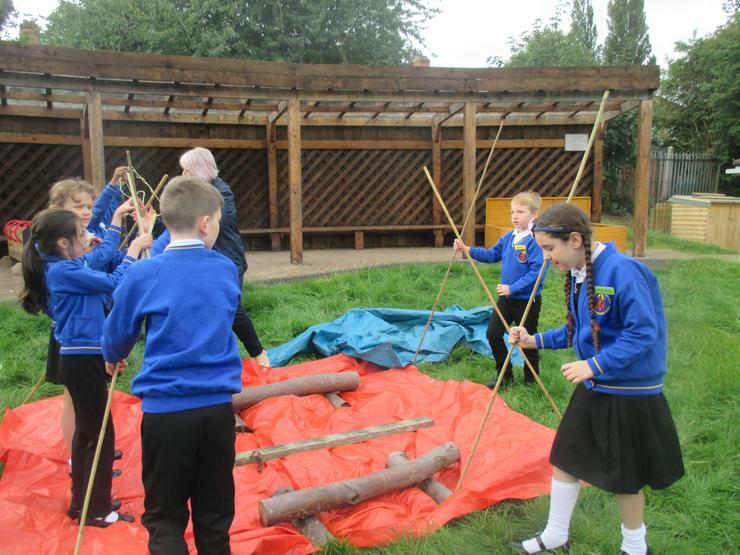 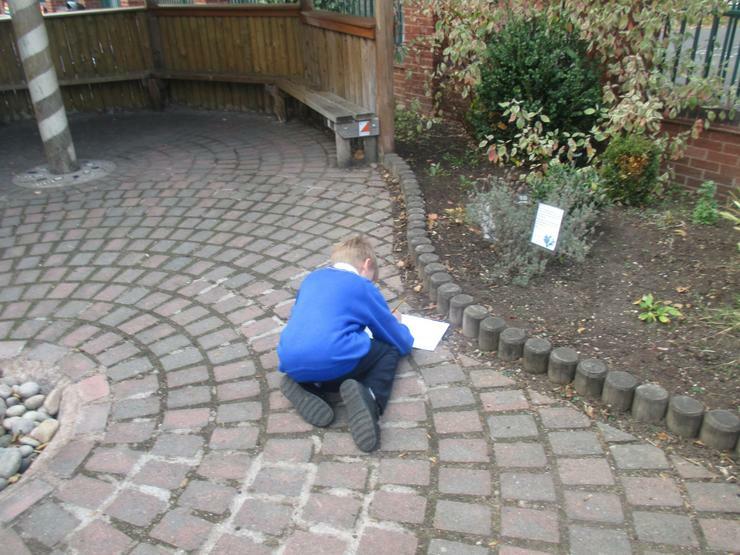 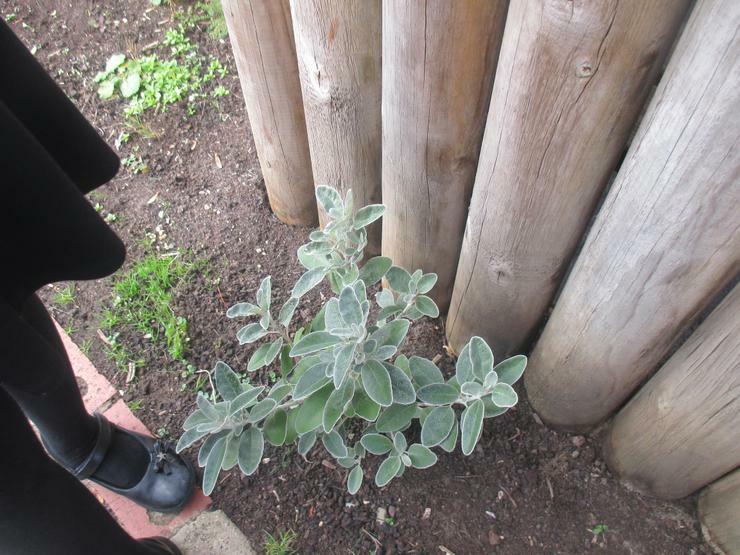 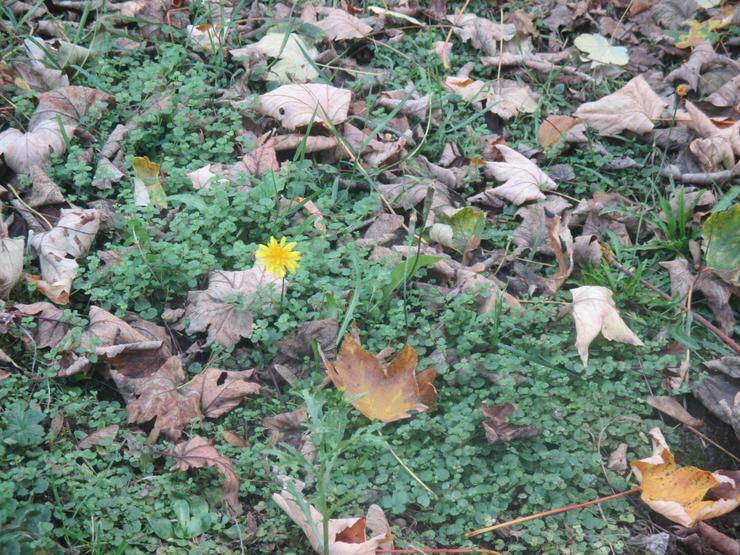 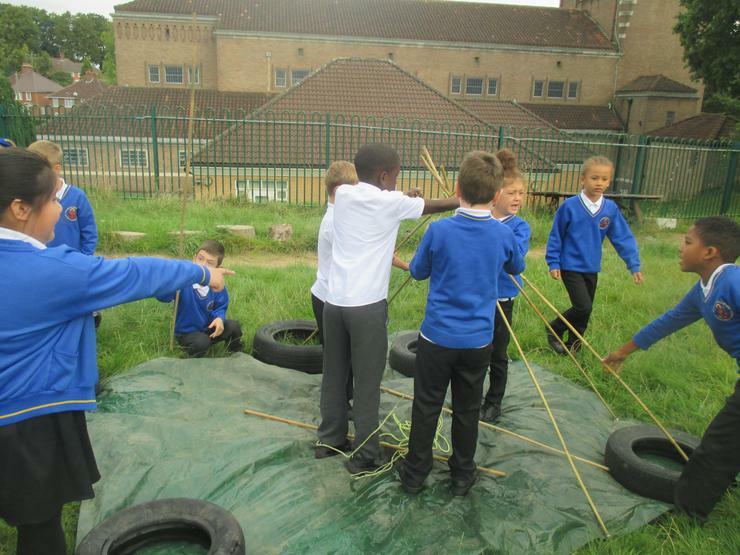 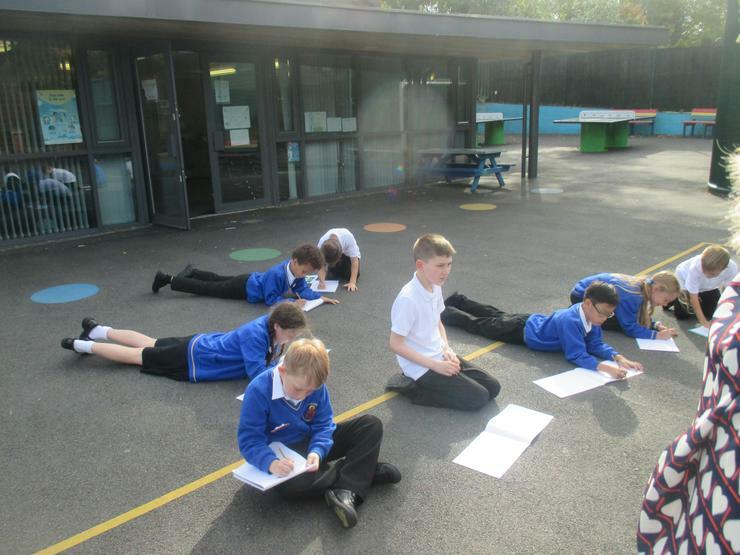 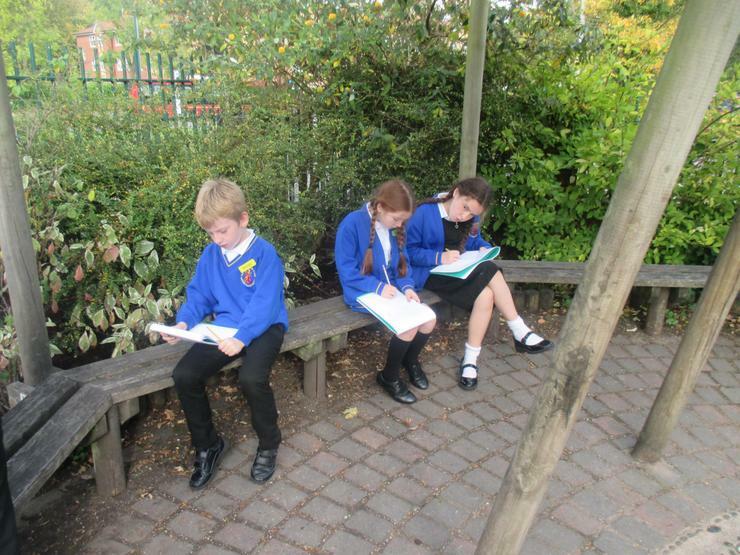 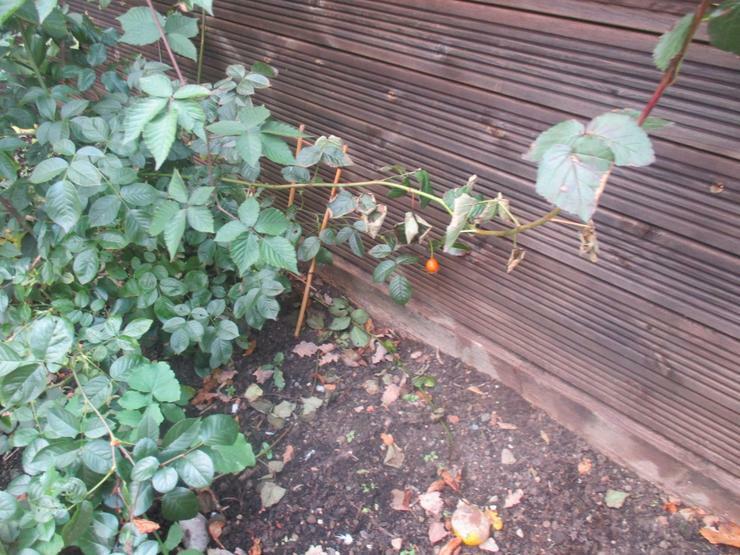 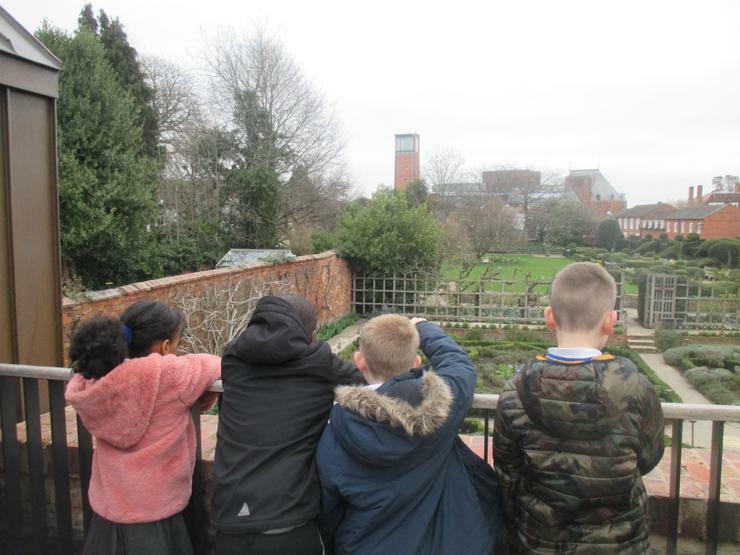 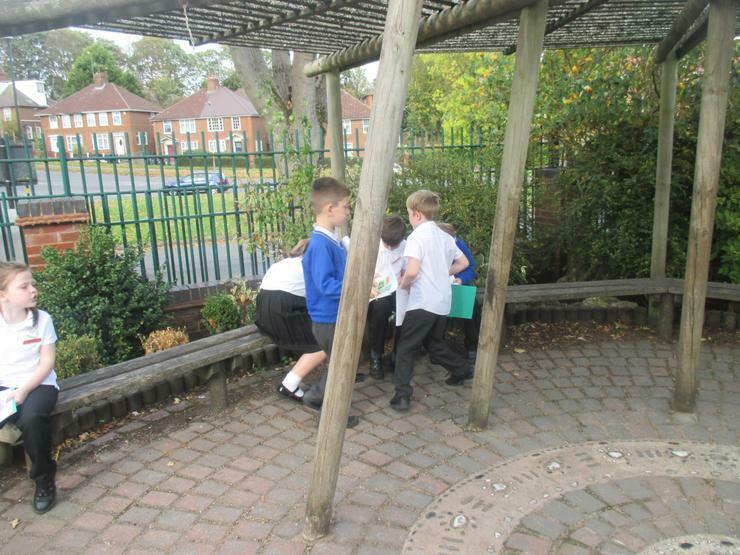 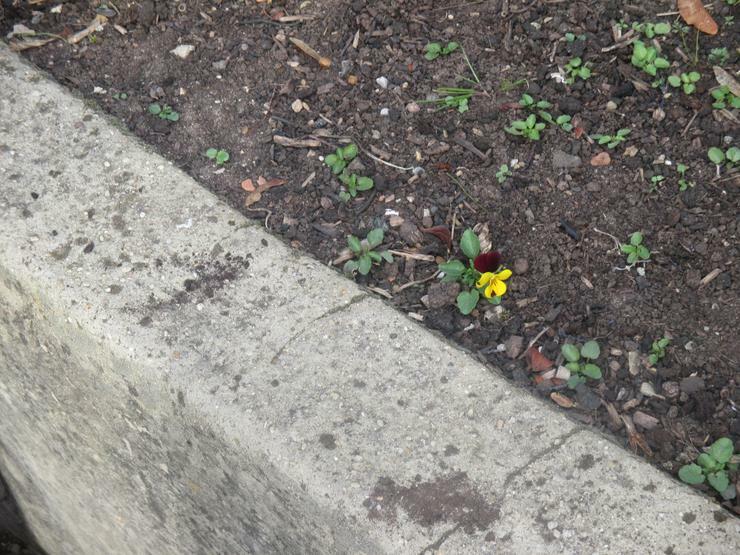 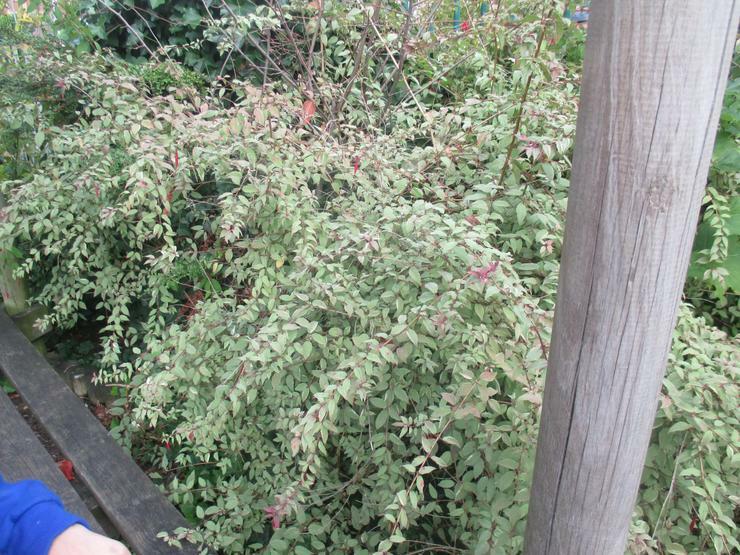 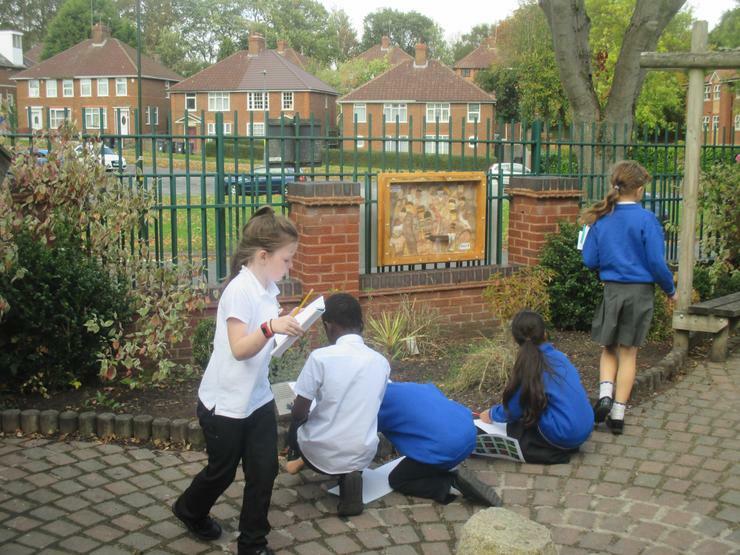 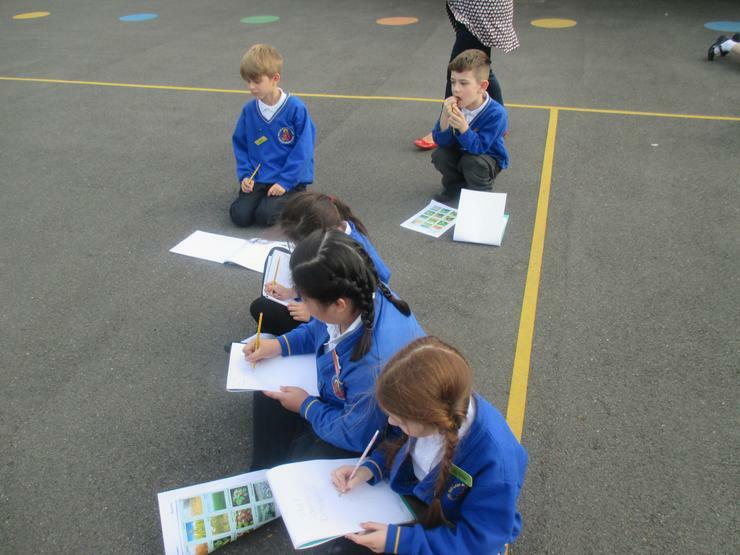 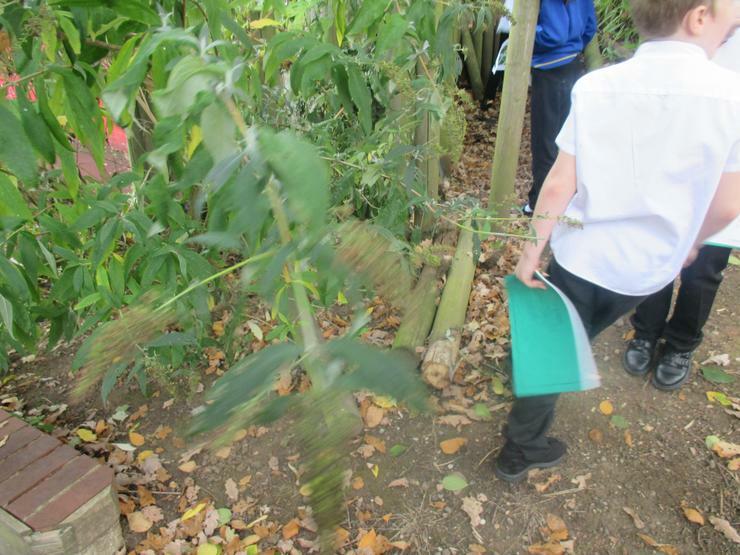 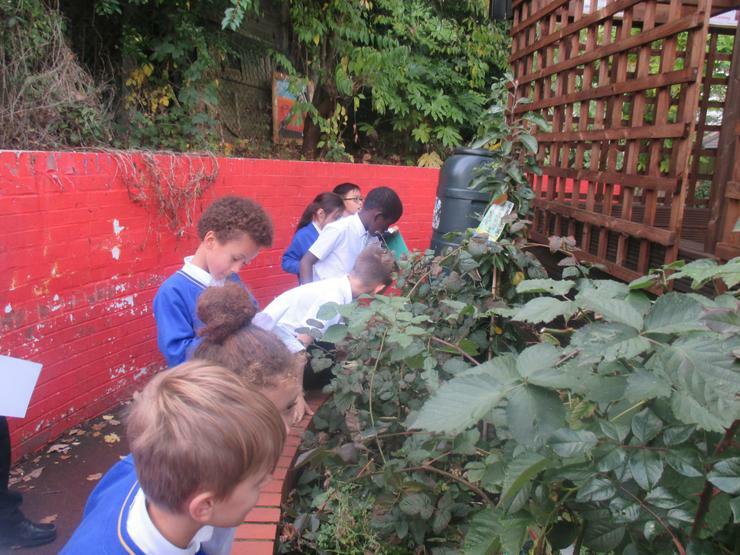 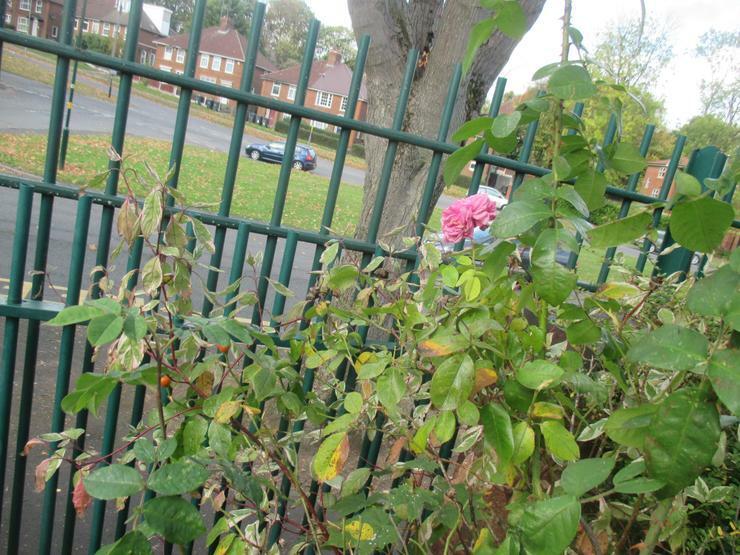 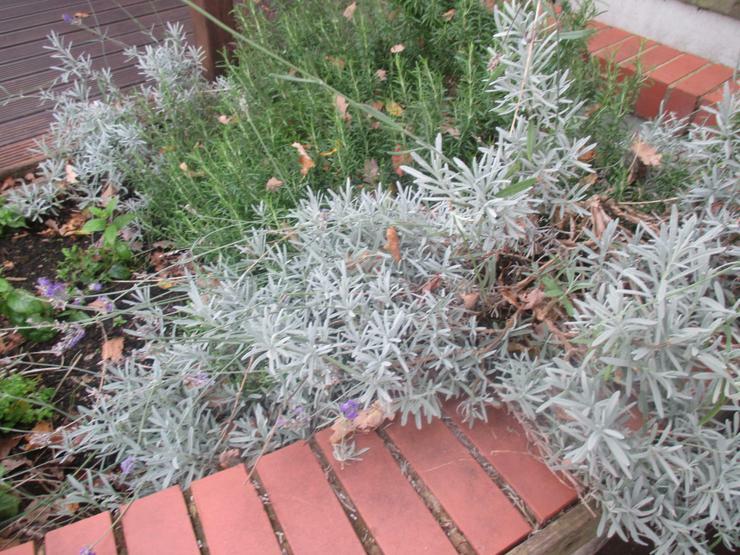 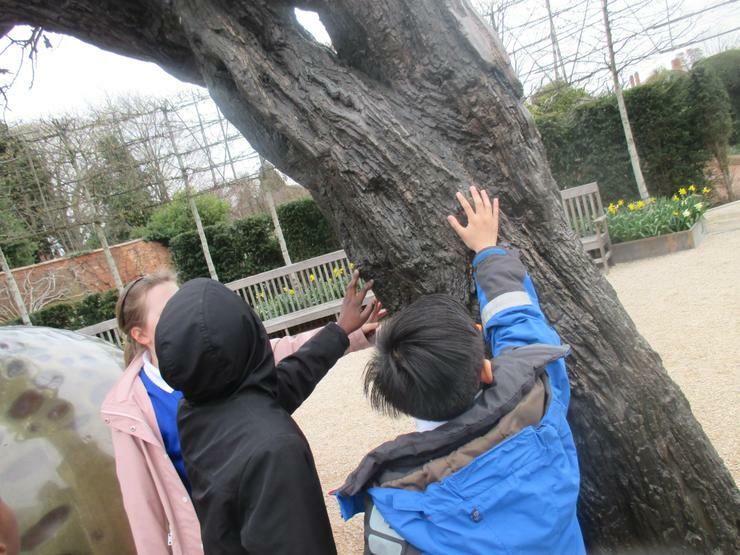 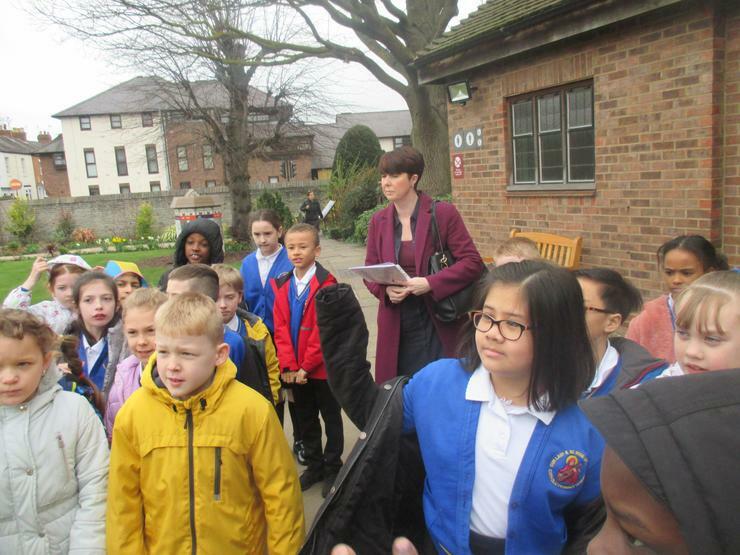 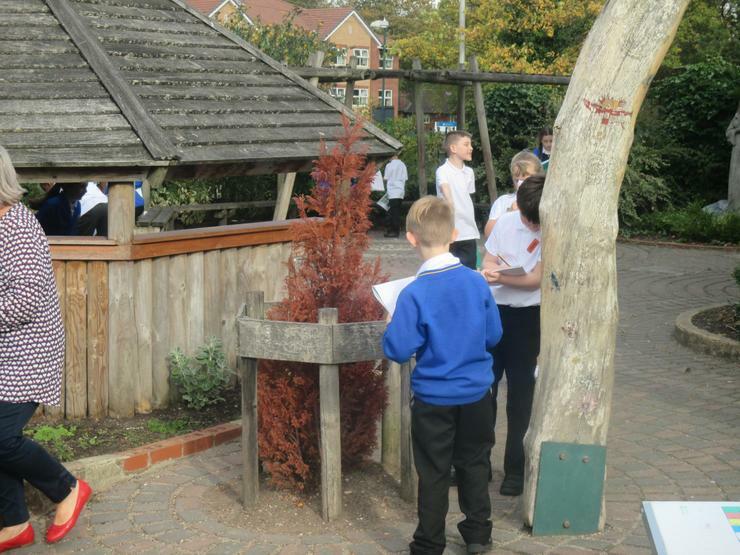 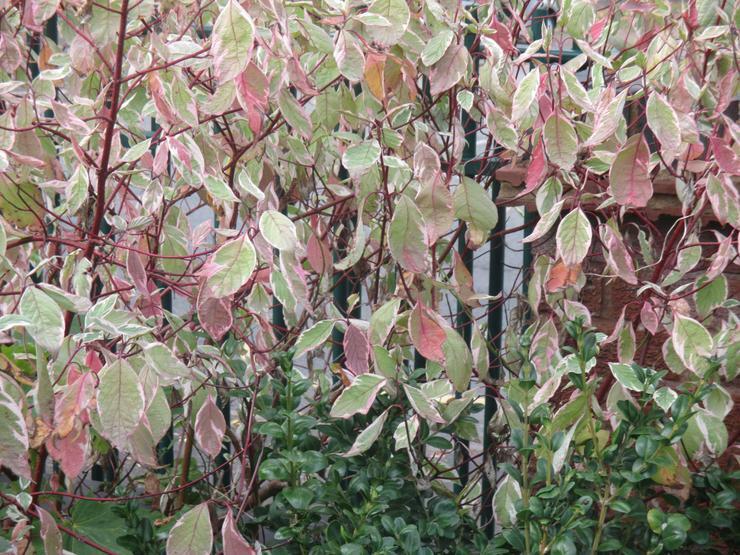 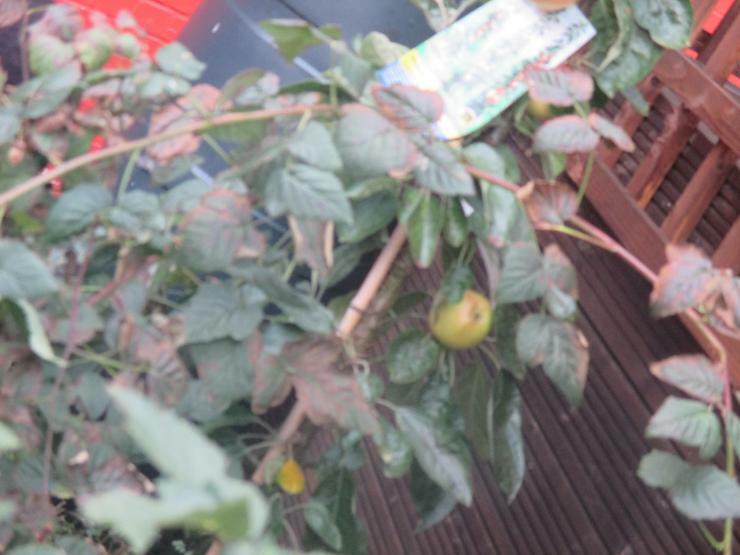 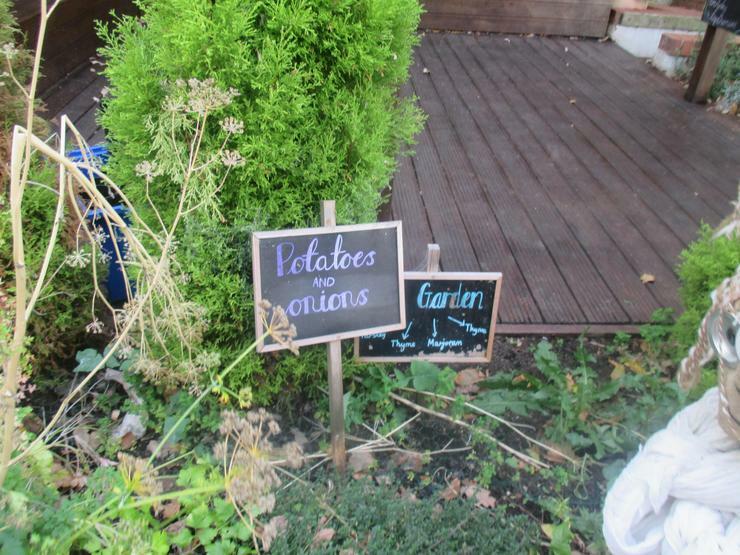 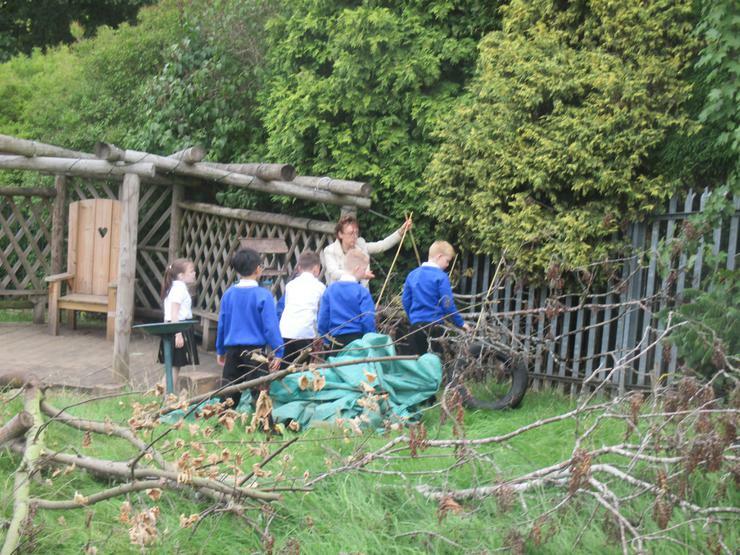 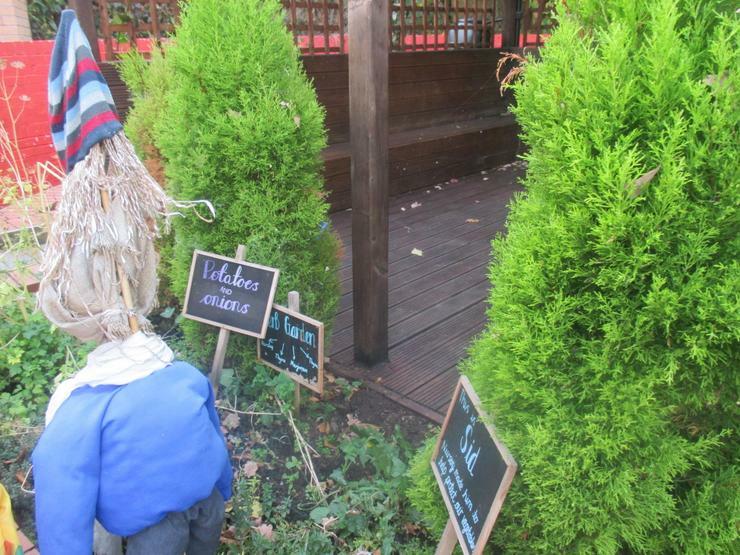 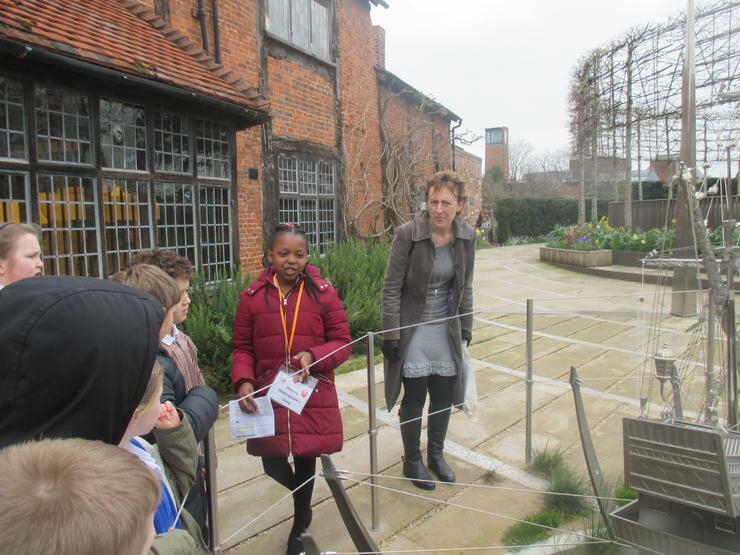 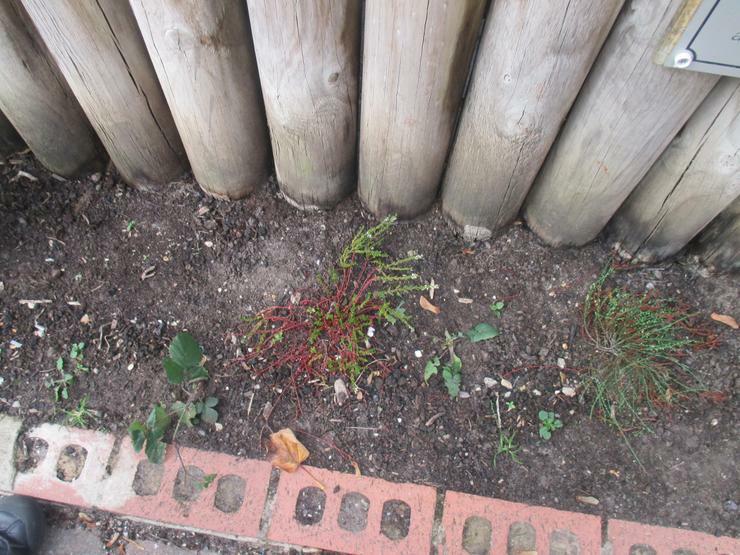 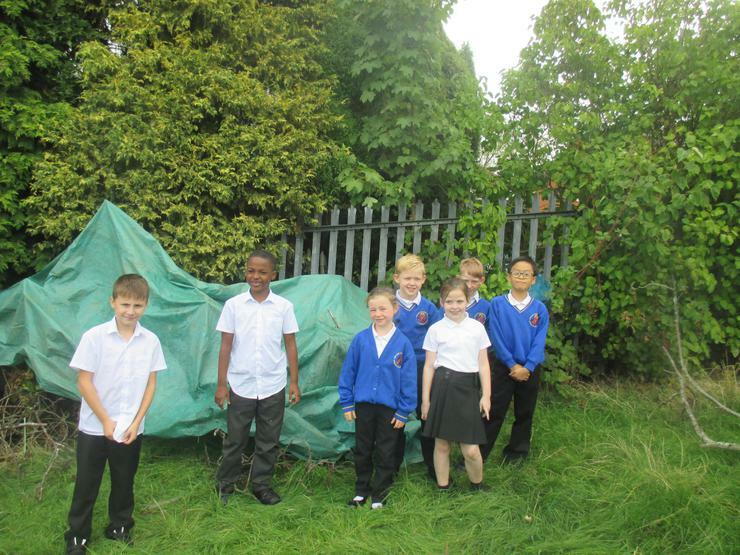 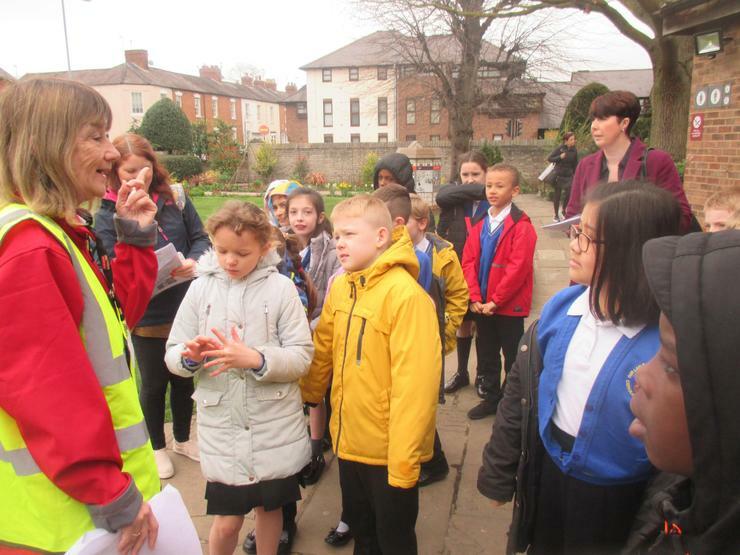 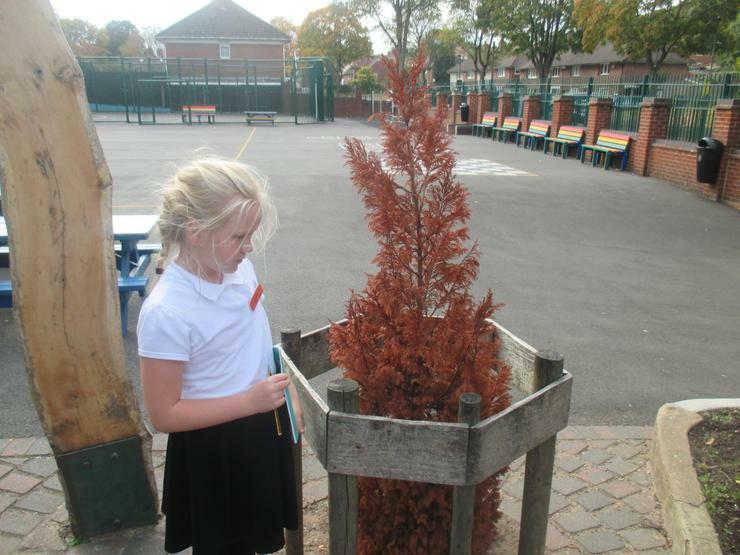 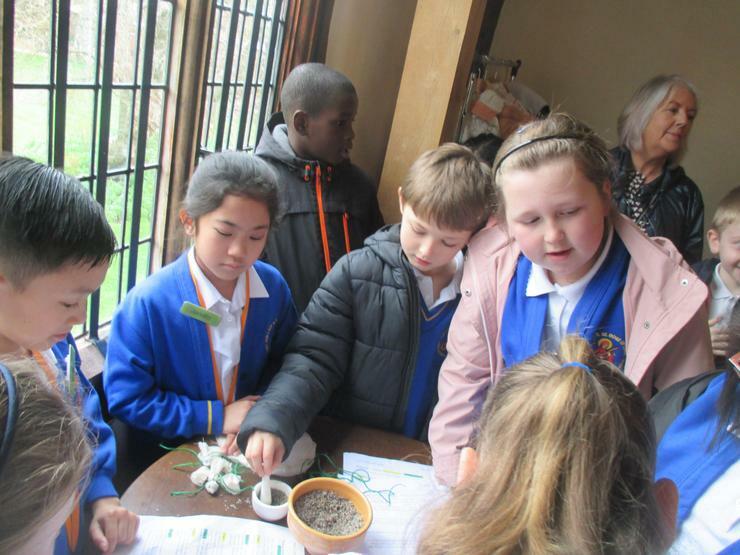 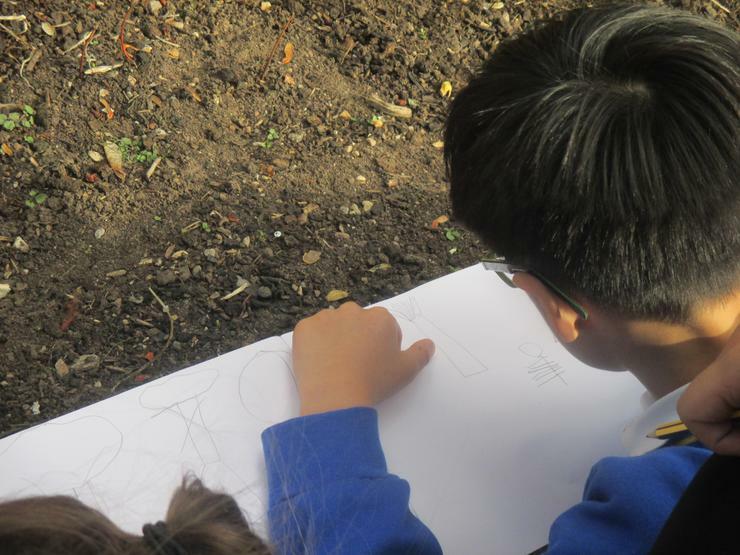 We took to the outdoors to explore the local environment and determine which British plants are growing around us. 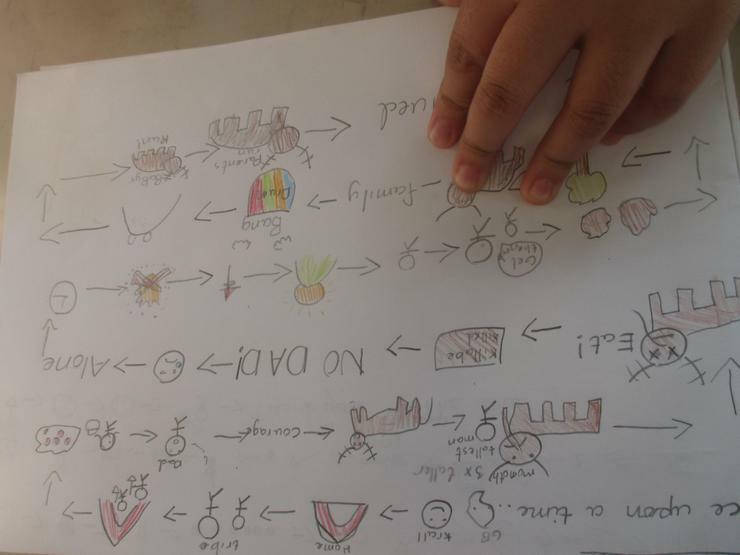 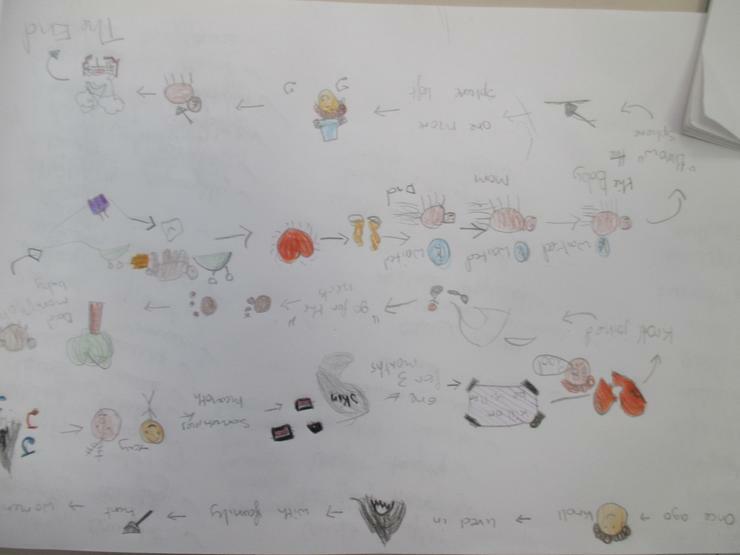 We sketched them and classified them using knowledge we had learned in the lesson. 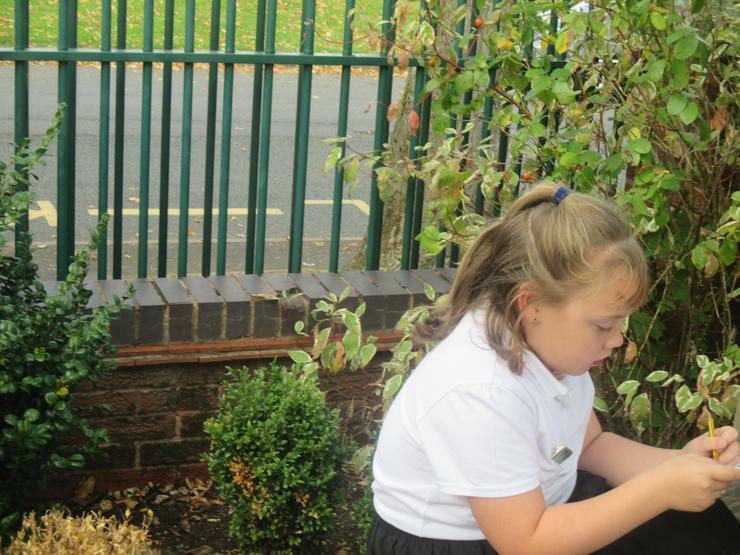 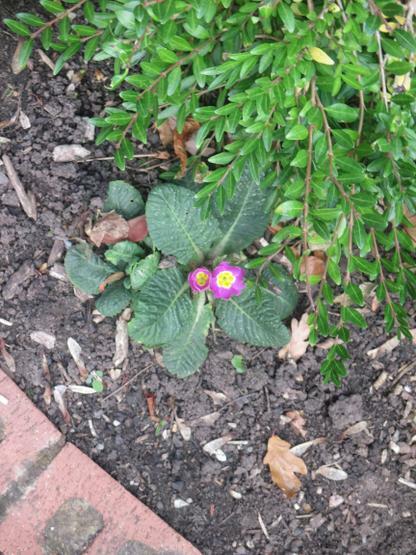 We were pleased to see such beautiful plants in our own school grounds and talked about the importance of looking after God's world around us. 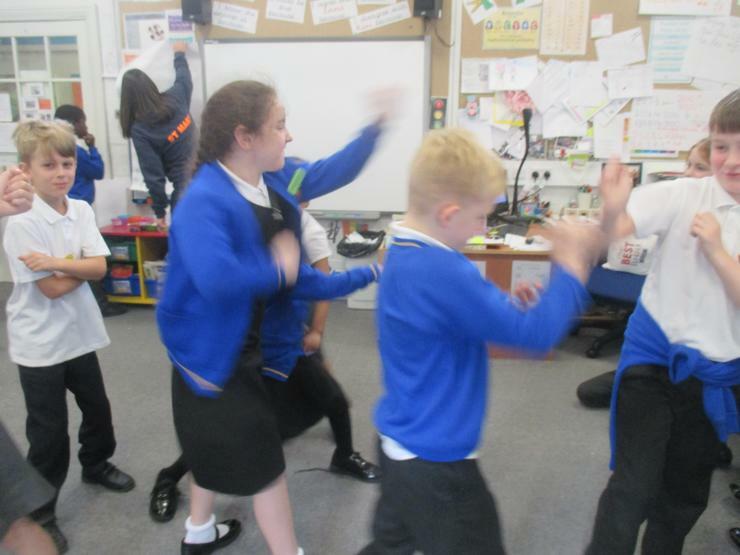 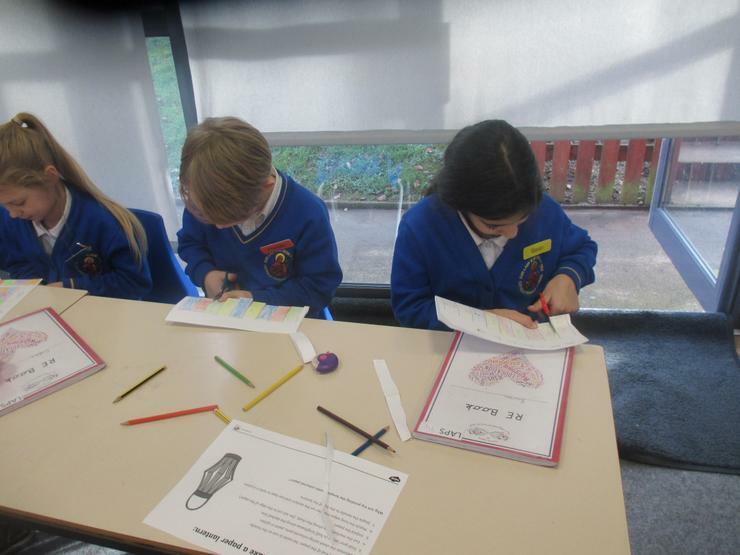 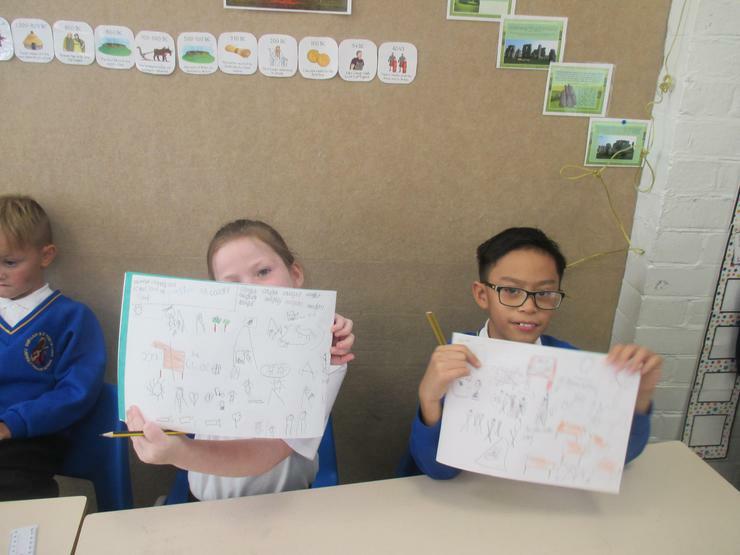 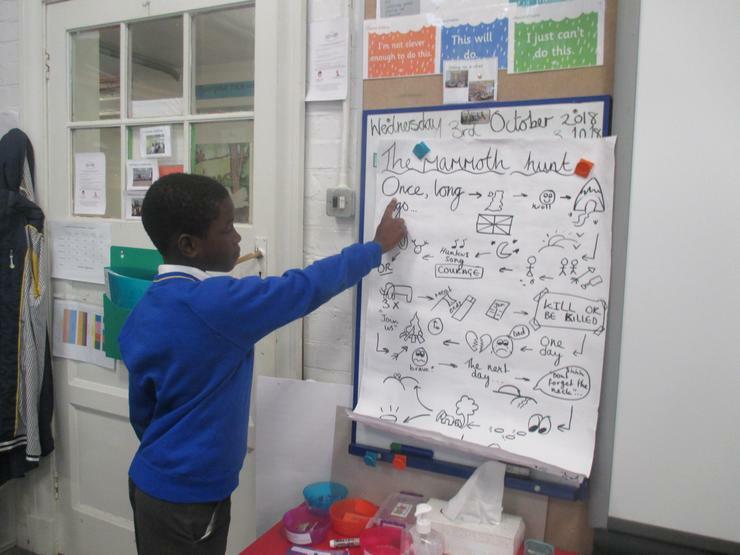 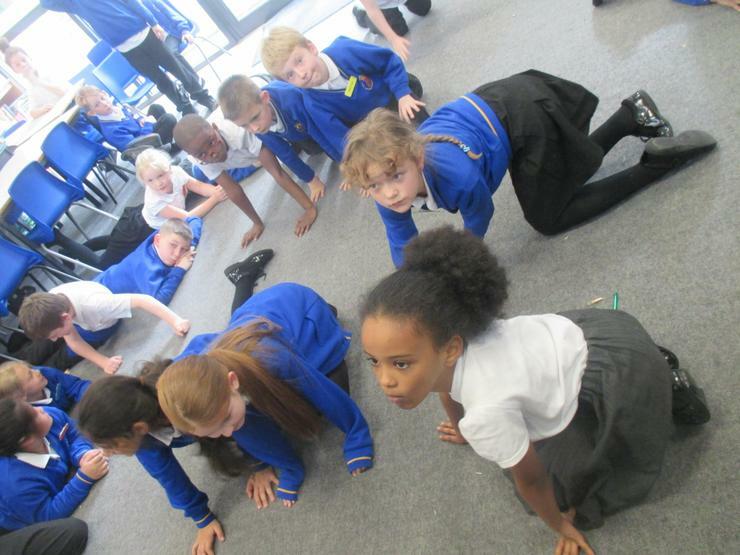 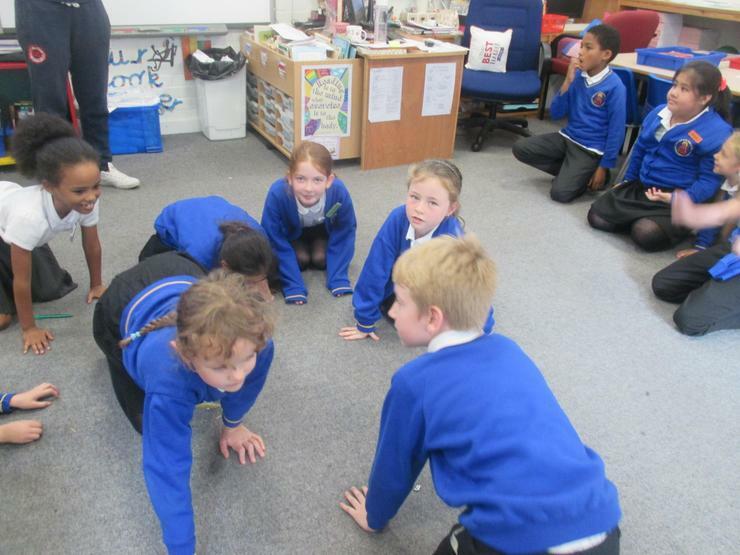 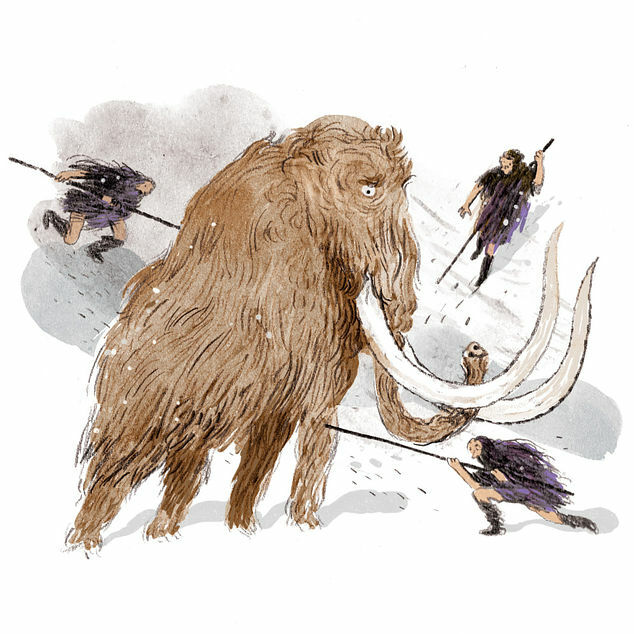 We have very much enjoyed learning our Oral Story - the Mammoth hunt. 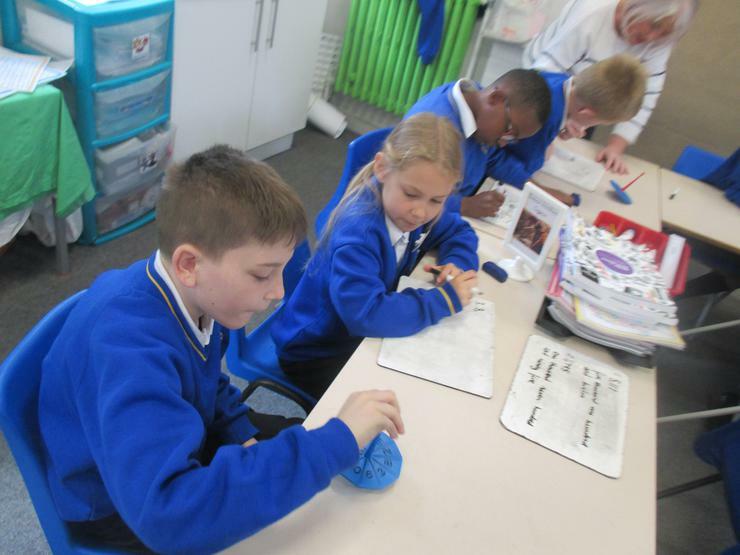 We are learning it by heart and doing lots of activities to help us with this. 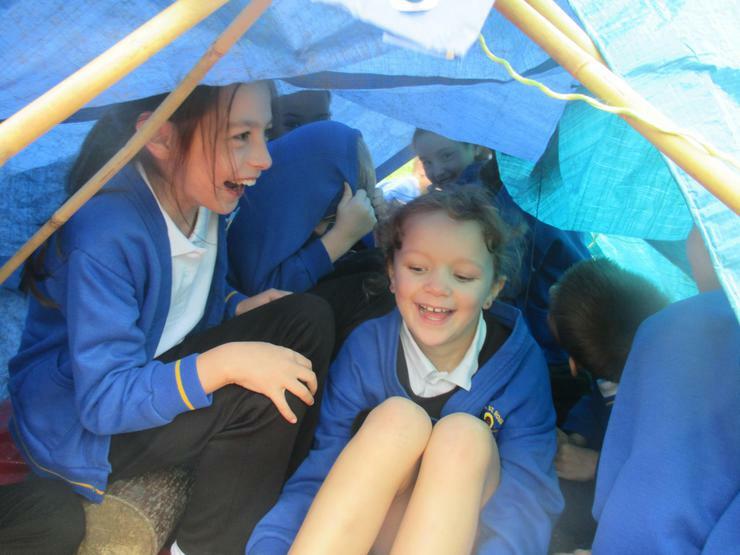 Our teamwork, oral language skills and confidence will all improve because of this! 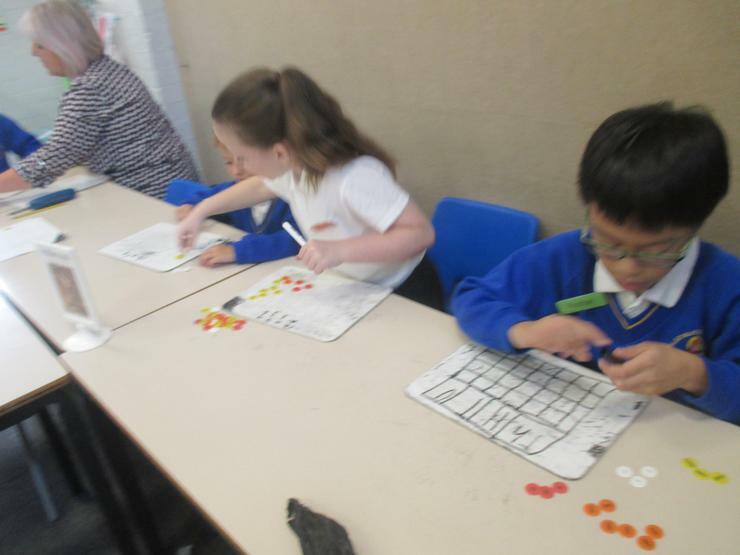 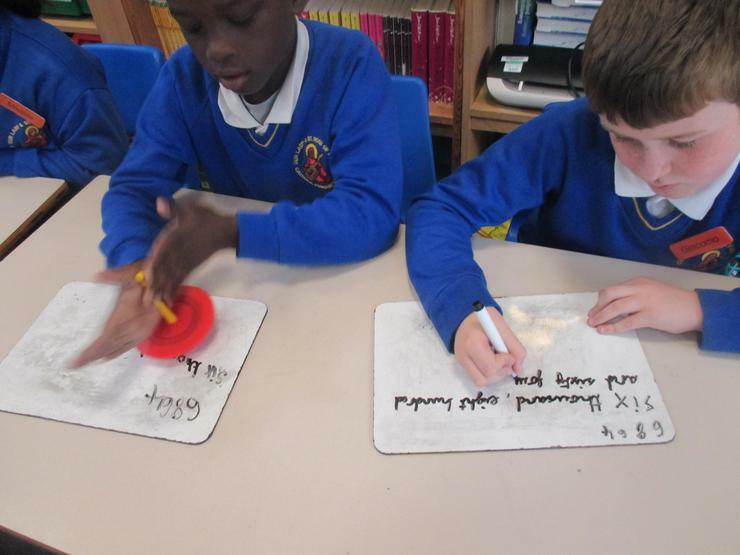 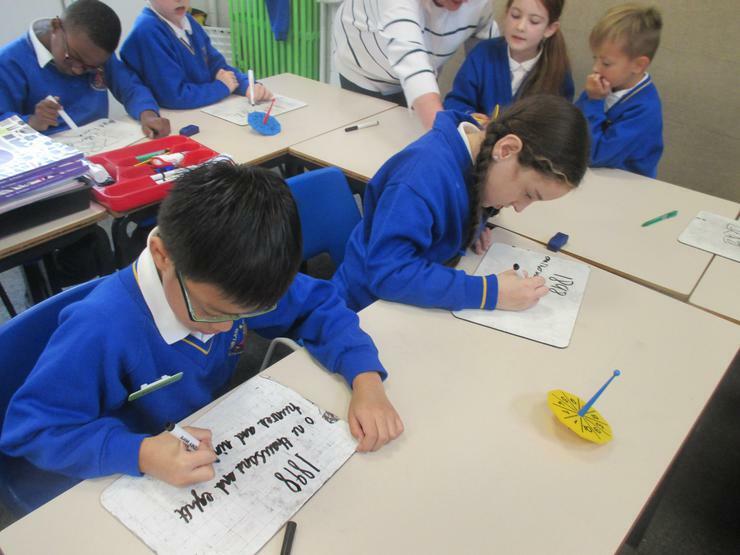 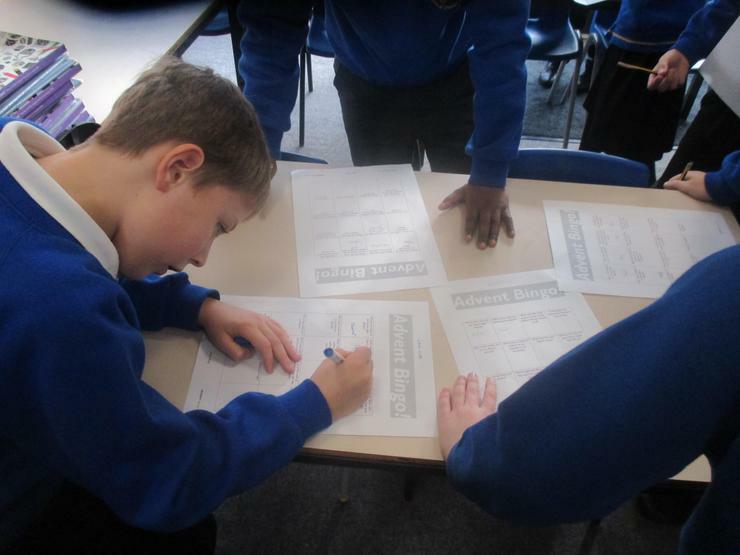 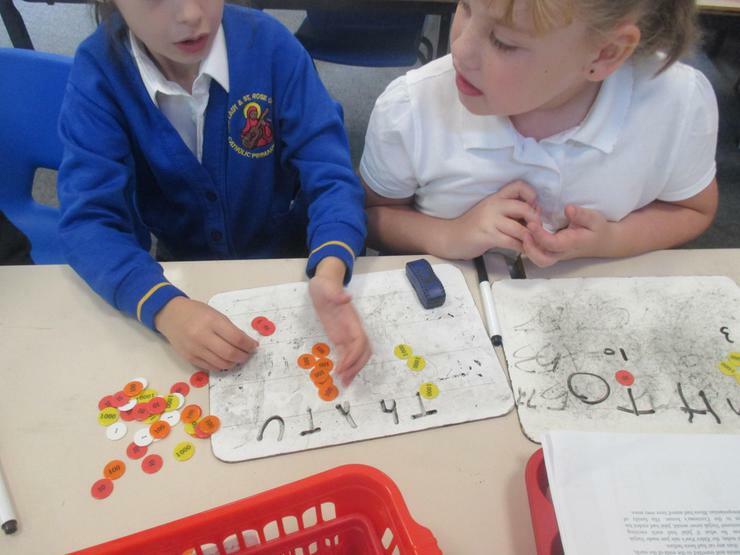 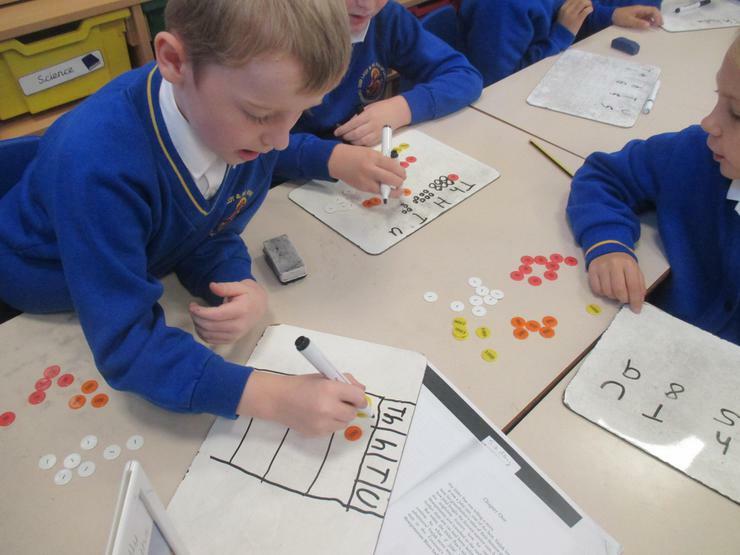 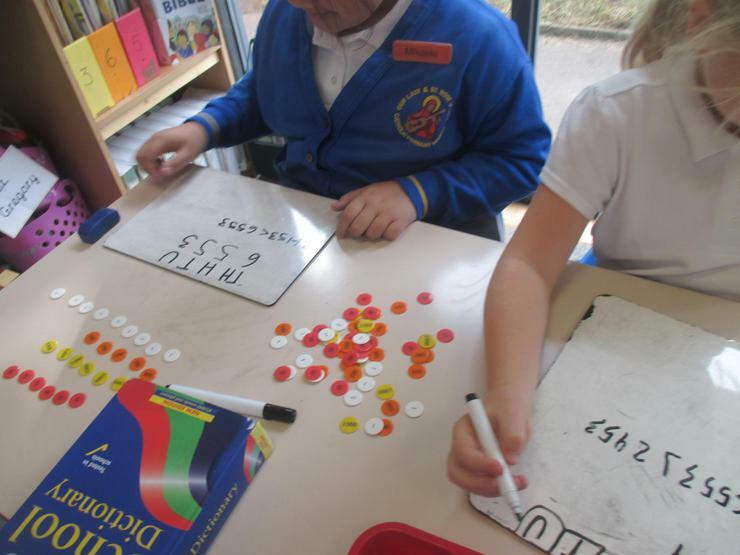 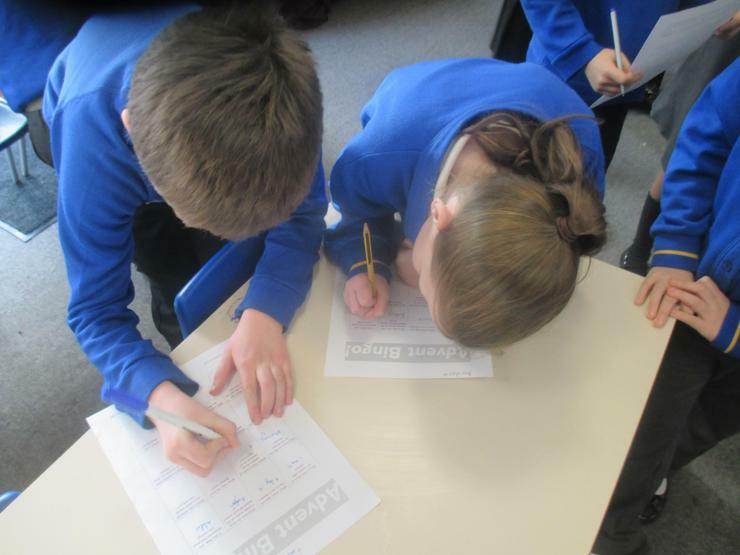 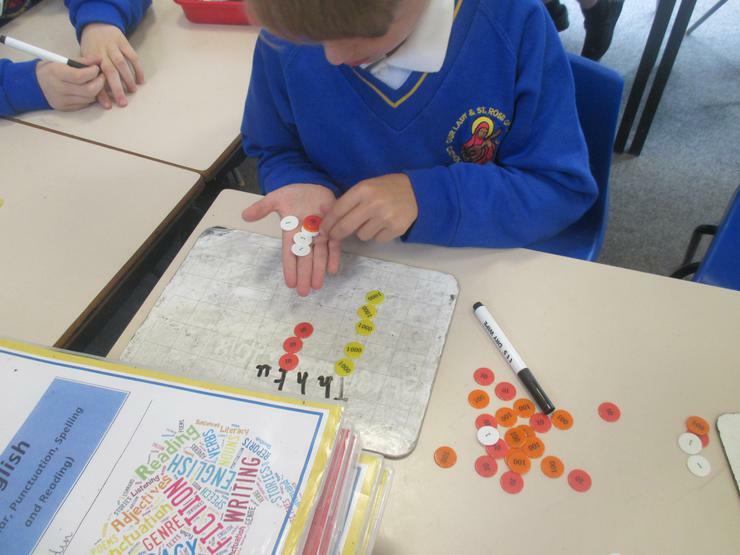 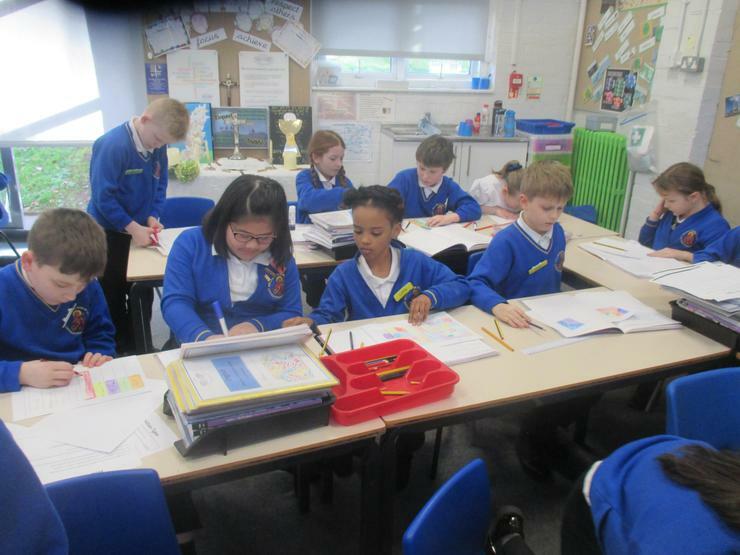 In Year 4 we work very hard on our problem solving skills during our Maths No Problem lessons. 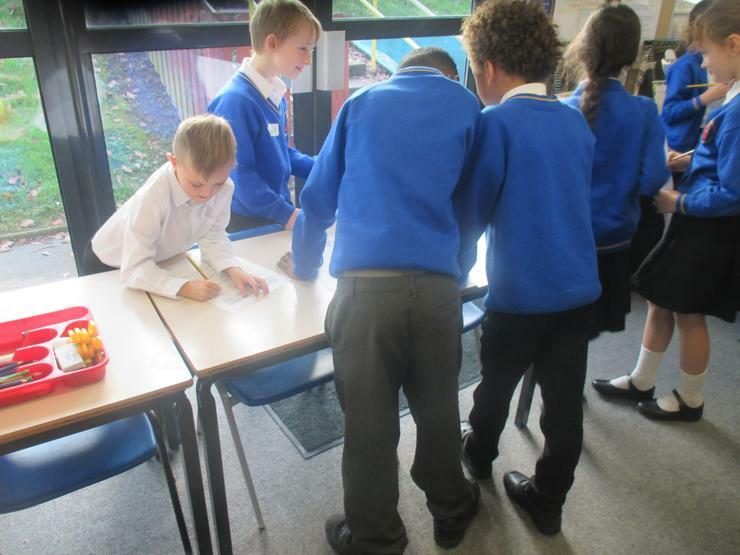 Using our virtues of being Curious, active and attentive we have worked together in groups to solve our problems practically! 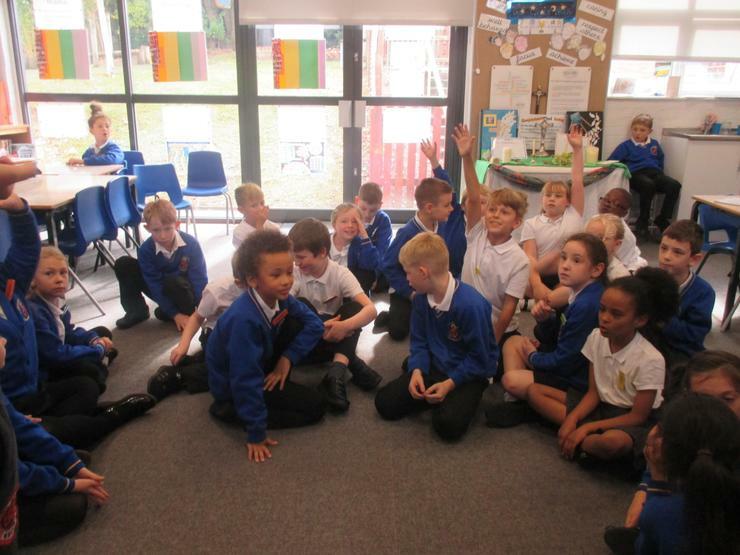 Today we were introduced to our new class novel - Stig of the Dump by Clive King. 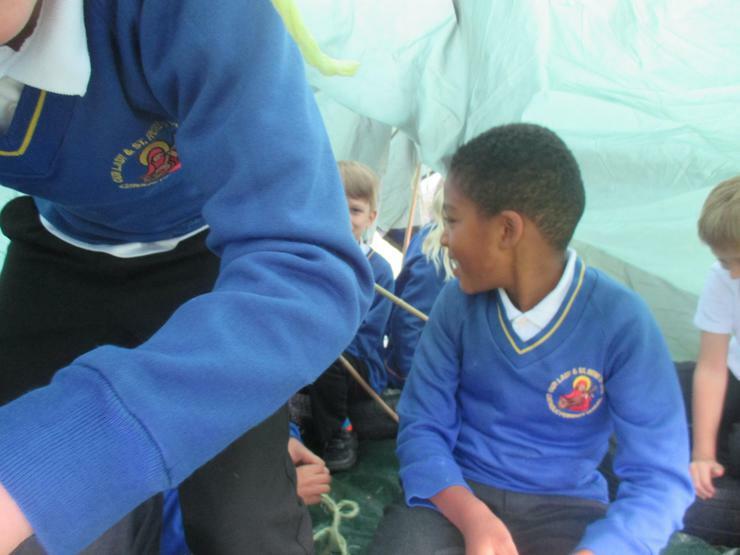 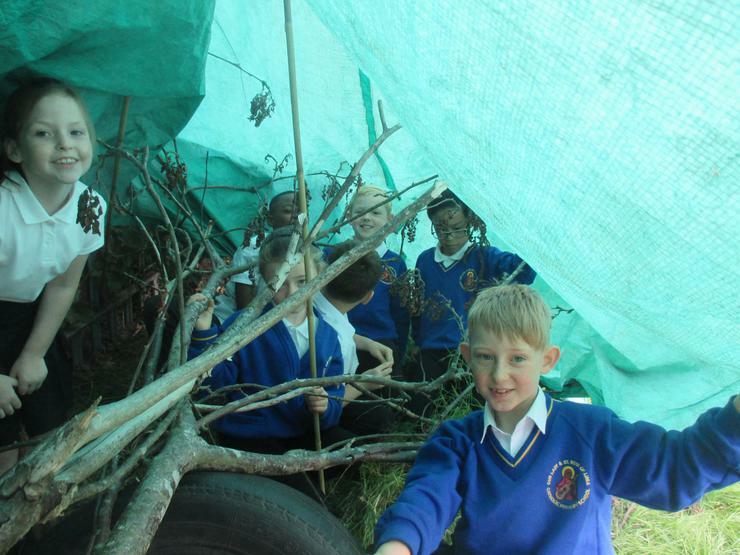 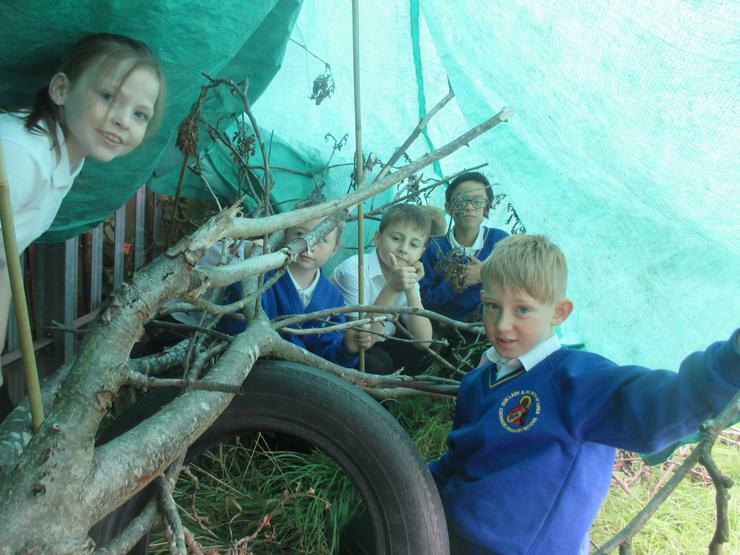 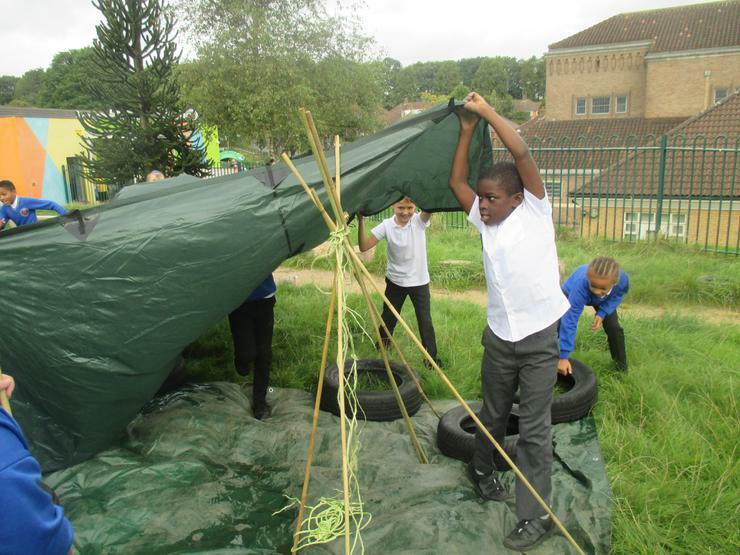 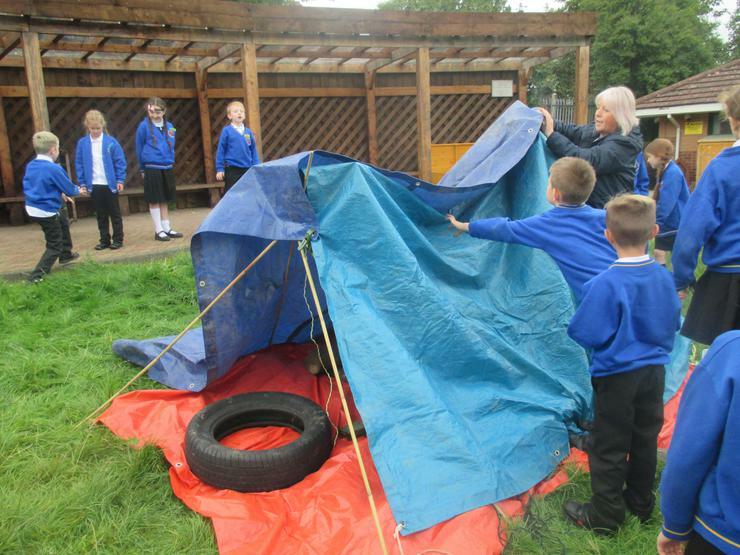 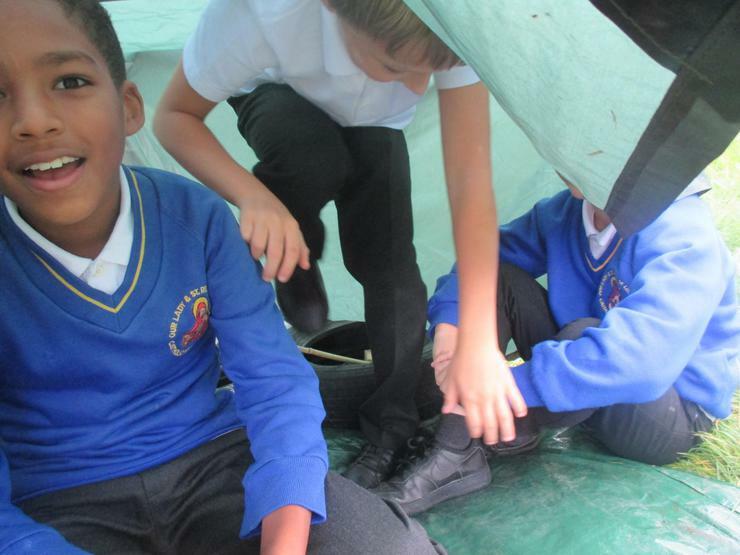 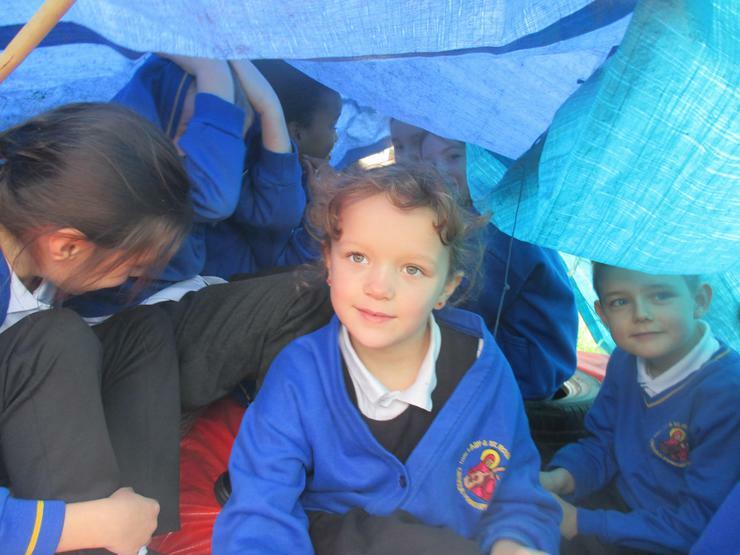 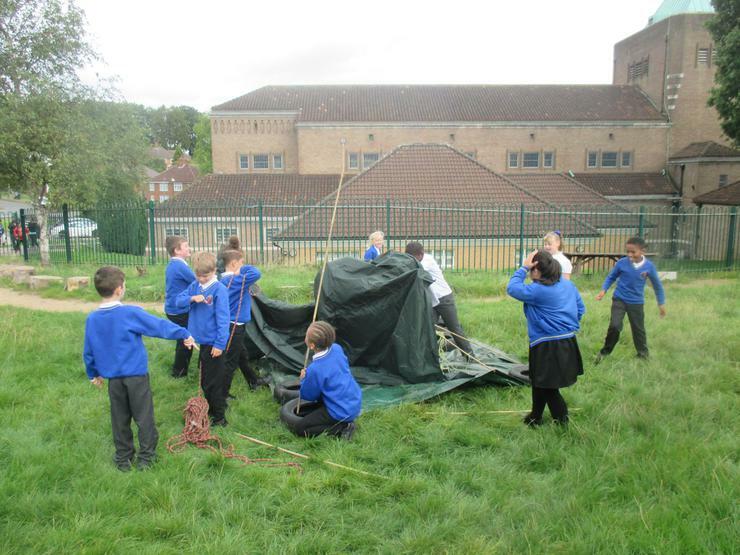 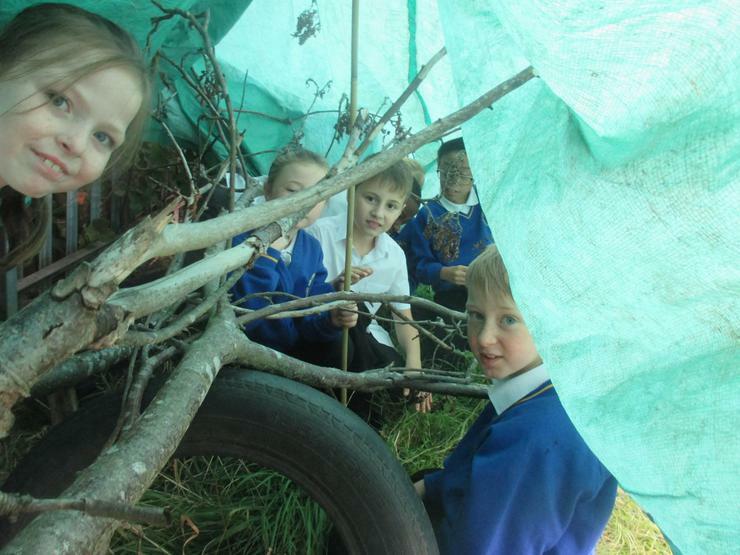 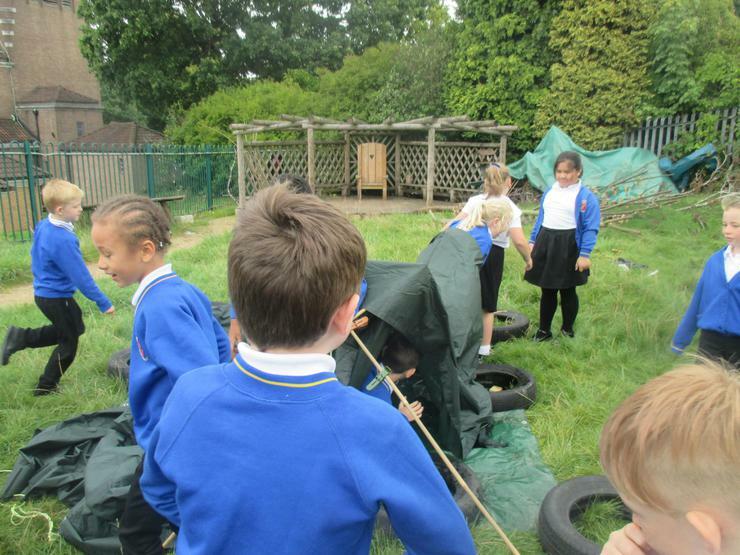 As an introduction, we set about designing and then building our own Dens using limited materials. 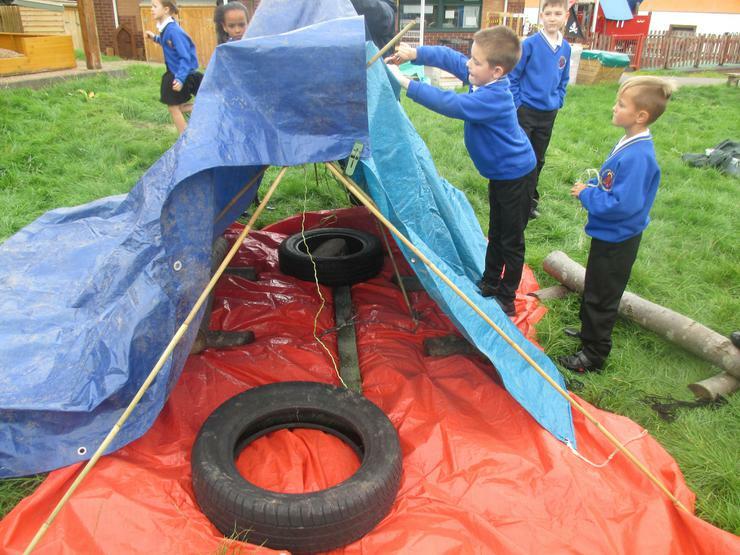 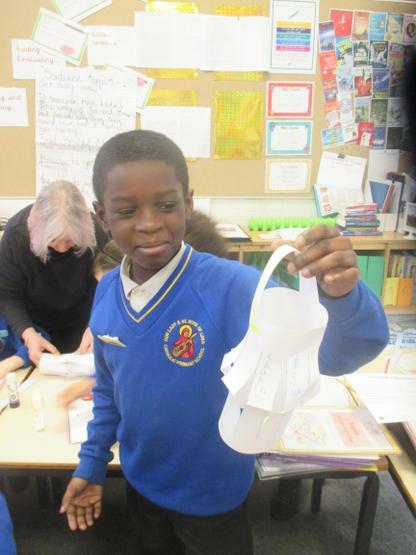 It helped our understanding of the story, by reusing items that we could find but also our team work skills. 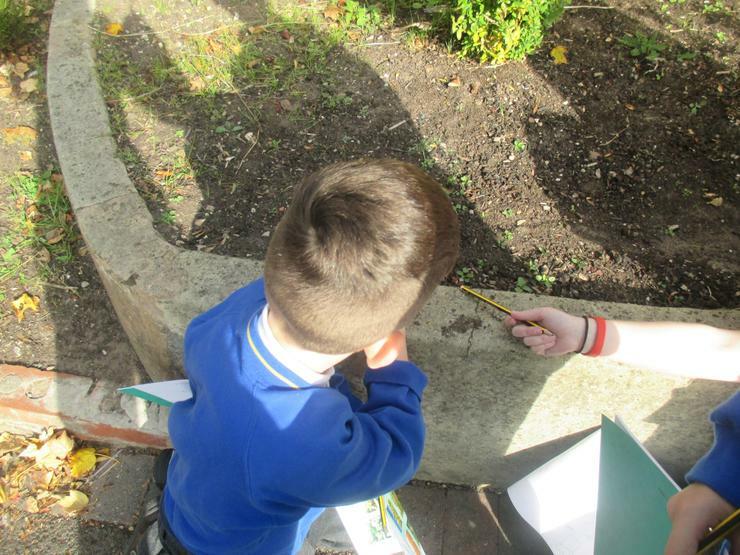 Miss Purcell tested they were sturdy and waterproof with a watering can and only a few drops made their way in!